Hello! 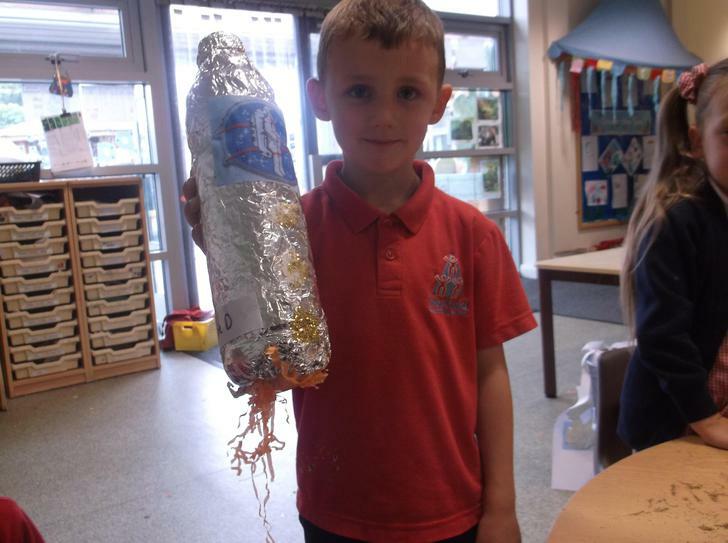 This week we have been learning all about space! We have enjoyed researching all about the different planets and the moon. 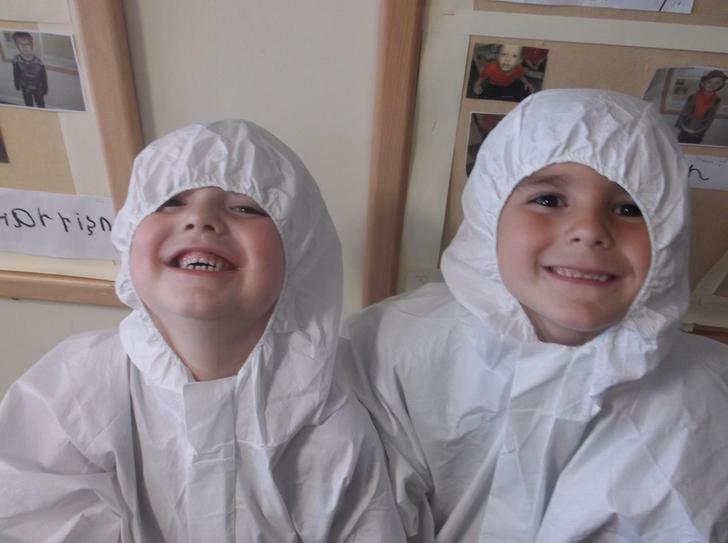 We have made some beautiful space pictures, some rockets and had lots of fun dressing up as astronauts pretending to go to space! Hello! 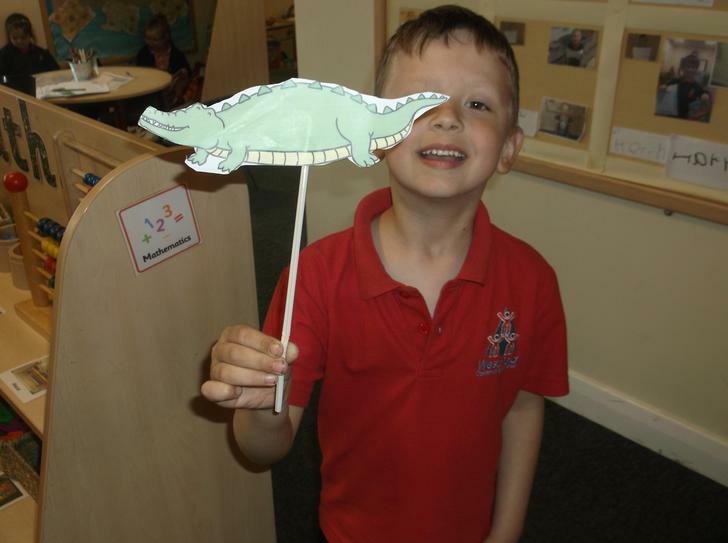 Come and see what we have been up to in Reception W this week! 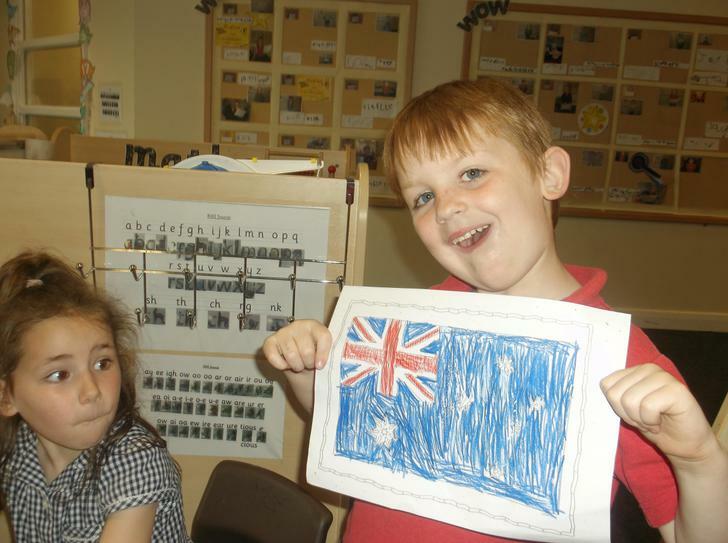 We have been learning all about Australia. 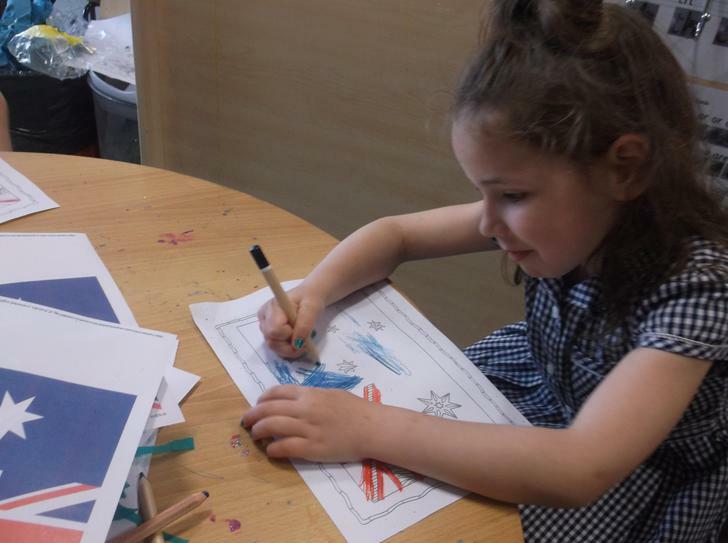 We started this week researching Australia and designing the Australian flag. 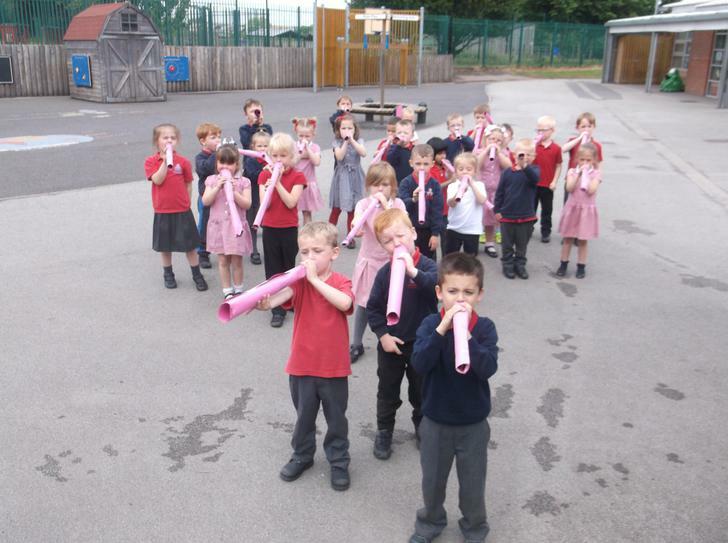 We listened to music created by didgeridoos and then designed and played our very own! 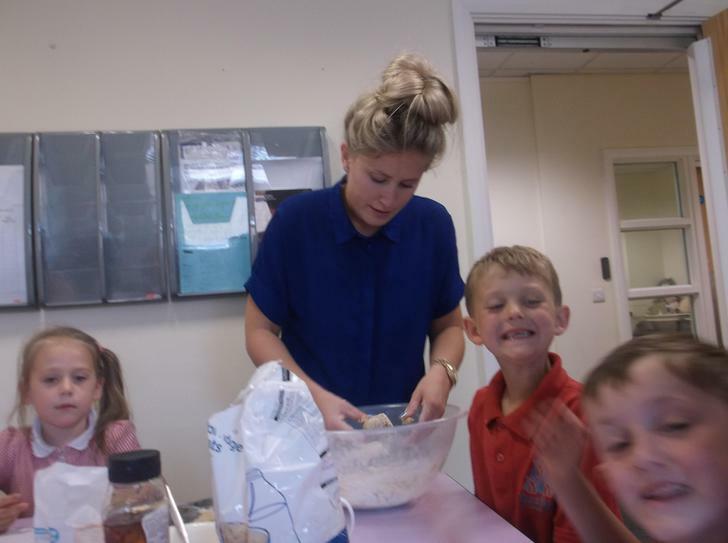 We baked our very own anzac biscuits. 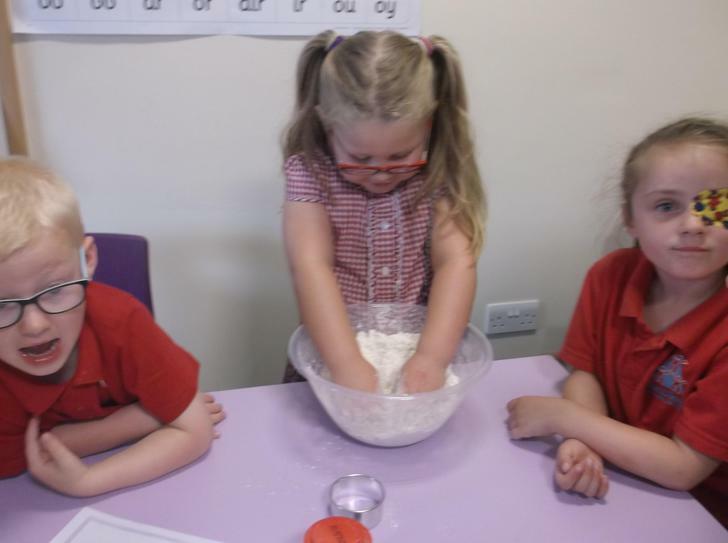 We had lots of fun adding the ingredients and mixing it all together before putting it on the trays to bake. 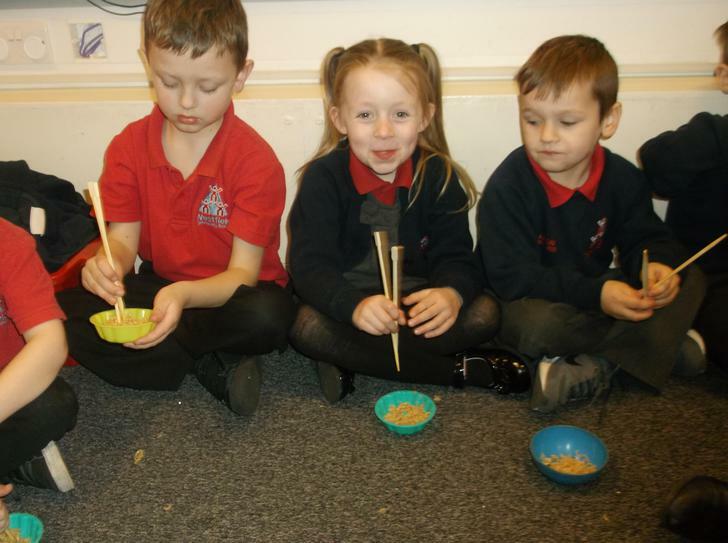 We loved tasting them afterwards the most! We finished the week creating our very own Aboriginal art pictures. 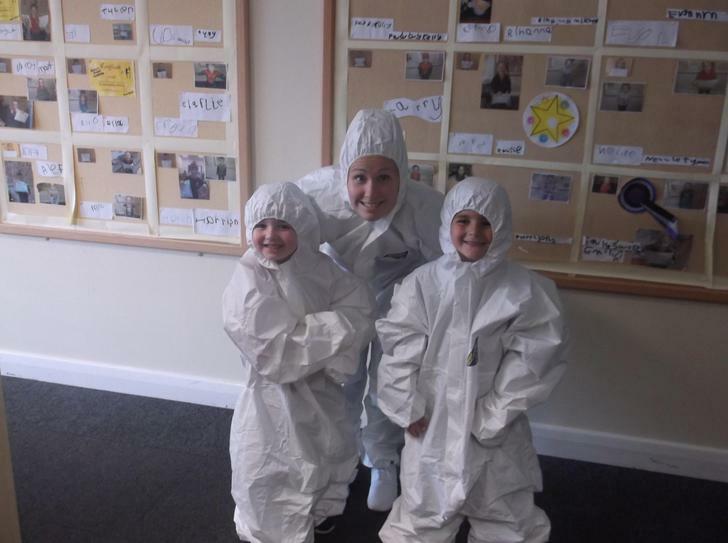 Come back next week when we are going to be learning all about space! Hello! 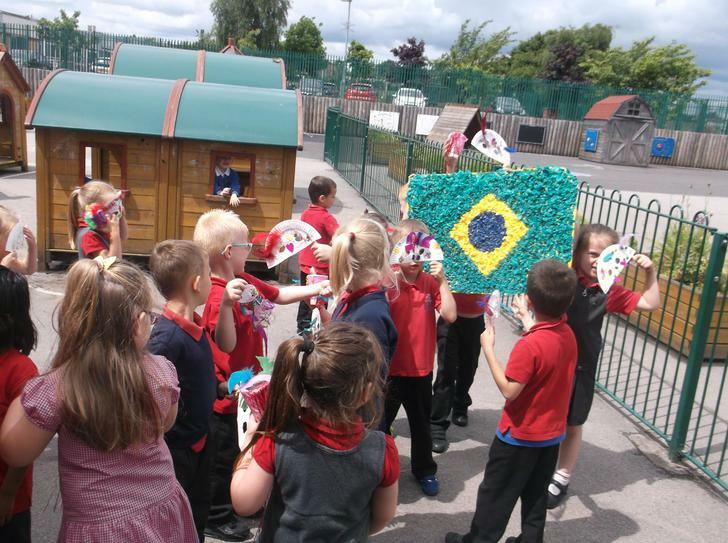 This week we have continued our around the world topic and we have been learning all about Brazil! 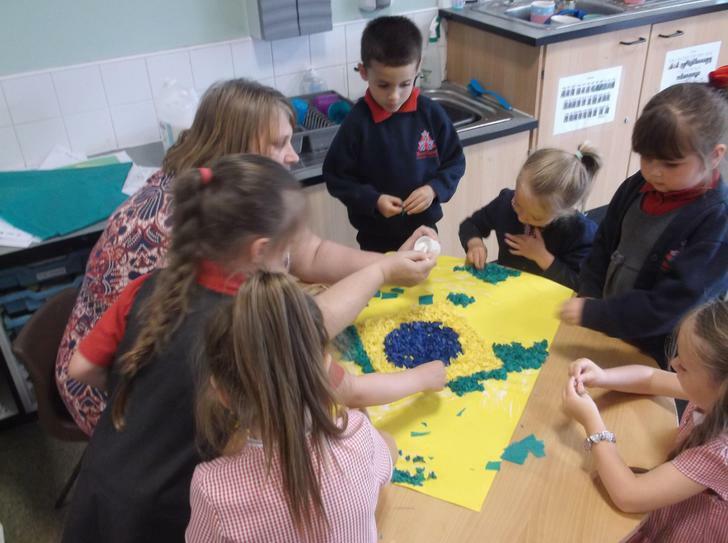 We started the week by making our very own Brazilian flag. 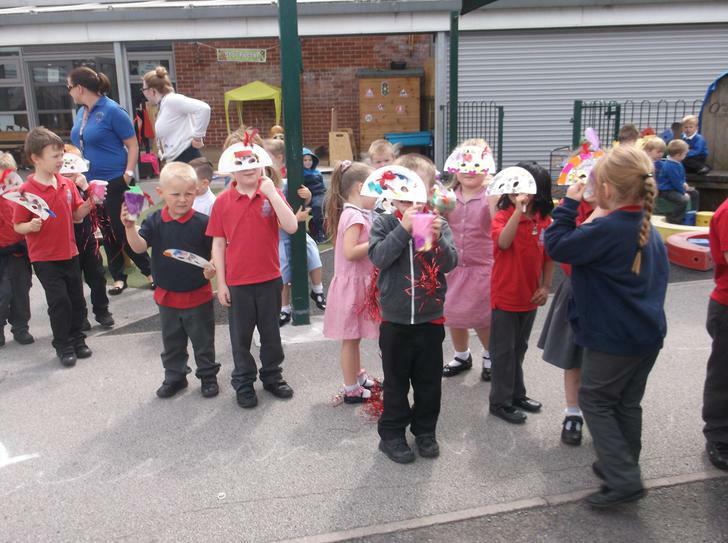 We created masks and shakers to wear at our Brazilian carnival. 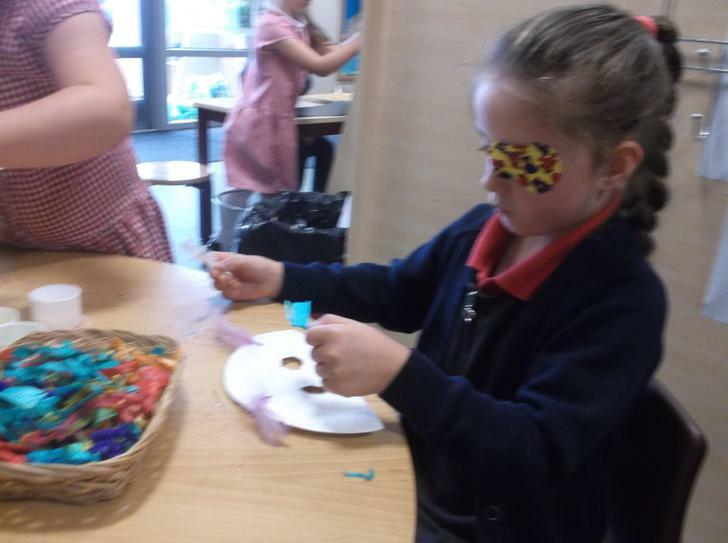 We really enjoyed using the feathers gems and glitter. 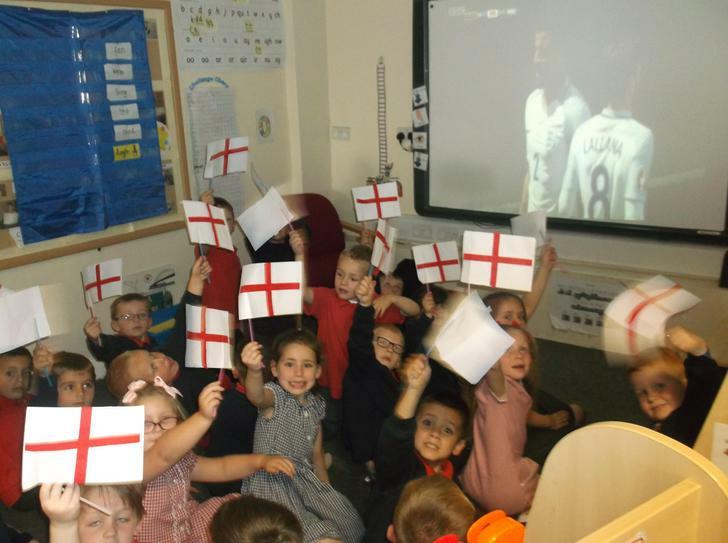 On Thursday, we watched the England football game! 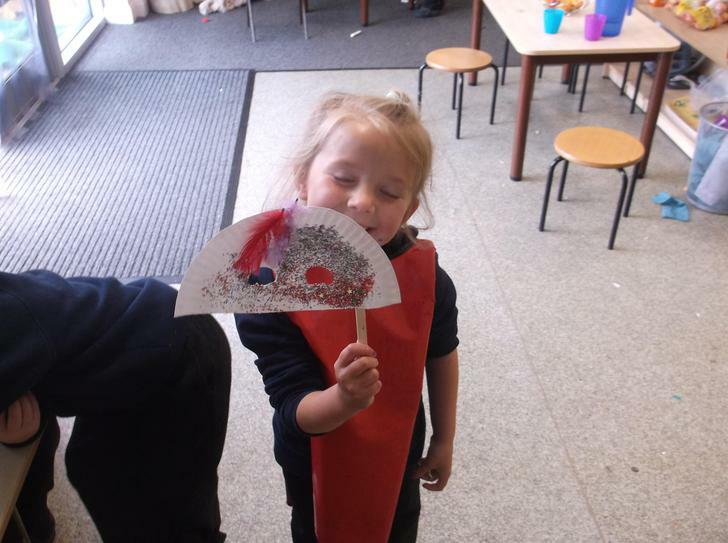 We made flags and hats to wear to support the team and really enjoyed cheering them on. 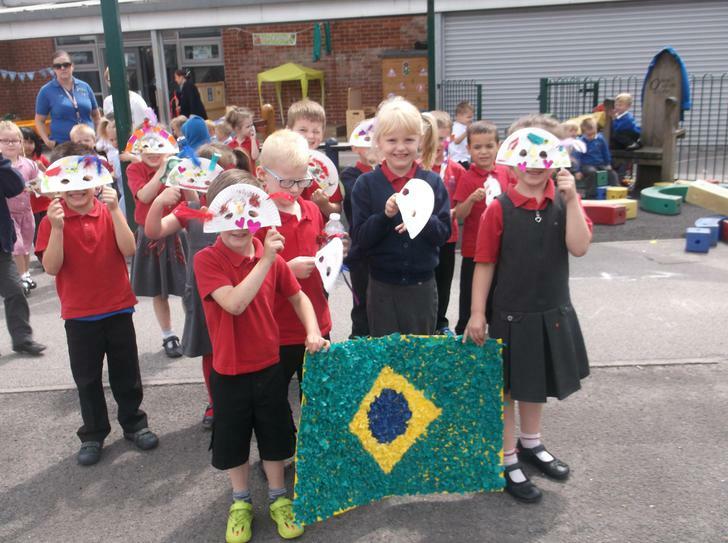 We finished the week of celebrating at our Brazilian carnival! 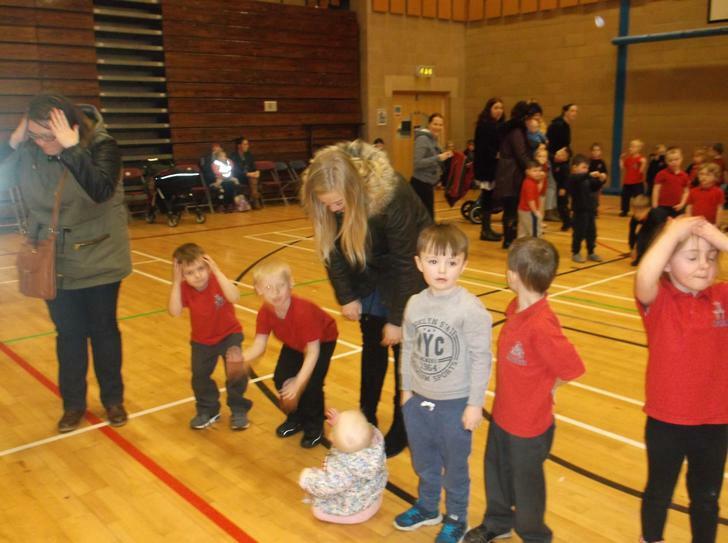 We danced and sang and then had a special treat and watched Rio the film in the big hall with nachos. Come back next week when we will be learning all about Australia. Hello! Welcome back. 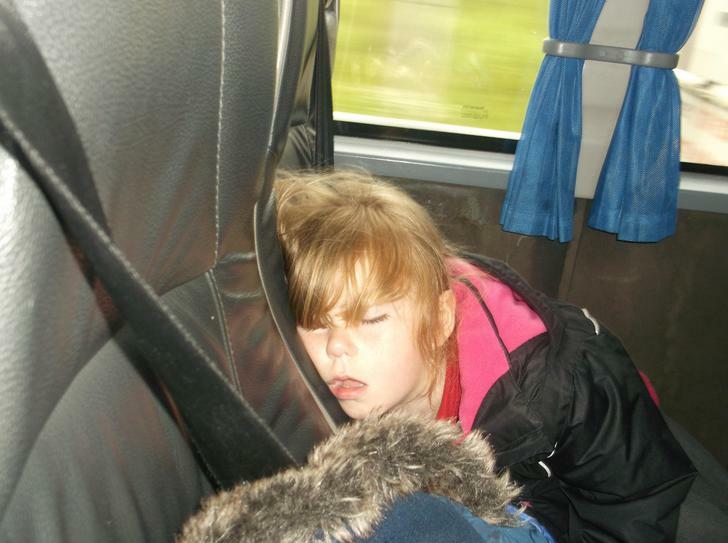 We hope you all had a lovely half term break. 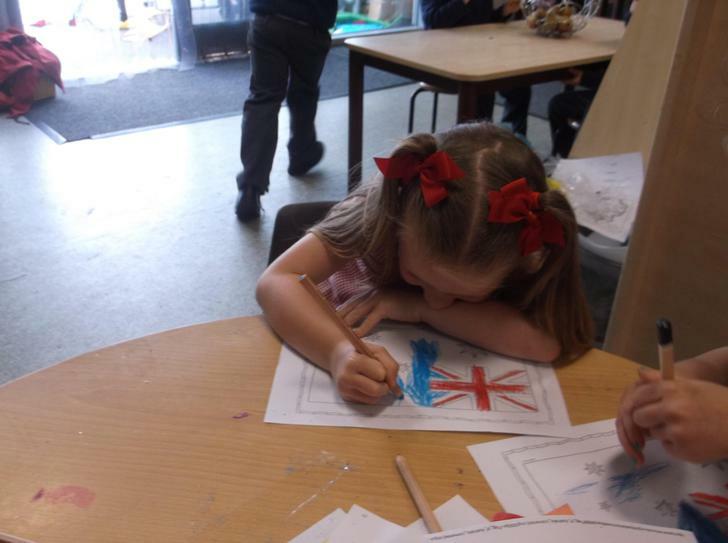 Over the last few weeks we have left in Reception, our topic is focusing on different countries from around the world. 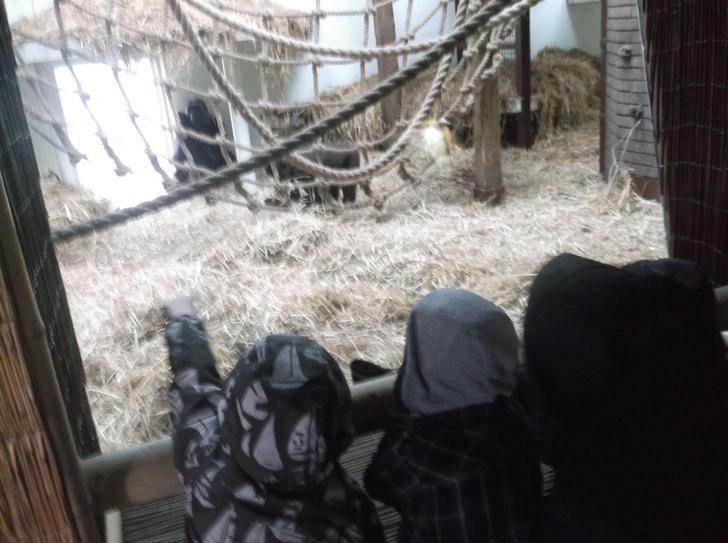 We are going to be looking at different cultures and ways of life and also various factors such as foods, animals, weather and also features of the different environments. We have started off with our very own country this week, England! 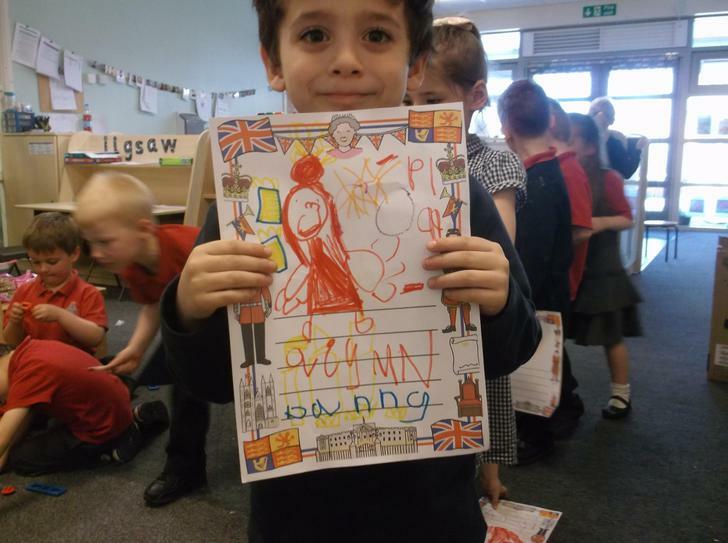 We have looked at our capital city and done lots of talking about the queen! 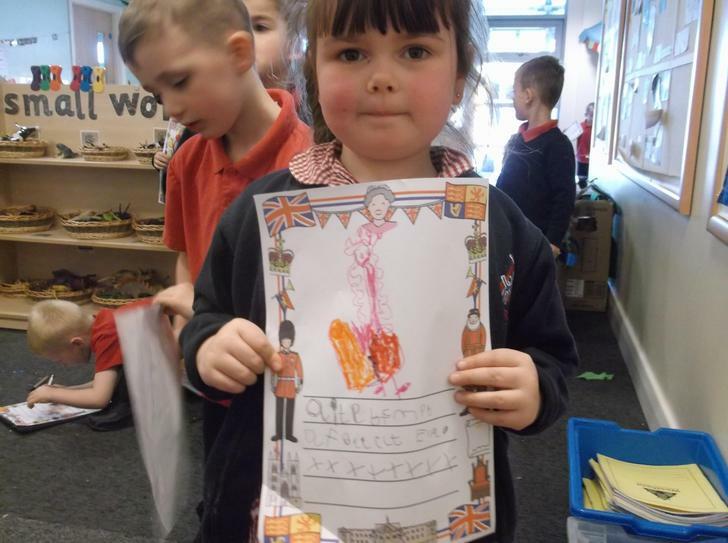 We started the week drawing pictures of the queen and sending her invitations to our tea party. We made our very own scones from scratch! 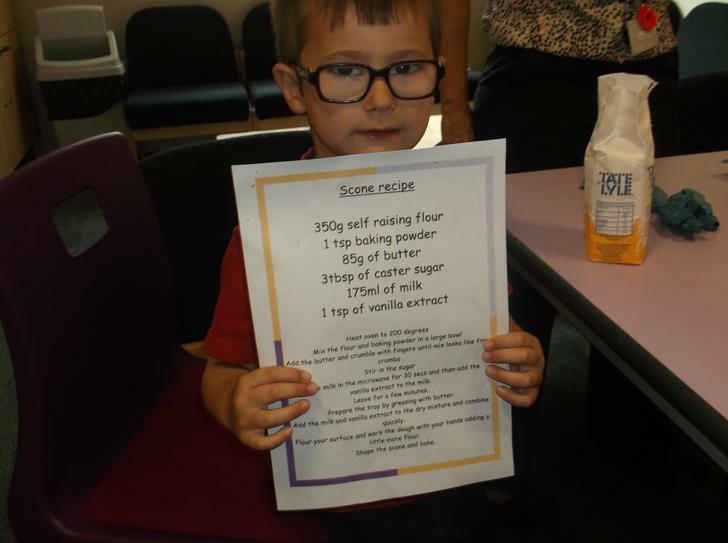 We had to read the instructions with all the ingredients very carefully to make sure we measured everything out right. 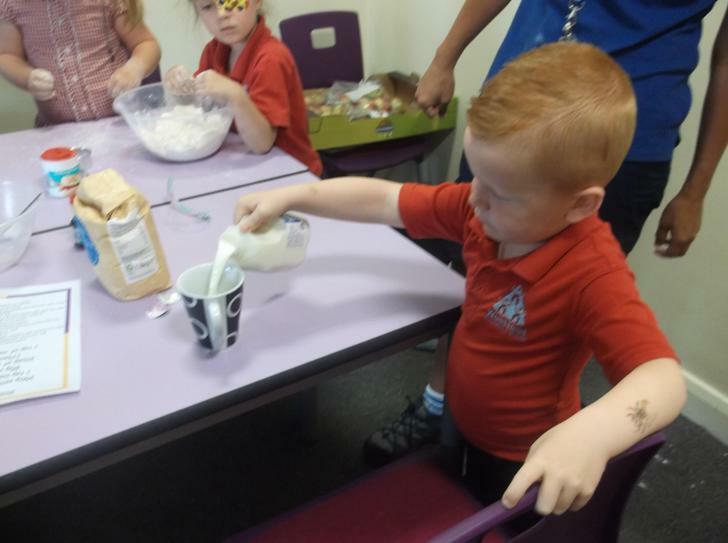 We enjoyed getting our hands dirty when we mixed the ingredients! 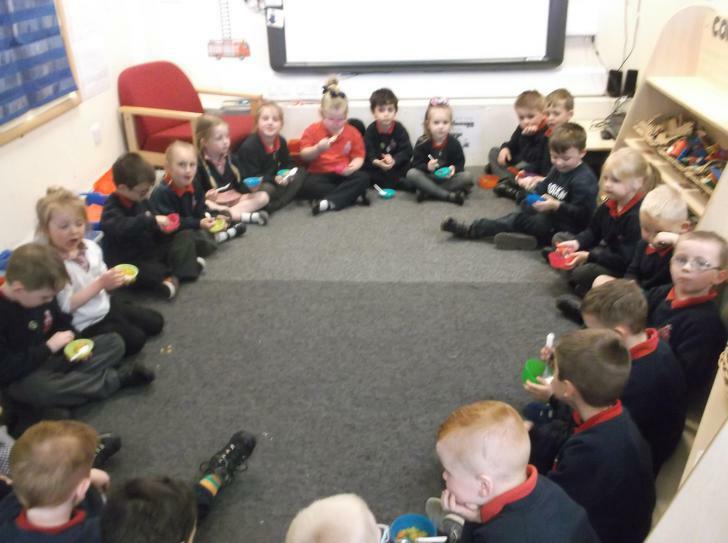 On Friday we had our very own tea party! Unfortunately, the queen couldn't attend this time but i'm sure she can fit us in her busy schedule another time! 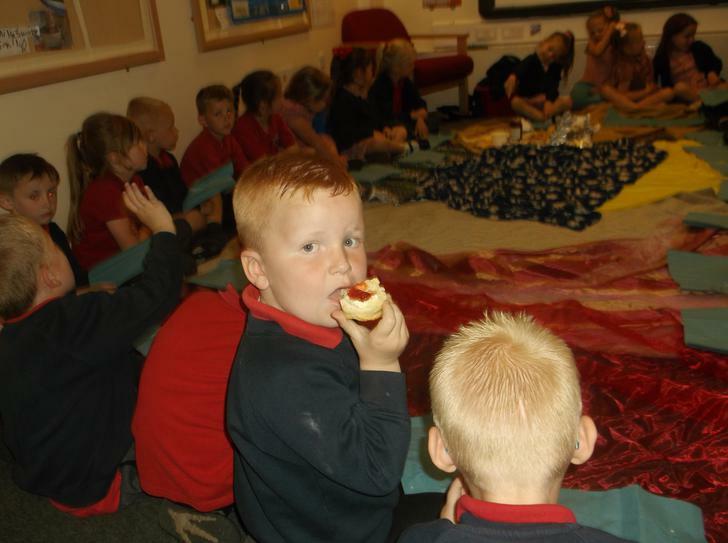 We really enjoyed eating our scones with jam and cream and had a party to celebrate the queens birthday with lots of dancing and games. Come back next week and see what we have learned about Rio! Hello! 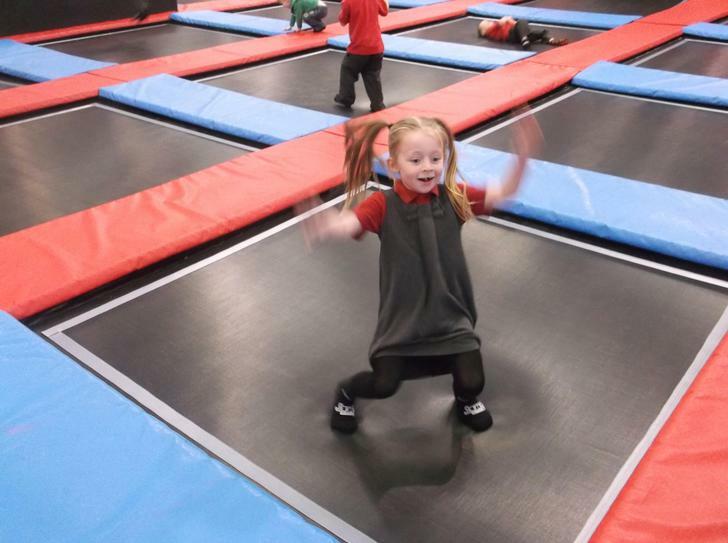 We have had a very busy week this week but we have done some really amazing and fun things! Thank you to you all for donating for our Race for Life. 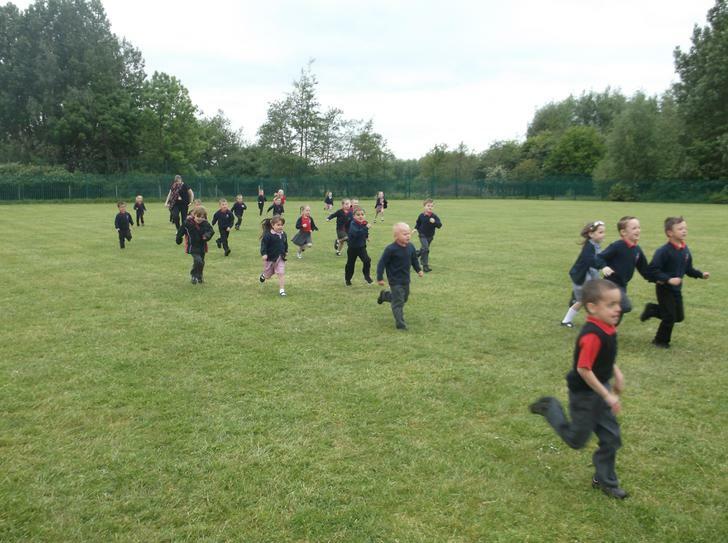 The children were amazing and completed two full laps of the school field! 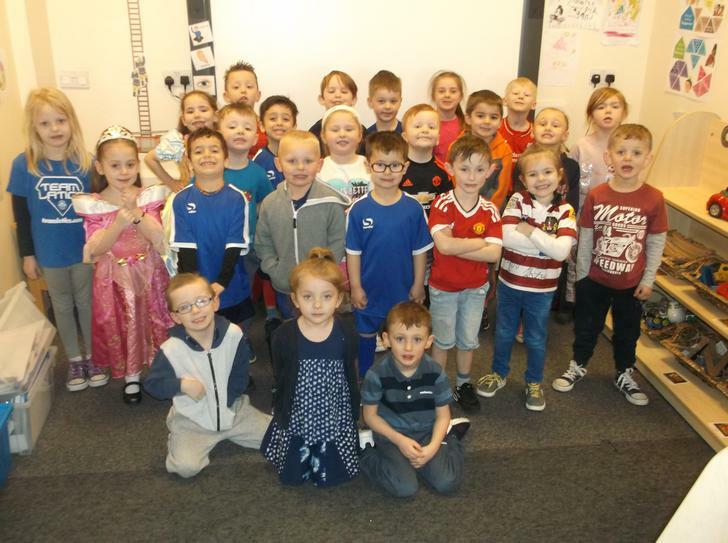 The grown ups were very proud of us raising all that money for charity. 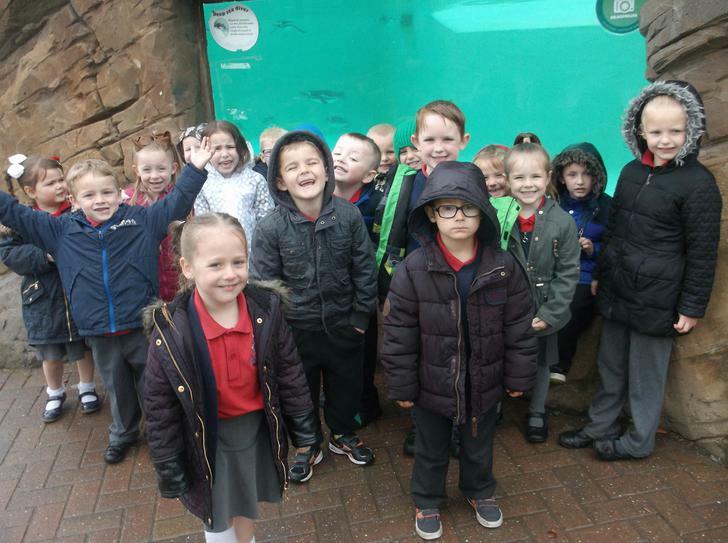 We had the best time ever at Blackpool Zoo! The weather cleared up for us too! 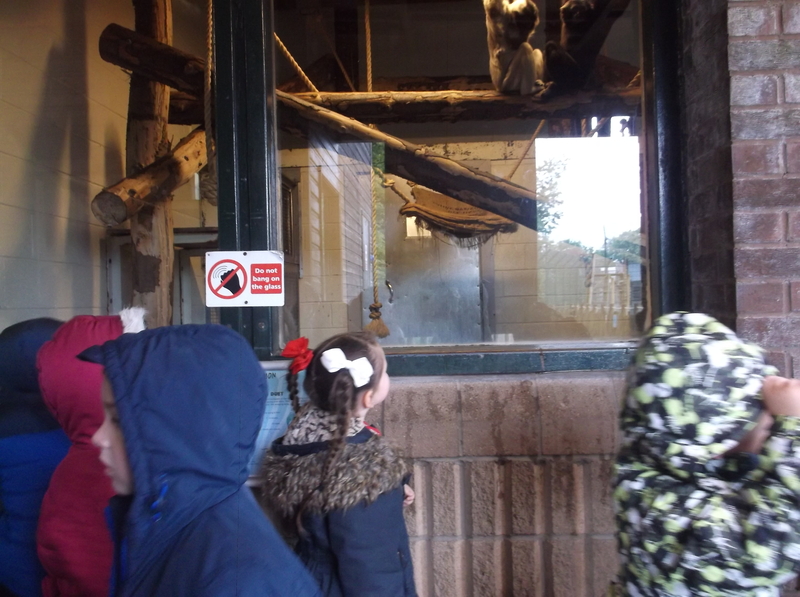 We saw so many different animals and Miss Gray nearly swapped us for a monkey! We hope you have a lovely half term break and we will see you on the 6th June! Hello! We have been learning all about Peter Pan this week in our class, come and see! 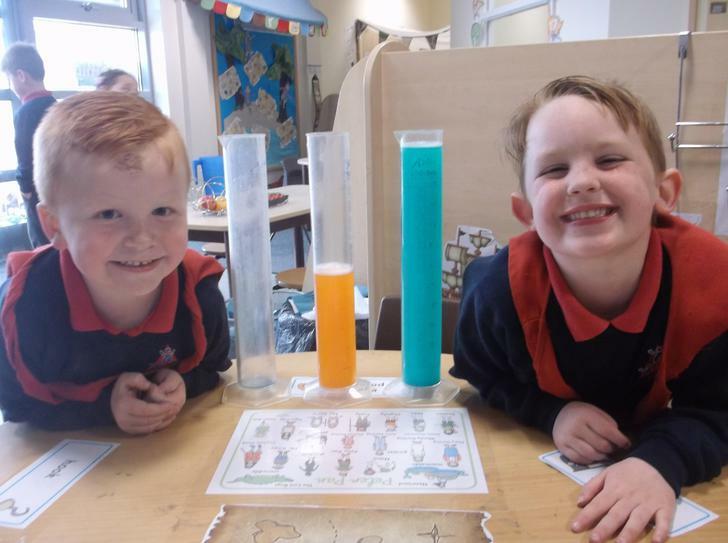 We started the week having a look at capacity and measuring out Captain Hook's pirate potions! 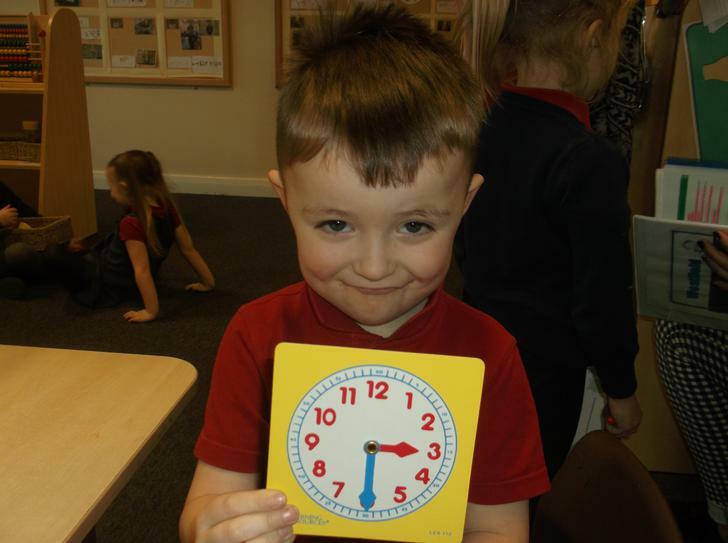 We played 'what time is it Captain Hook?' and really enjoyed learning all about the time. 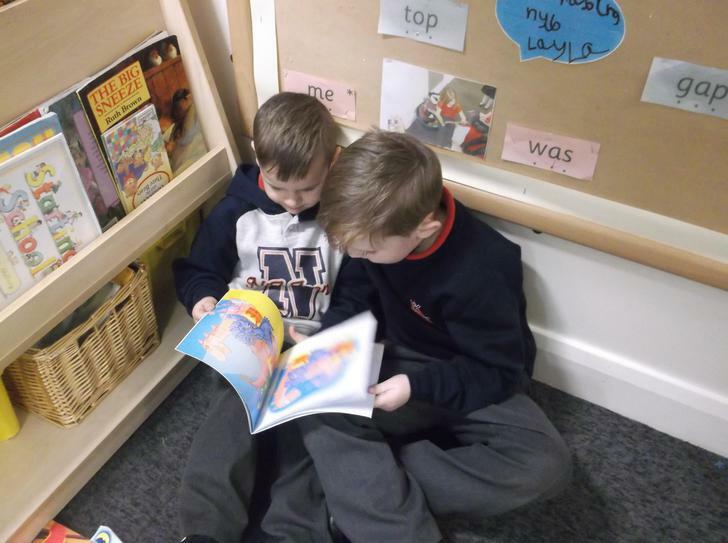 We have been spending lots of time in the reading area with our friends and the grown ups have been so proud of how good we are at reading all the words now! Keep it up girls and boys! 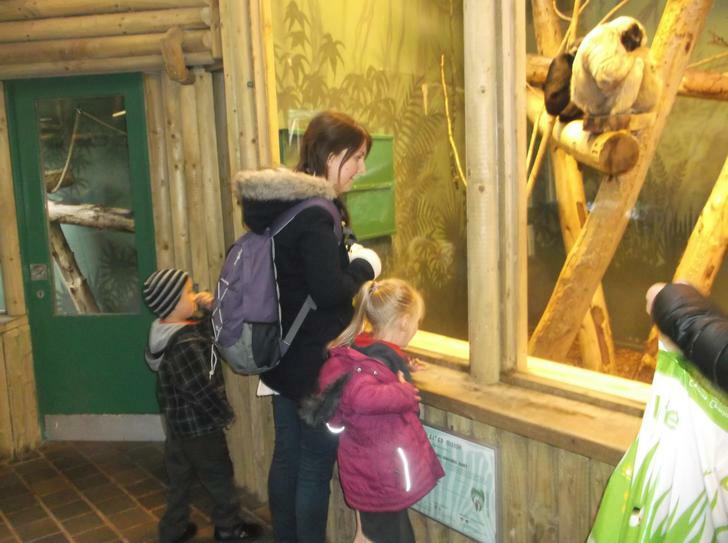 Next week is our trip to the zoo! 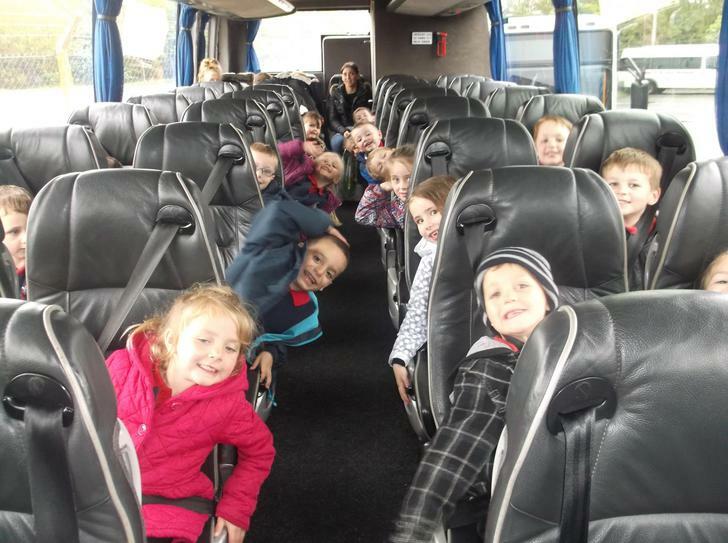 We are so very excited, grown ups included! Come and have a look at our pictures next week! 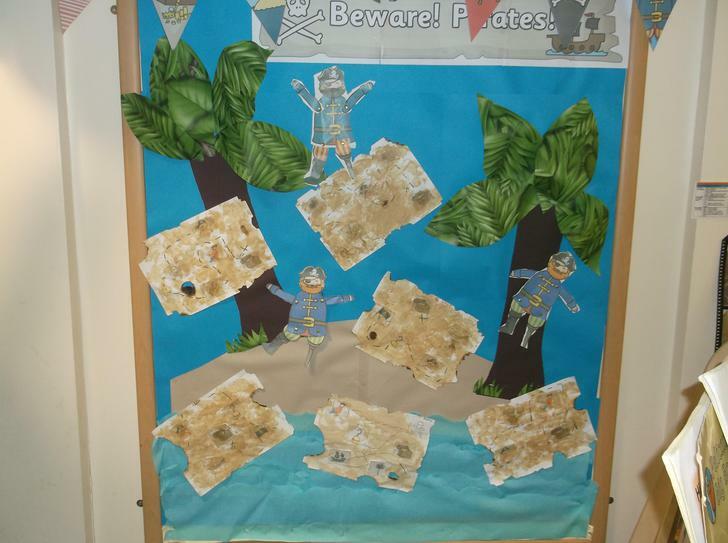 We started this week reading the story of the Beastly Pirate and a story about a smelly pirate! 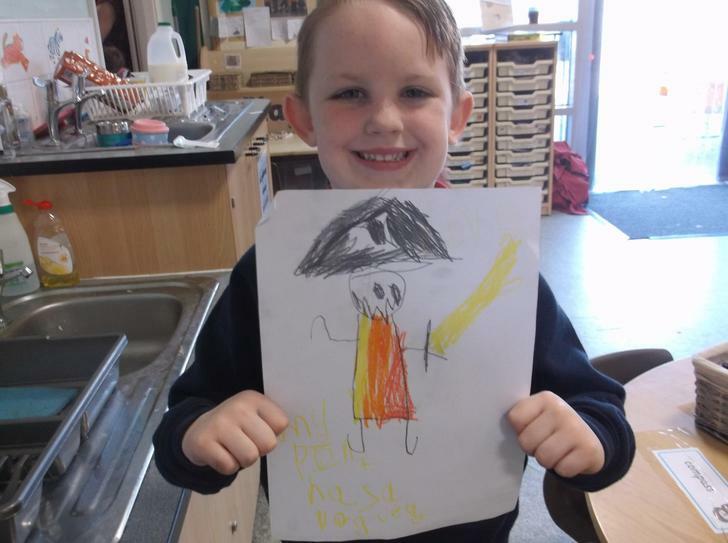 We drew pictures of ourselves as pirates and wrote about things we would need. Look at Evans writing! He has used finger spaces and full stops! Well done! 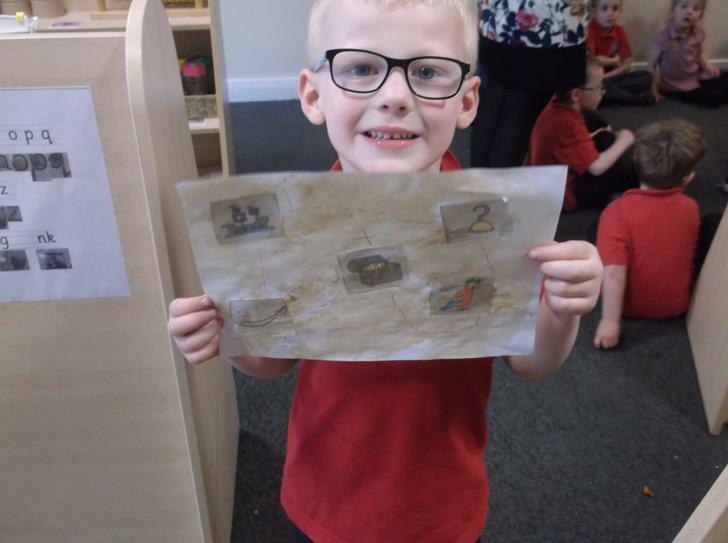 We made our very own treasure maps! We used coffee to stain them and make them look old and then Miss Hall even burned some of them! 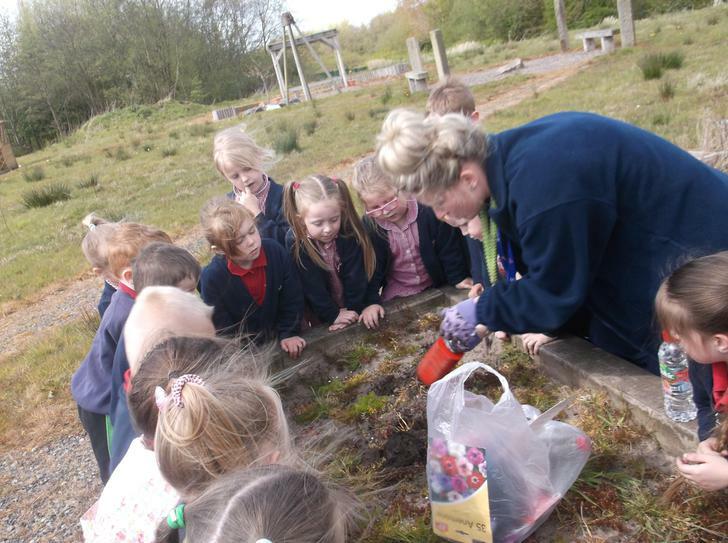 We went to the ALPS and planted some seeds. 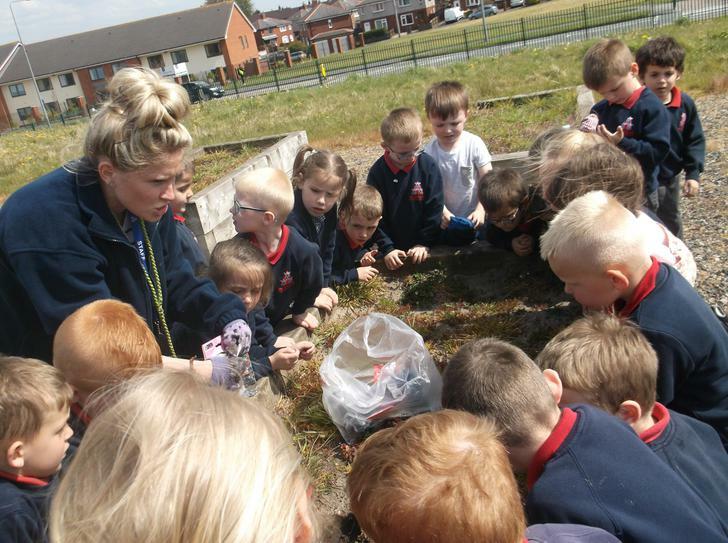 We are going to visit every week to see how they change and grow from the rain and the sunshine! We have been working super hard learning how to rhyme! We really enjoyed playing the rhyming bingo game as a class and then played it with our friends on our own to practice even more. 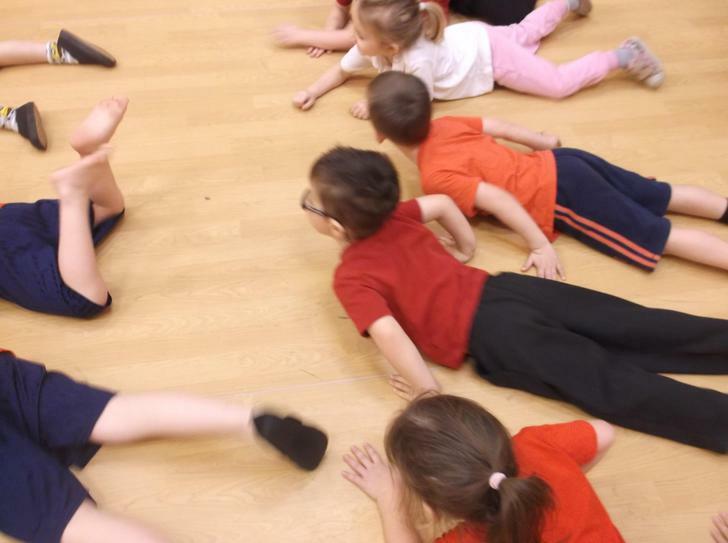 Come back next week and see what we get up to learning all about Peter Pan! 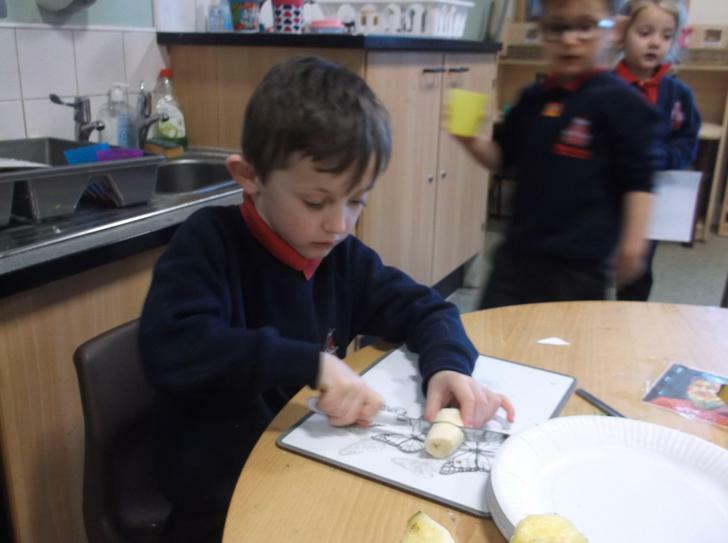 We read the story of the Enormous Turnip and have done lots of learning about the characters and different ideas from the story. We made Turnip soup and it was so yummy! 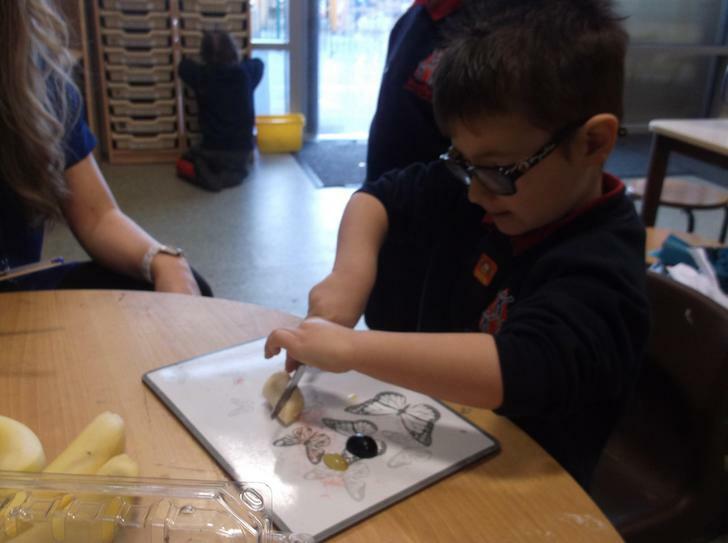 We made puppets and acted out the story and did lots of maths work counting and adding turnips! 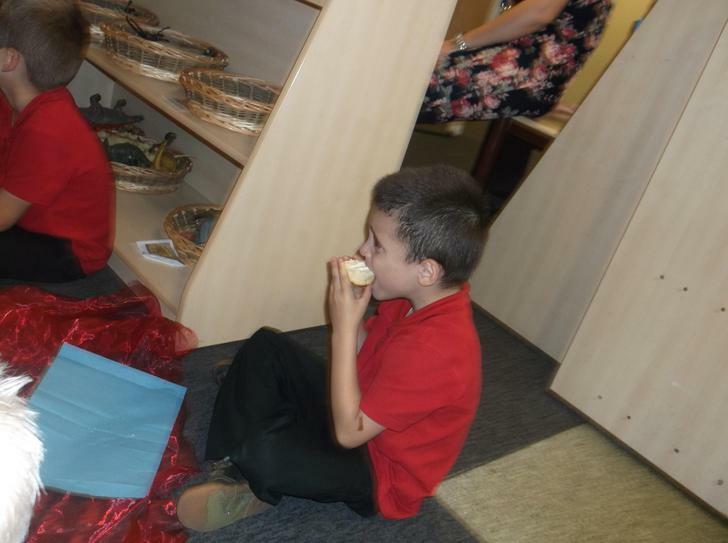 We have also had lots of fun building dens, reading stories to each other and creating our own costumes to role play! Have a lovely Bank Holiday weekend and we will see you next week! Hello! 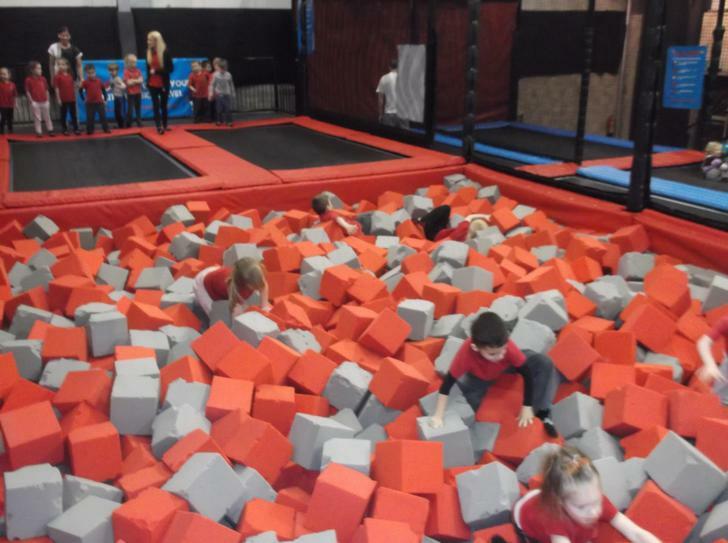 We have had another busy week in RW this week, come and see! We started this week reading the story of Jack and the Beanstalk and we acted out the story pretending we were the characters. 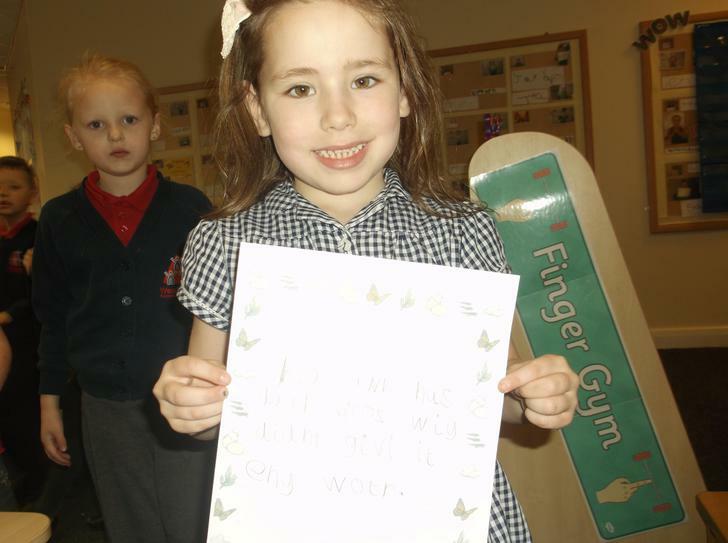 We have been doing a lot of work practicing writing sentences with finger spaces and full stops. 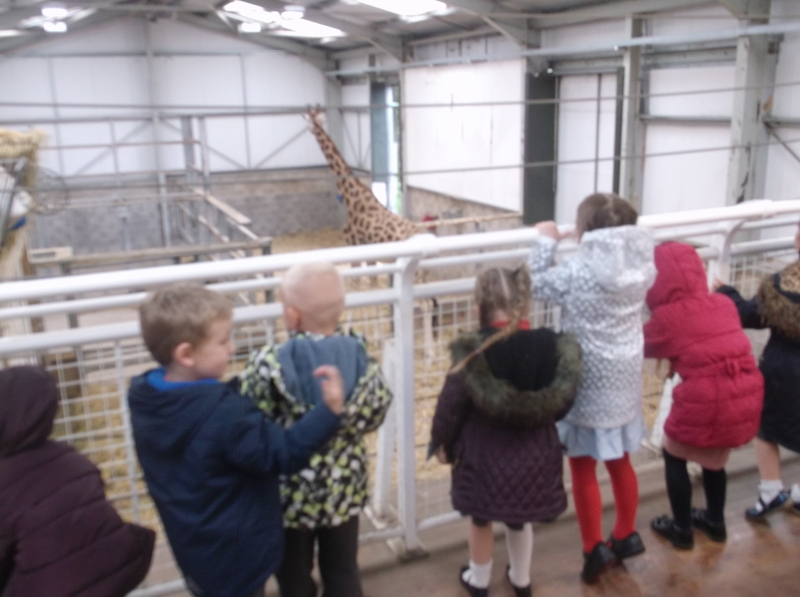 The grown ups have been so impressed with us! 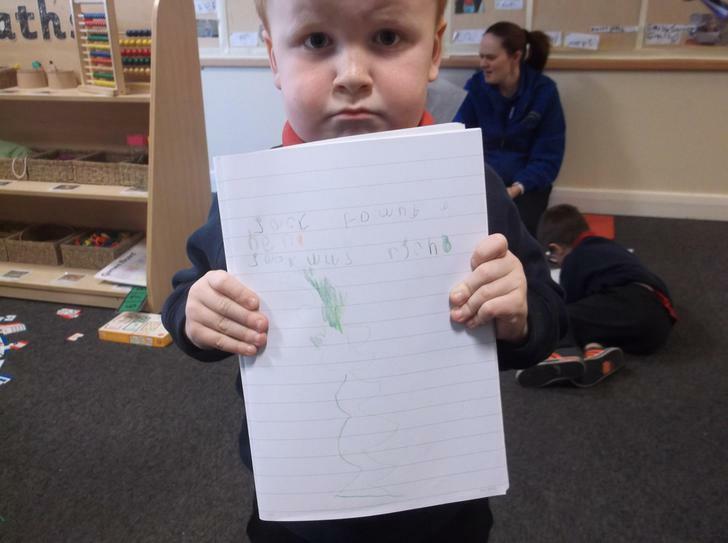 We did some writing all about Jack and the Beanstalk and the nasty giant. Look how amazing Paddy's writing is! 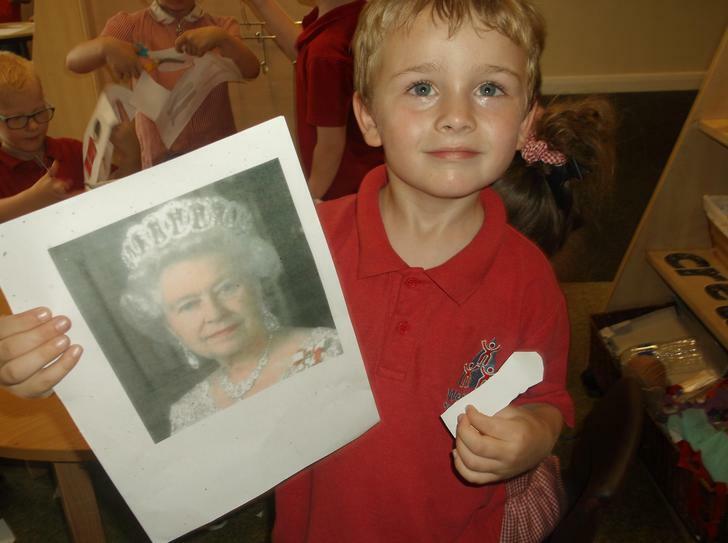 We talked about a very special person this week...The Queen! It was her 90th Birthday! 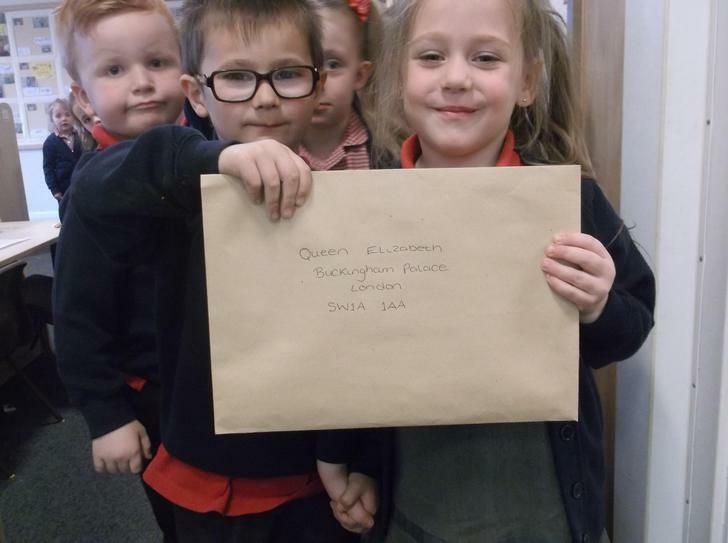 We thought it would be a really nice idea to write her some letters to wish her Happy Birthday and we even walked to the post office for a stamp and to post them to Buckingham Palace! 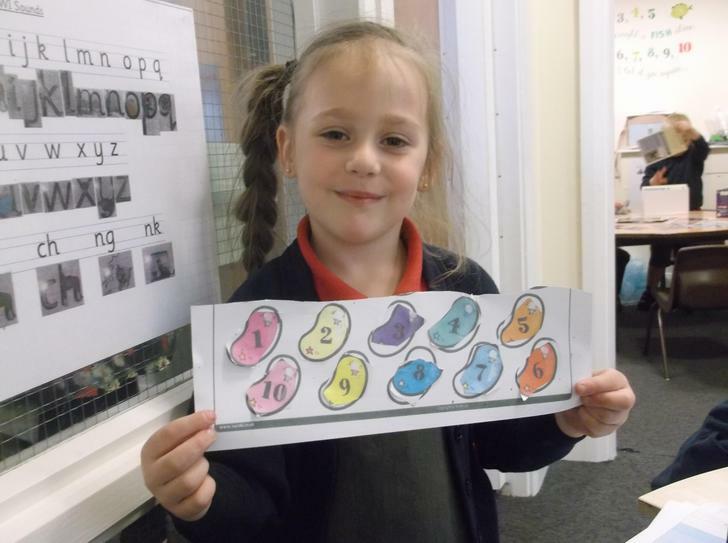 We finished the week doing some super counting and ordering Jacks magic beans! We are all so super now with our numbers! Have a lovely weekend and come back again next week. Hello! Welcome back :-) We hope you had a lovely break. 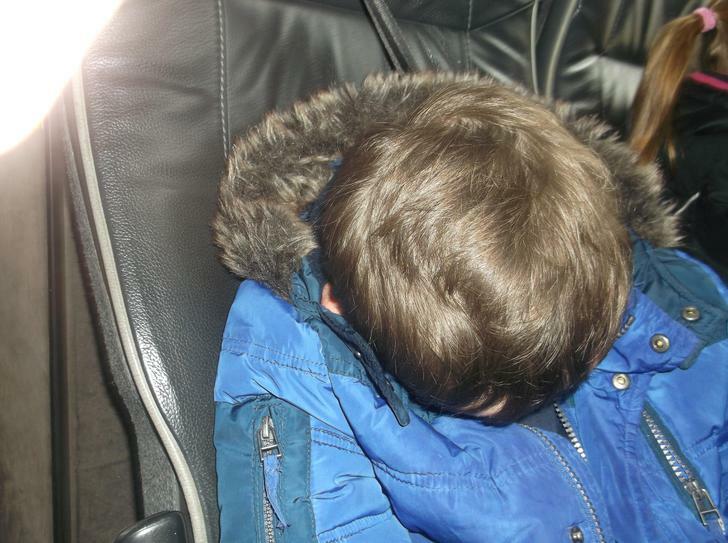 We have come back to school and once again have worked really hard! 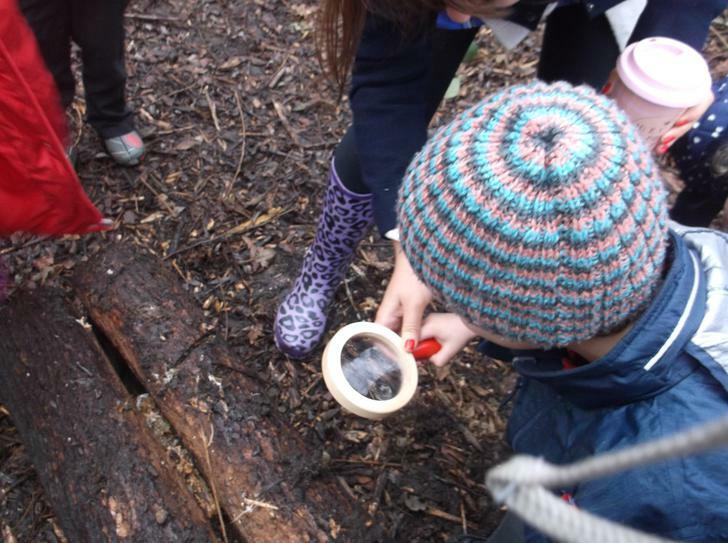 Our new topic this week is all about Spring time and the things that happen and what we see. We began by reading the story of The Hungry Caterpillar. We talked about what happened to the caterpillar and why he changed into a beautiful butterfly! 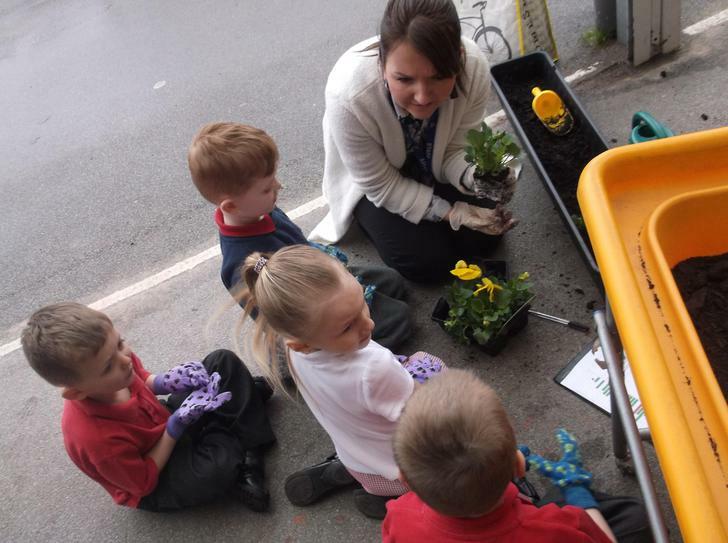 We have made our outside area into a garden center. 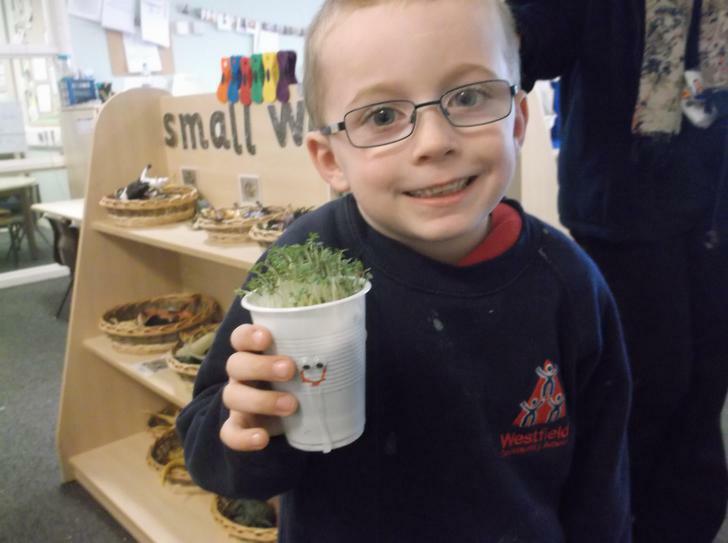 We planted lots of seeds and we talked about what we need to do to help them grow. We made some bird feeders to hang in our garden center so that the birds have something nice to come and eat. 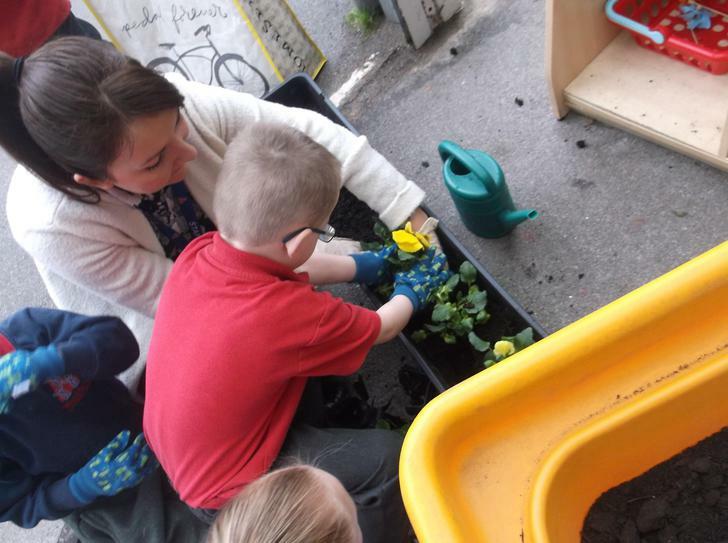 We also have pretend flowers to plant in the soil and a till so that people can come to buy nice things for their garden. 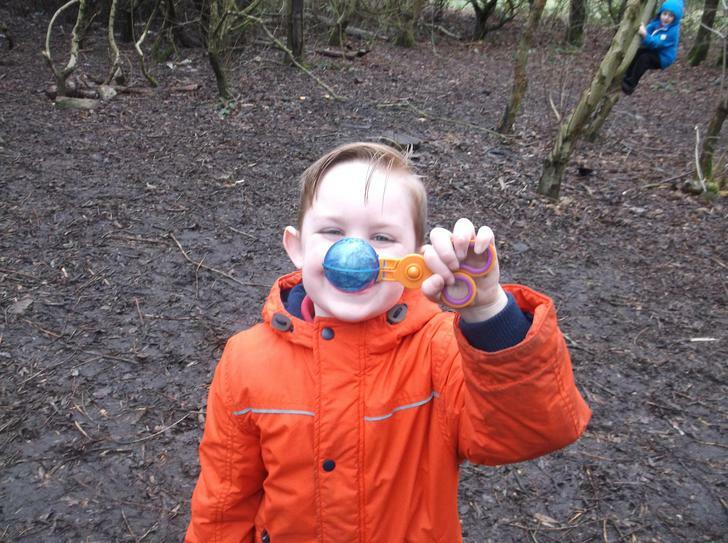 We went for a 'Spring walk' to find signs of spring in the environment. 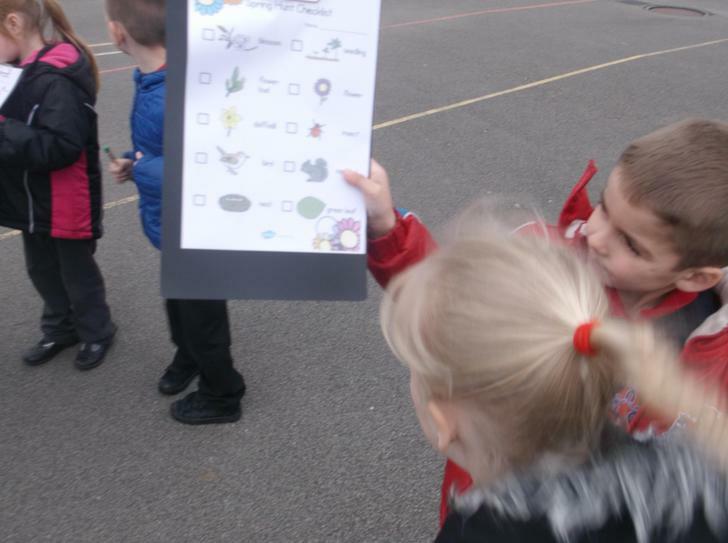 We all had a checklist to help us search for the signs of spring and really enjoyed looking at the animals. We even sprinkled the rest of our bird seed. 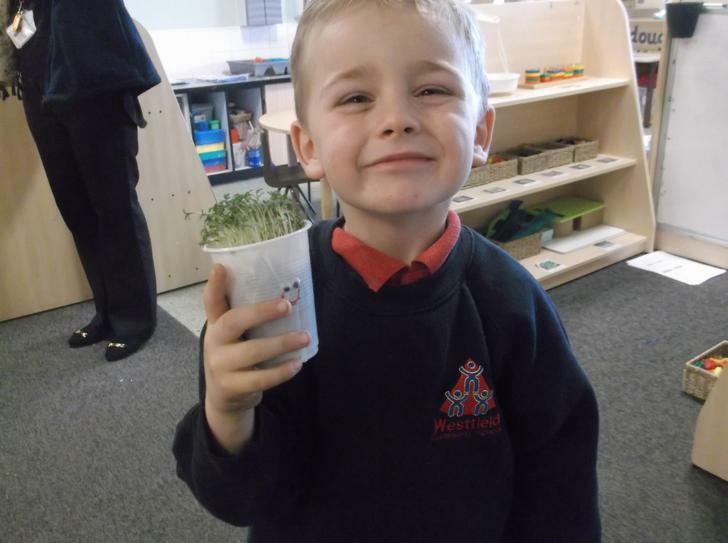 We did some fantastic writing all about what flowers need to grow and the grown ups where so impressed! 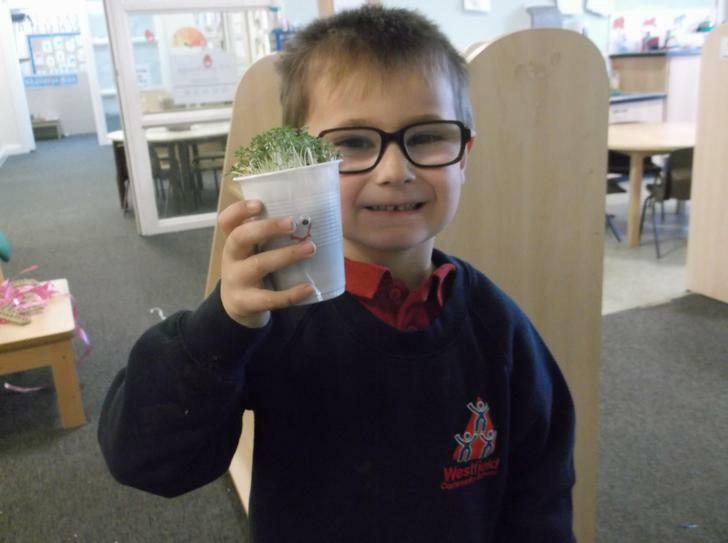 Come back next week to see what fun we have learning all about Jack and the Beanstalk! Hello! Come and see what we have been up to this week in RW. We have come to the end of our monster maths month and we have learned so much and been so busy! And how to measure each other. 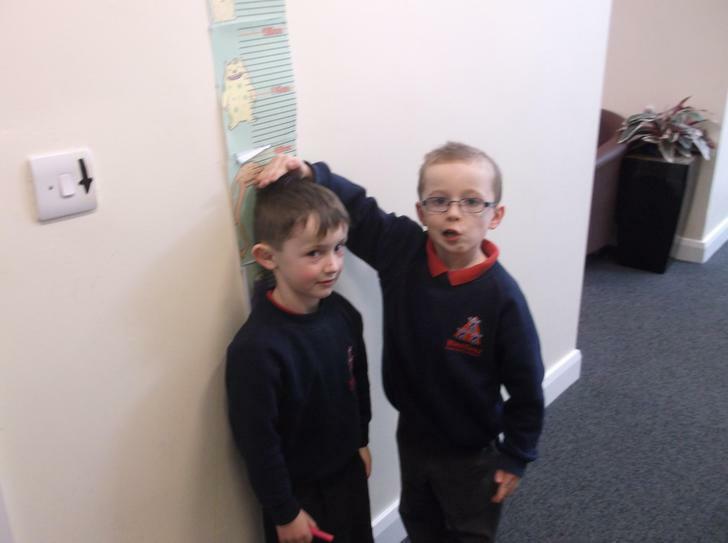 We measured our friends and talked about who was the tallest and who was the shortest. 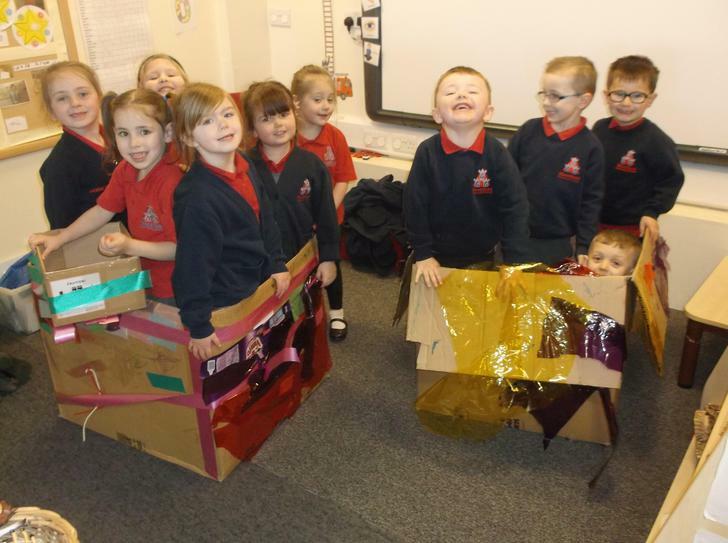 We read the story of Aliens love underpants and really enjoyed creating and making our very own spaceships! We played for hours in them making up our own stories about aliens traveling to earth and stealing underpants! 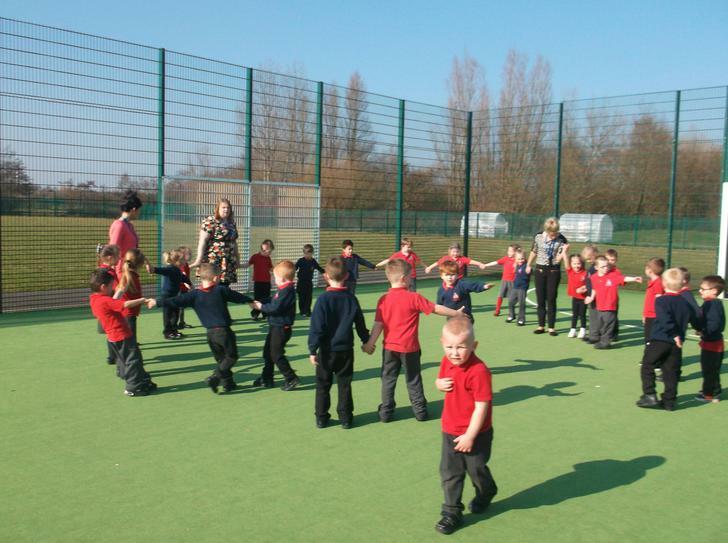 We had lots of fun playing team games in the mugga in the sunshine :-) We did lots of running and moving in different ways, taking turns and helping each other work as a team. 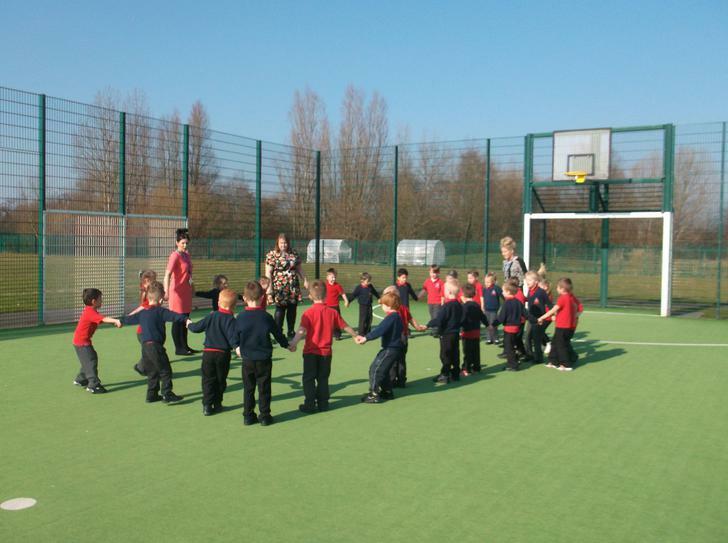 Thank you to all the children for taking part in sport relief! You all looked amazing! 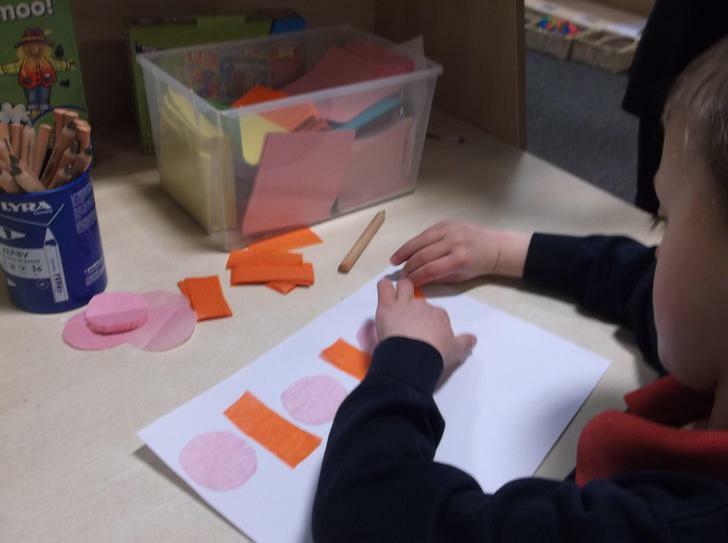 We then used the shapes to create our own repeating patterns. 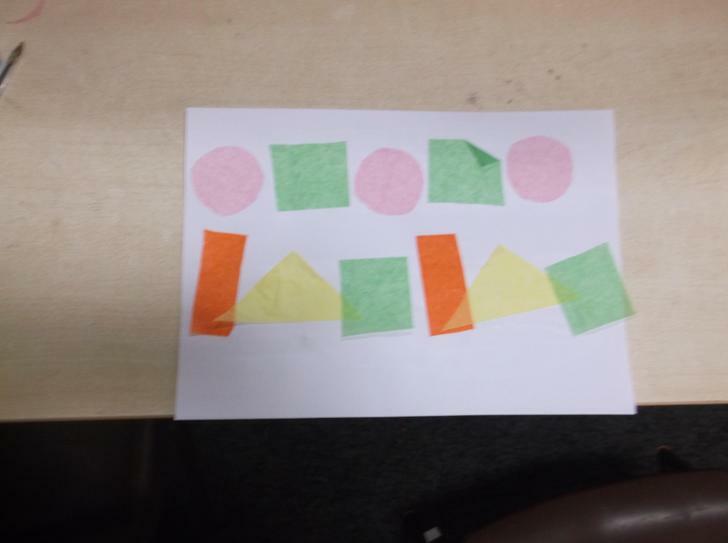 We had to think hard about which shape needed to come next and what colour it needed to be. We have also made some fantastic monsters out of playdough. Look how scary they are! We went to the ALPS to do some measuring. 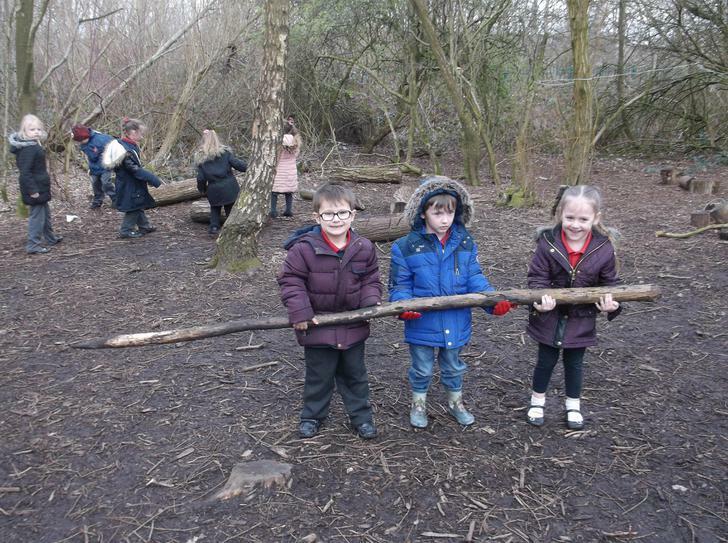 We found lots of different objects such as sticks and logs and we had to measure them to see which was the longest and which was the shortest and then put them in order. 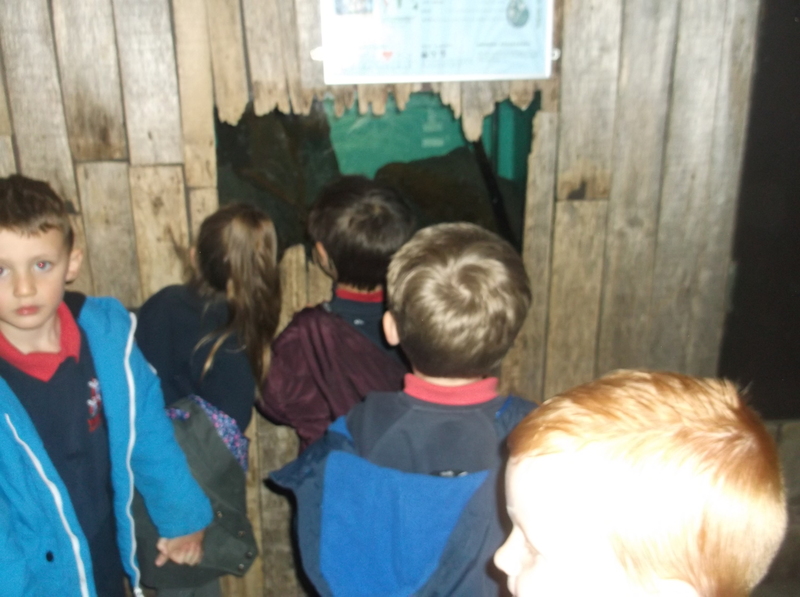 Luckily we never found any monsters whilst we were there! 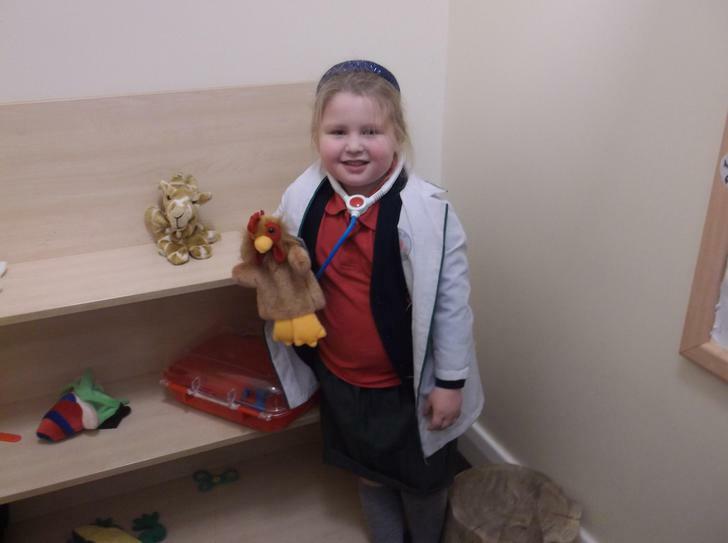 Our Role Play area this half term is set up as a vets. 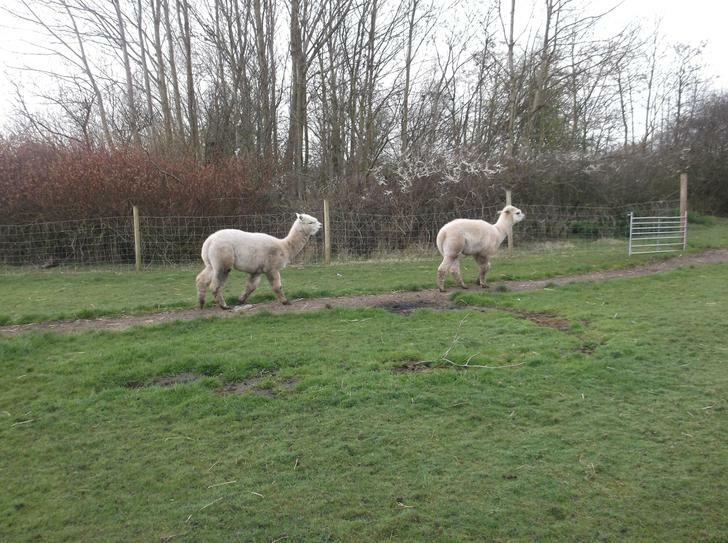 We have spent a lot of time in the vets pretending to operate on the animals, give them medicine and bandages if they are sick and pretending to be the receptionist writing the appointments, the prescriptions and the notes for the vet. That's all for this week. 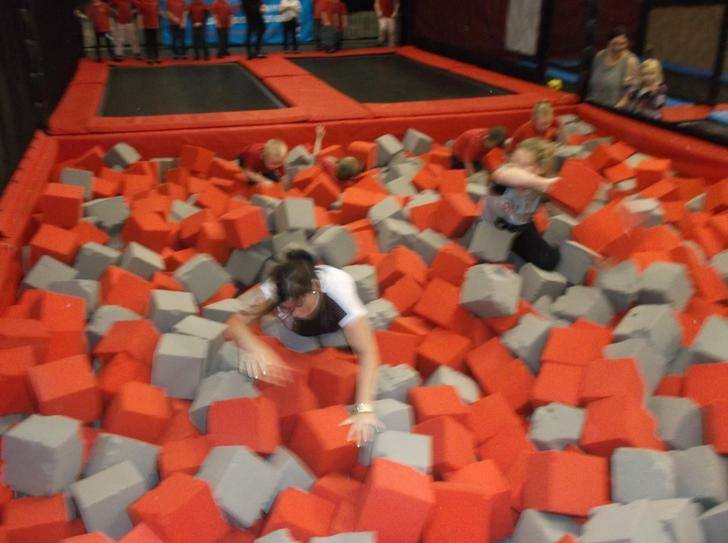 Come back next week to see what other exciting and 'monsterous' things we get up to! 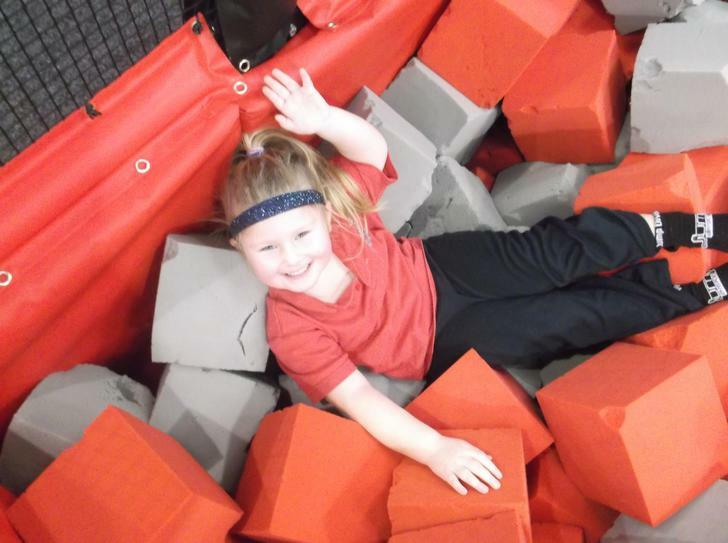 We had an amazing time at Jump Division! 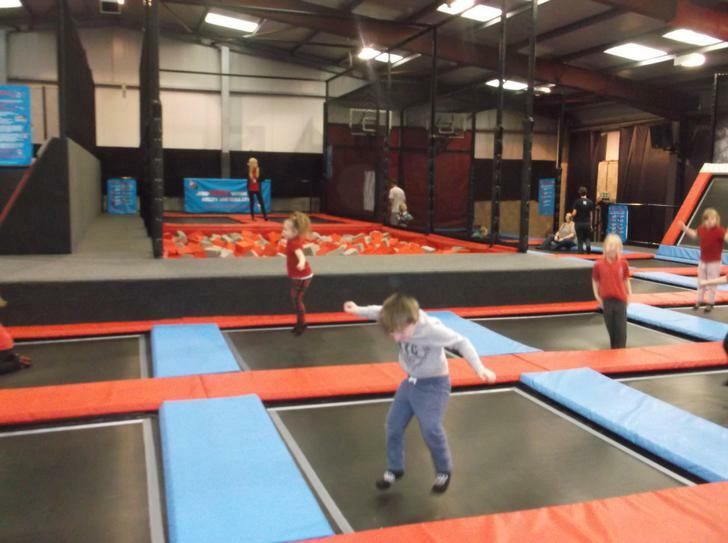 We did so much bouncing! 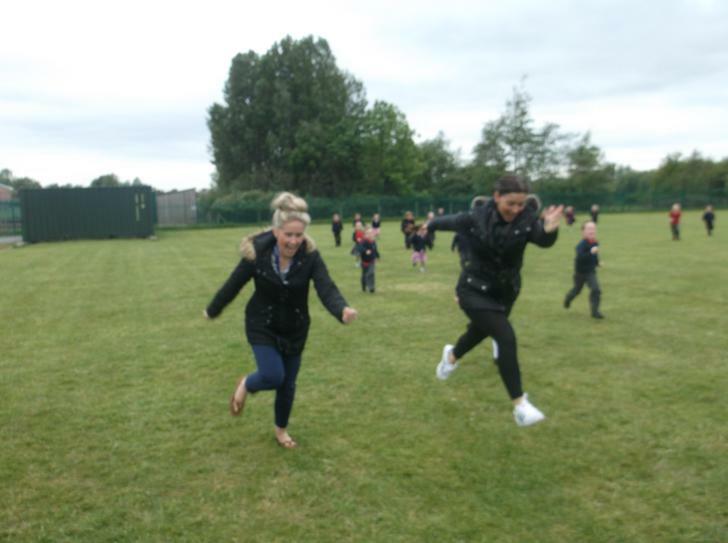 The grown ups had just as much fun too! We were amazing at the chatterbox challenge! 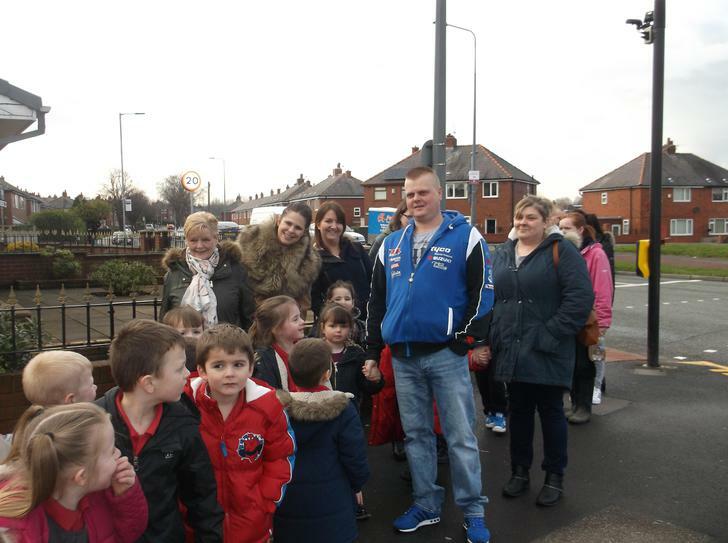 Thank you to mums and dads who came along to walk with us on our sponsored walk. We sang our little hearts out and we really enjoyed the afternoon. We hope you all have a wonderful half term break. Keep safe and we will see you all soon! Hello! 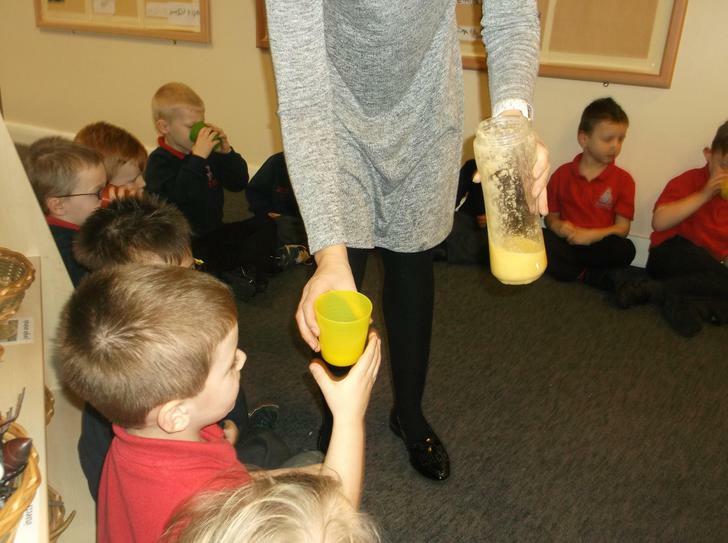 Well we have been very busy once again in Reception this week still looking at our topic of keeping our bodies healthy. 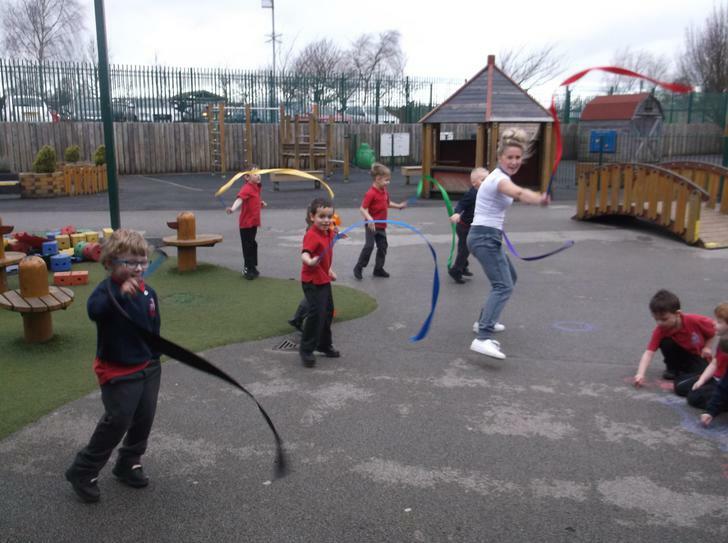 We started with P.E and were thinking about how excercise affects our bodies and how our heart beats faster when we do lots of excercise. 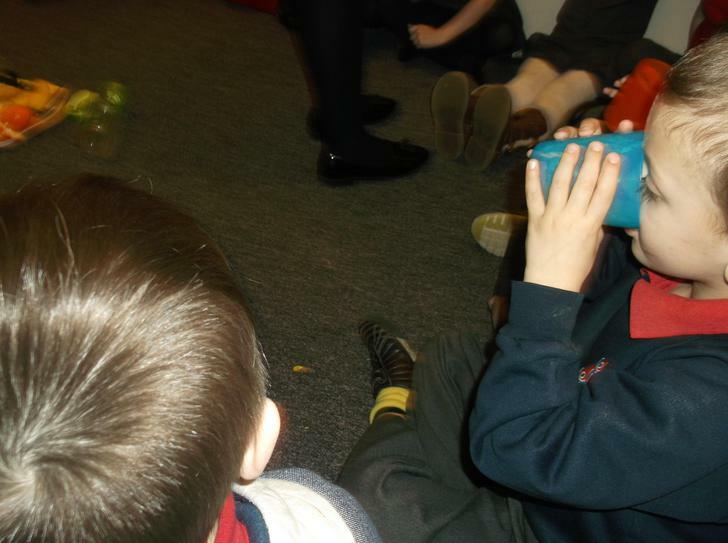 We also thought about other things that can have an effect on our bodies. 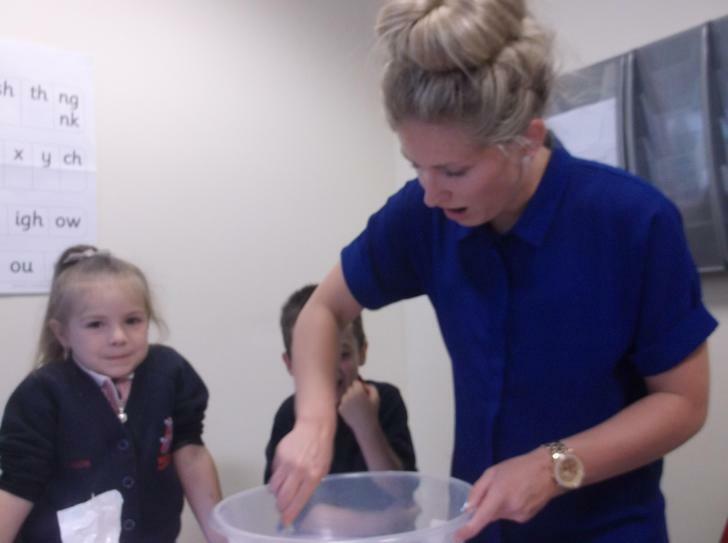 We talked about Germs and how they can make us poorly if we don't wash our hands after using the toilet or before eating. 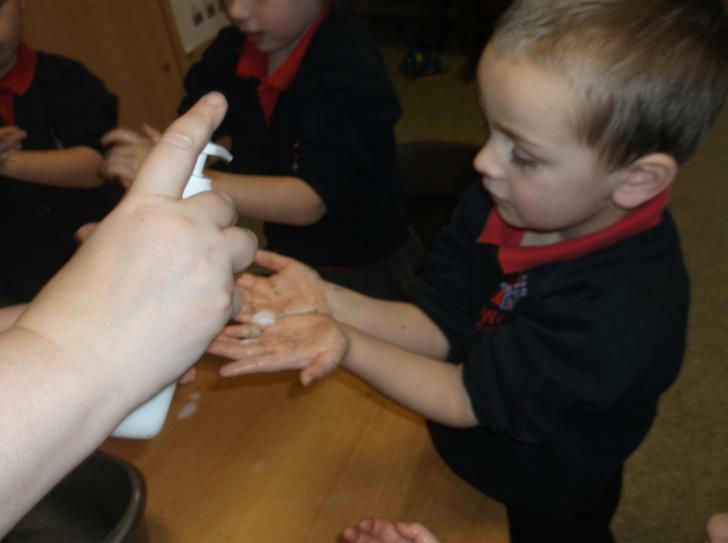 We looked at how germs spread and how we need to use soap to wash them away. 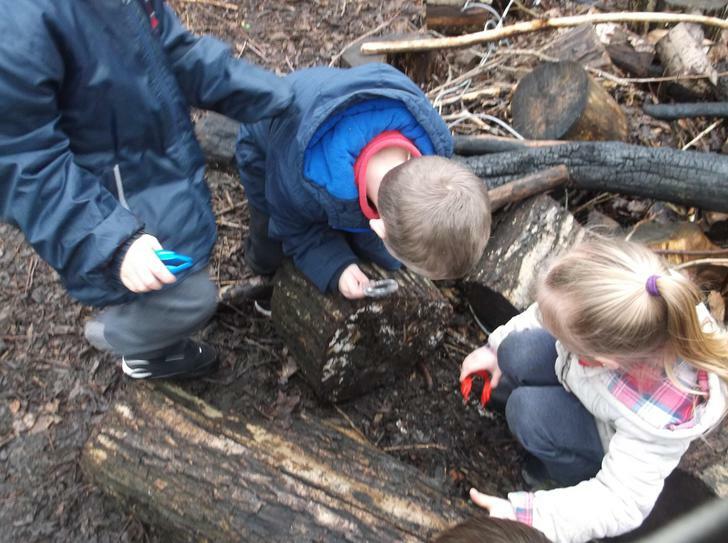 We really enjoyed exploring on the ALPS using different tools to search and dig for mini beasts! 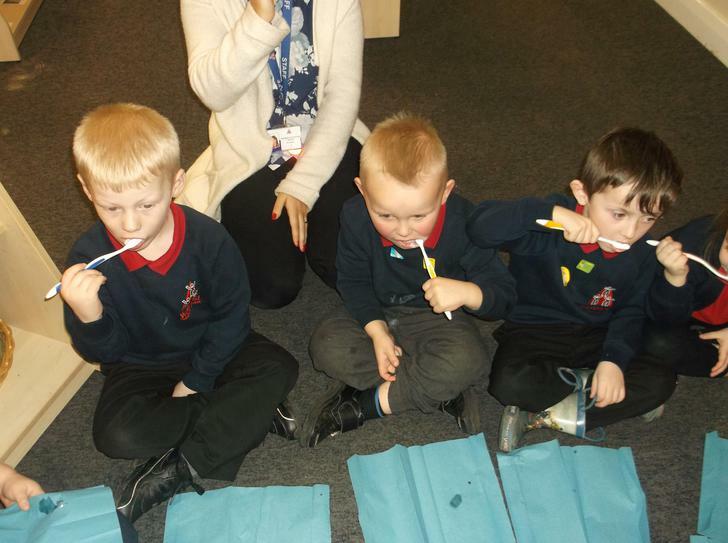 We finished the week talking about how to brush our teeth! 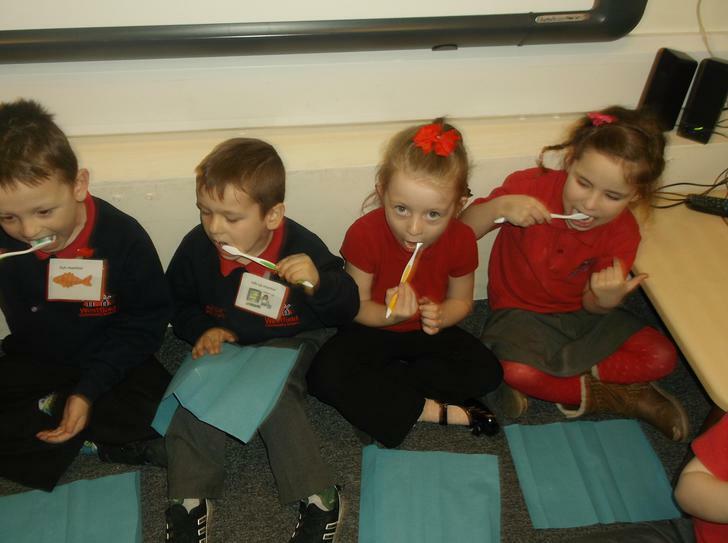 We all got a new toothbrush and talked about why it is important to brush our teeth and when we should brush them. Our theme next week is all about Chinese New Year and we will also be going on our trips to Jump Division as well as taking part in the Chatter Box challenge! How exciting! See you next week! 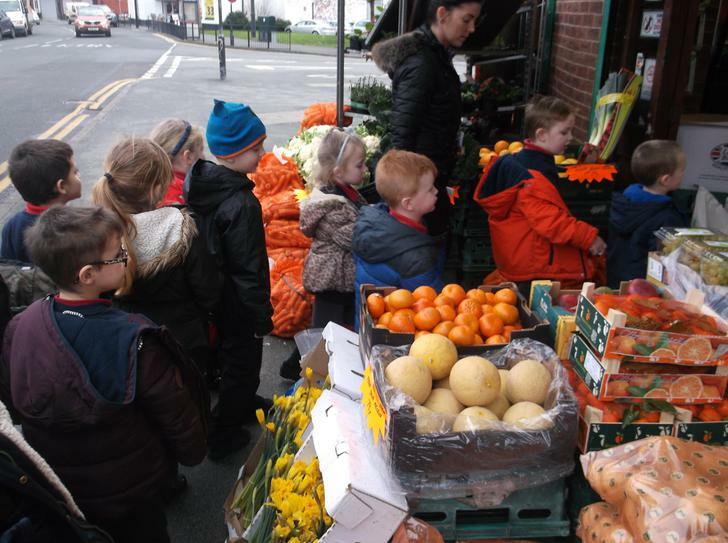 When we got back to school, we tried all of the different fruits we had bought and talked about which were our favourite. 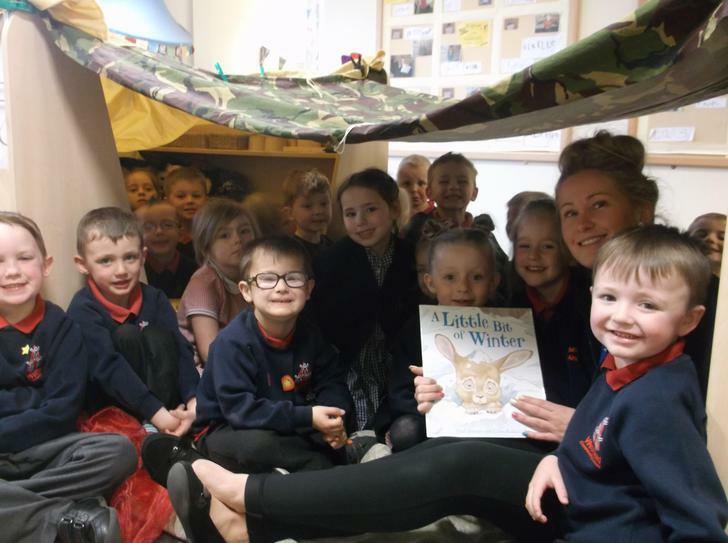 We really enjoyed making a den out of lots of different materials and enjoyed listening to Miss Gray read us stories. 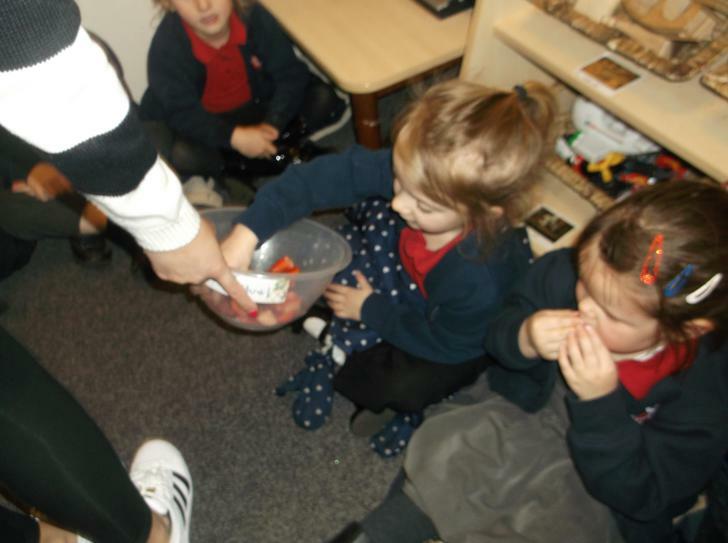 We talked about why we should eat fruit and vegetables and how they have a good effect on our bodies. 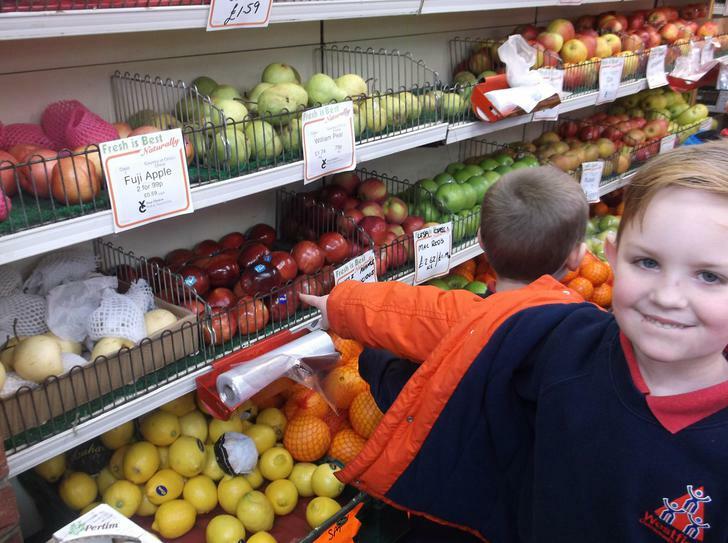 We wrote lists in our literacy of our favourite fruits. 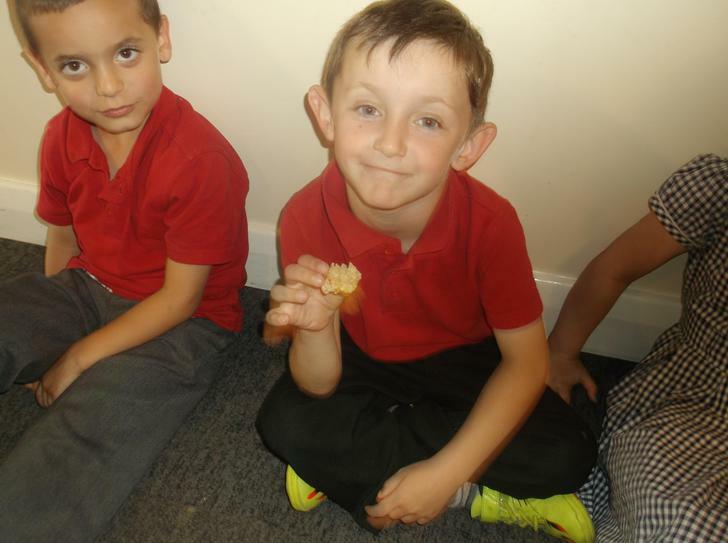 We then used the lists to make fruit kebabs. We had to be very careful cutting the fruit and putting it on the kebab sticks. On Thursday we went to the ALPS. 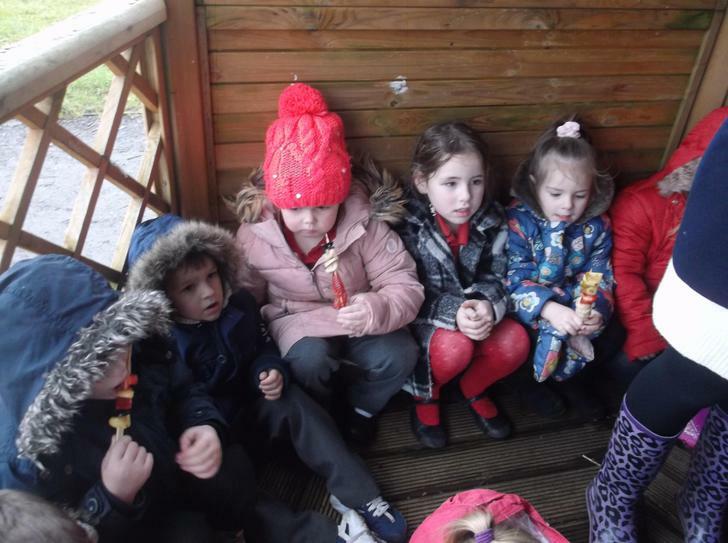 We took our fruit kebabs to eat for snack. 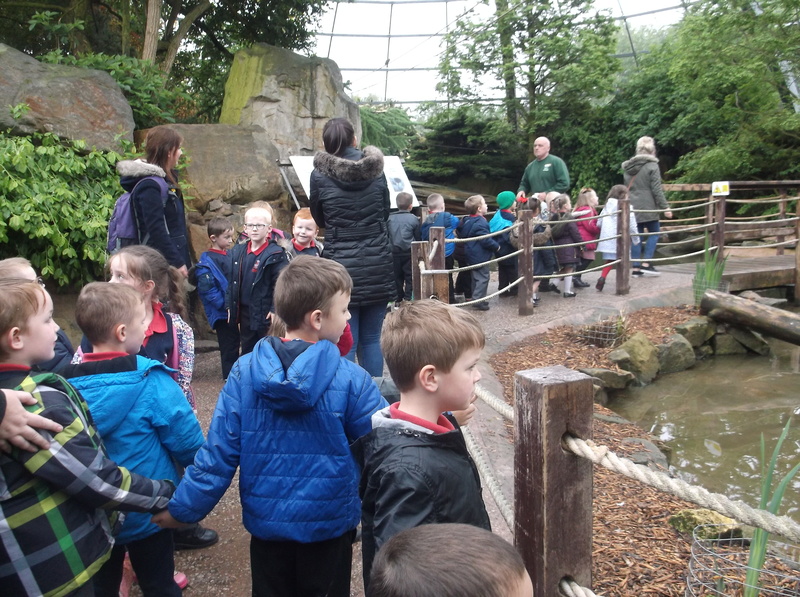 We had lots of fun exploring! We had a look at an artist called Arcimboldo . He makes pictures of faces out of fruit and veg. 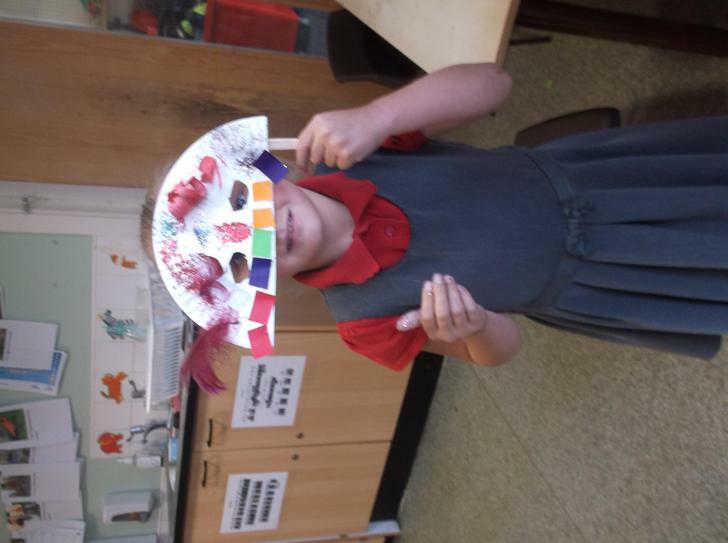 We had a go at creating our own Arcimboldo pictures and they looked amazing! 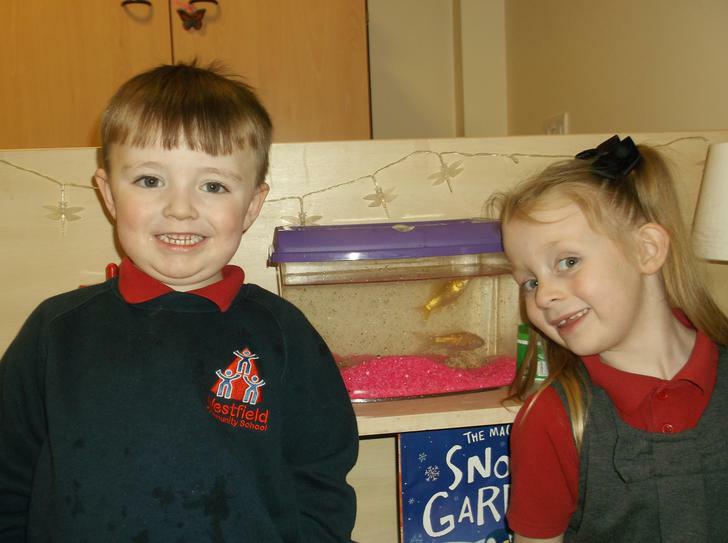 A quick update...Chips and Egg have settled in very well and are now part of the reception family! 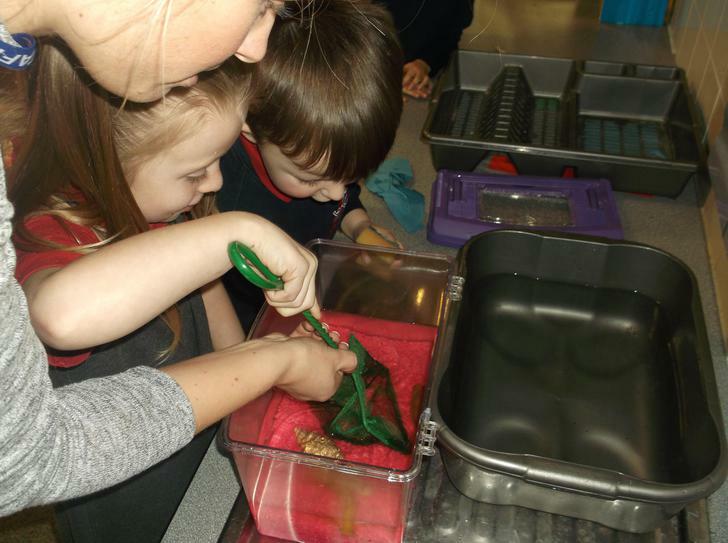 The children take turns to be 'fish monitors' ensuring the fish are fed and cleaned and looked after. 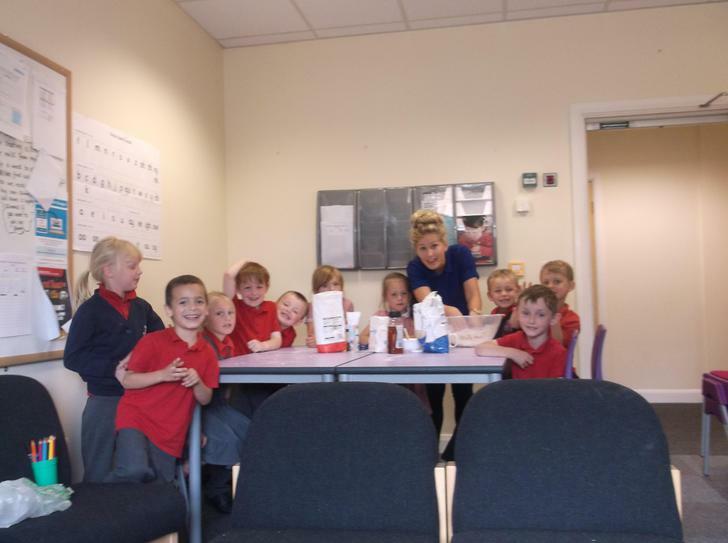 The children are doing a wonderful job at taking care of them. 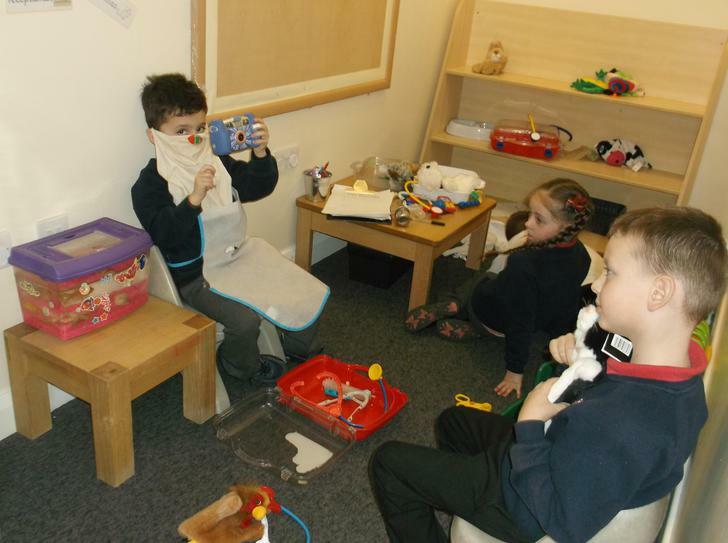 Well what a busy week we have had in Reception this week! 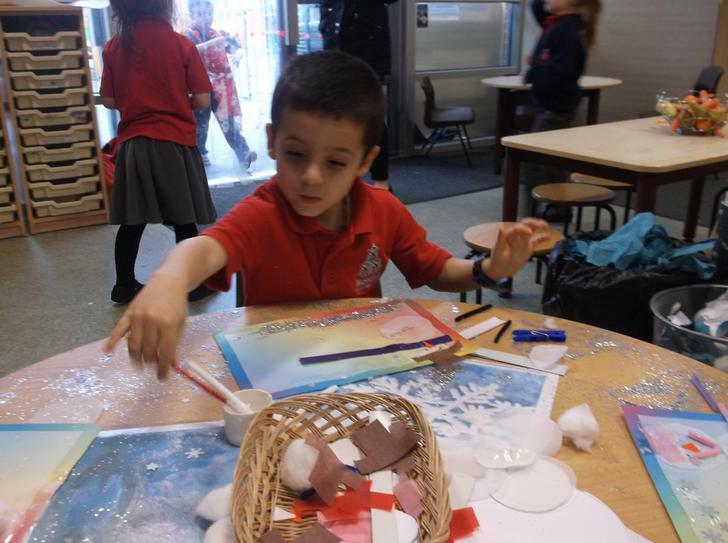 Our theme this week was all about winter. 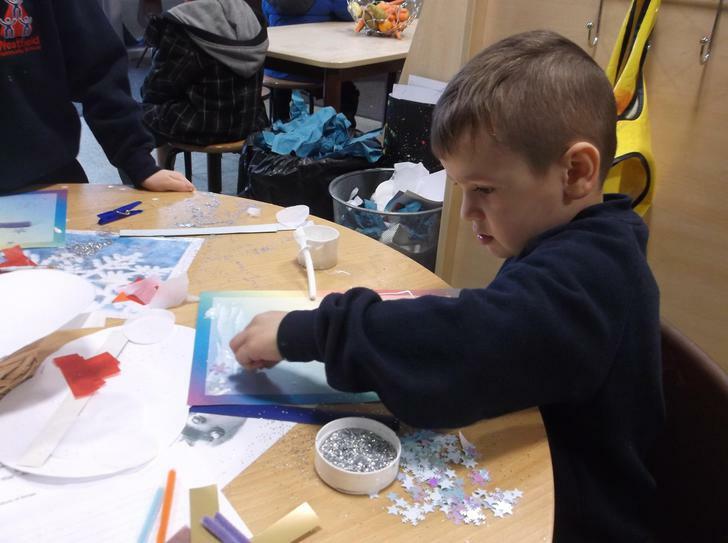 We began the week reading the story of the smiley snowman and making our own snowmen pictures. 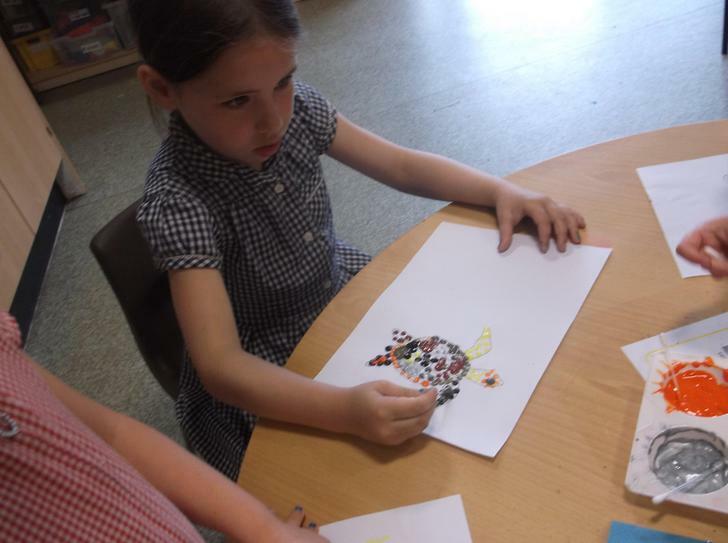 Have a look at us working very hard, creating our pictures. They are now on display in our classroom. We worked very hard in our literacy work and wrote lots of different words all by ourselves to describe our snowmen. 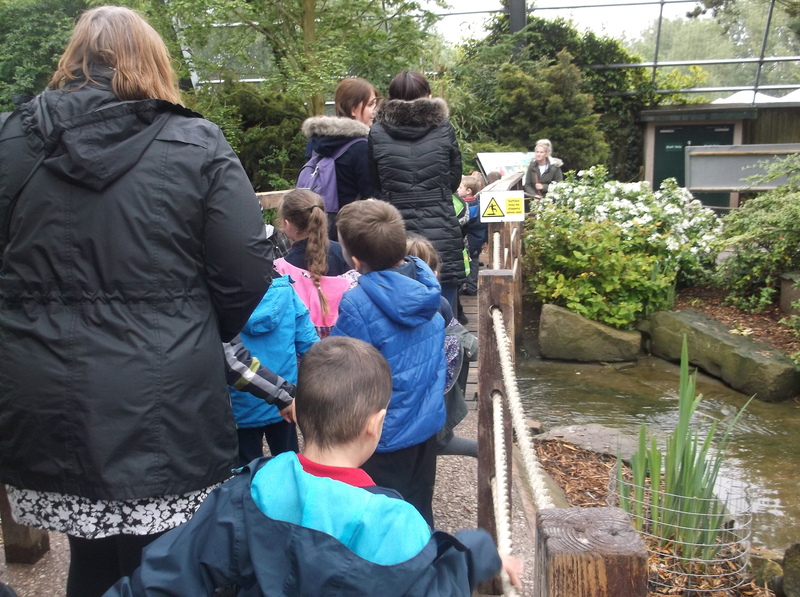 All the adults were extremely proud and impressed!! Look at Rihanna's snowman that she made with the playdough! It is fantastic! 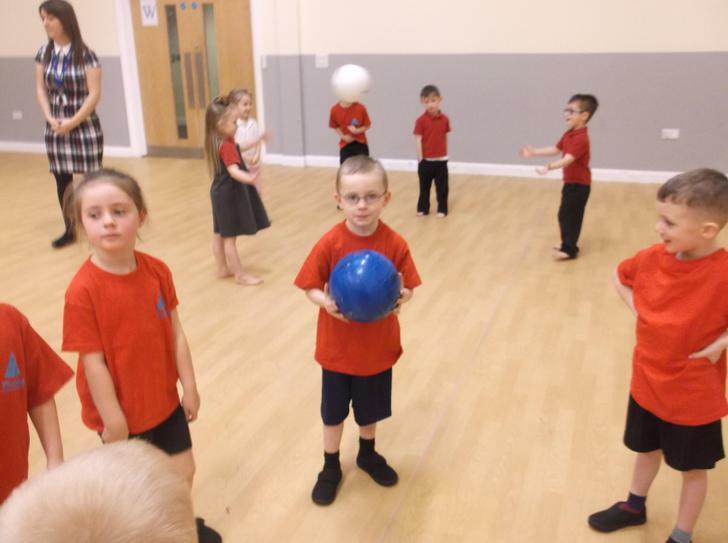 We also did some P.E this week where we showed the grown ups how good we are at throwing and catching and moving in different ways. 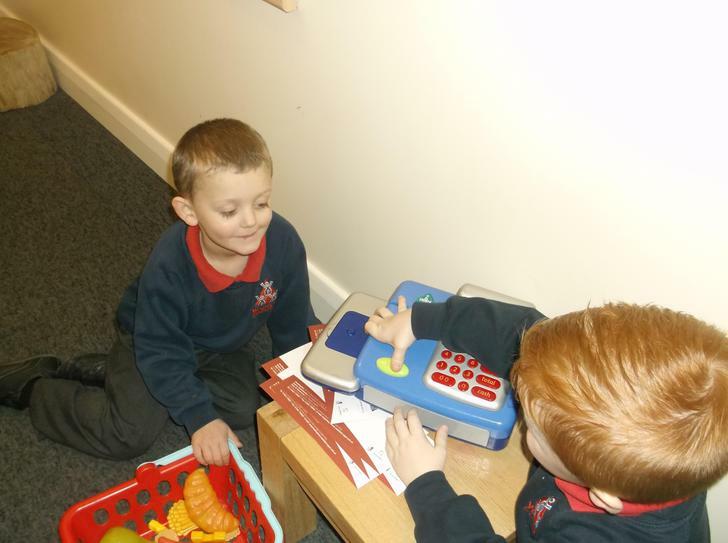 We now also have our very own shop in the classroom. 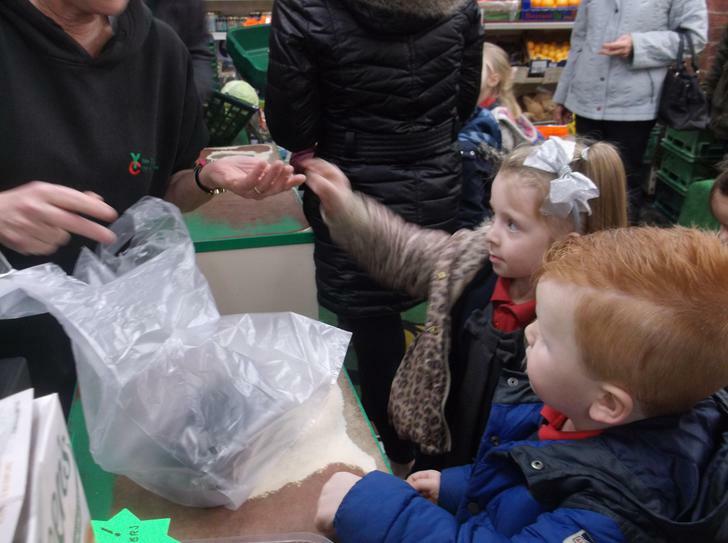 We have really enjoyed pretending to do our shopping with the baskets and the trolley and loved pretending to put it all through the till and paying with the money. 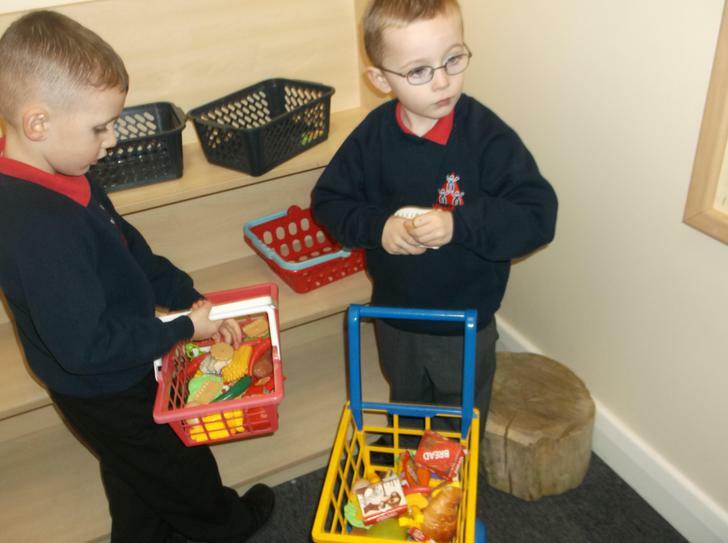 We are going to build our shop into a supermarket over the next few weeks using the shelves for lots of different items and label them all with prices. We went on a winter walk to the ALPS to look for signs of winter. 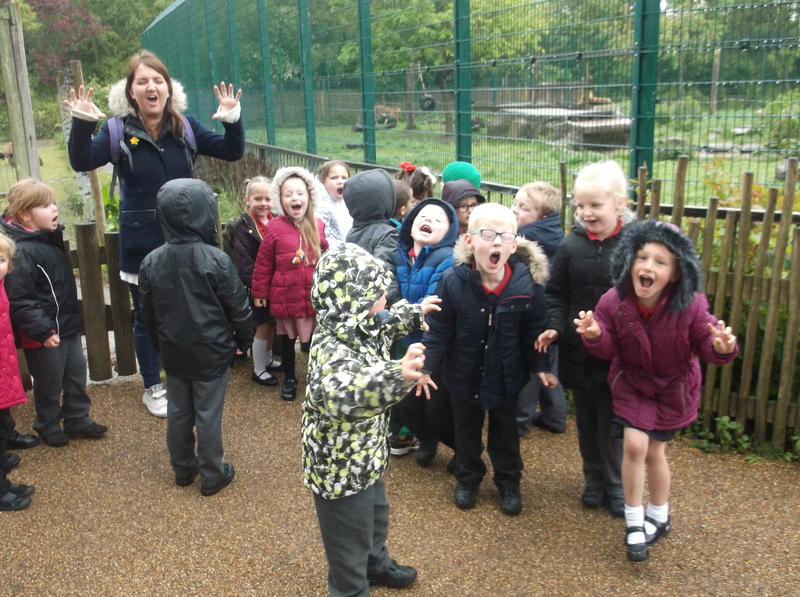 We had to wrap up warm because it was so cold! 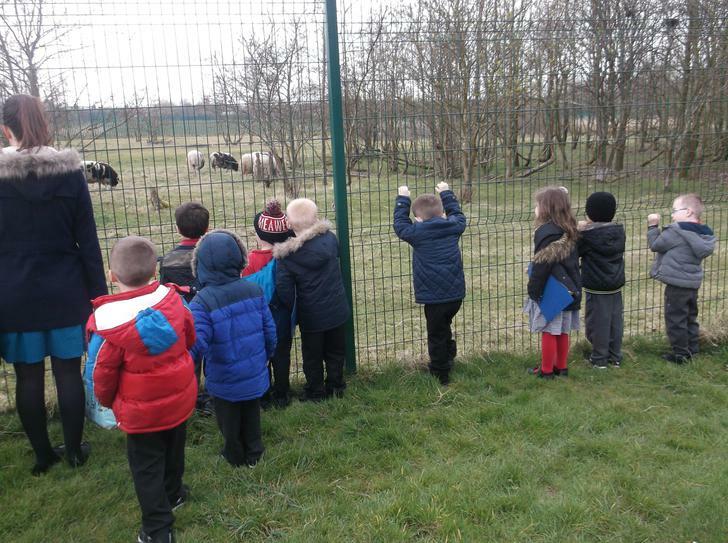 We saw lots of different things that told us it was winter such as snow on the top of Rivington (we could see it in the distance), no leaves on the trees and our breath when we blew! We helped each other write a list of the signs of winter we had seen and worked very hard to sound out all the words! Miss Gray was so impressed with us this week that she had a surprise.....We now have two new members to our class...Meet Chips and Egg! 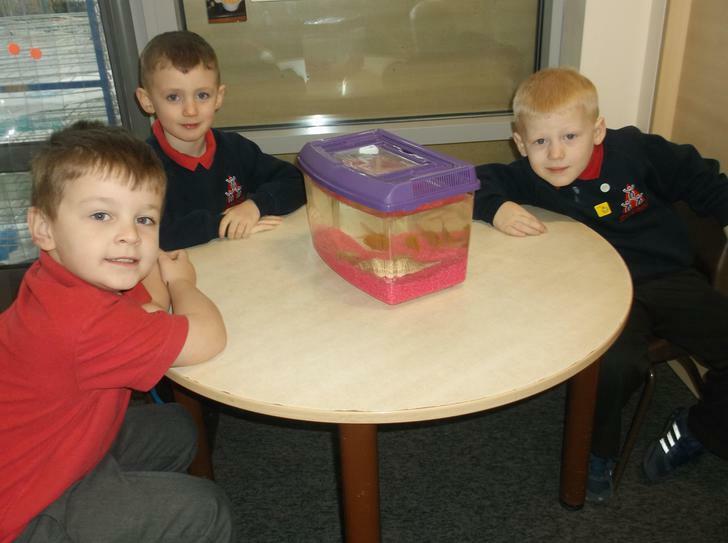 We are so sensible now that we have our very own pets to look after! 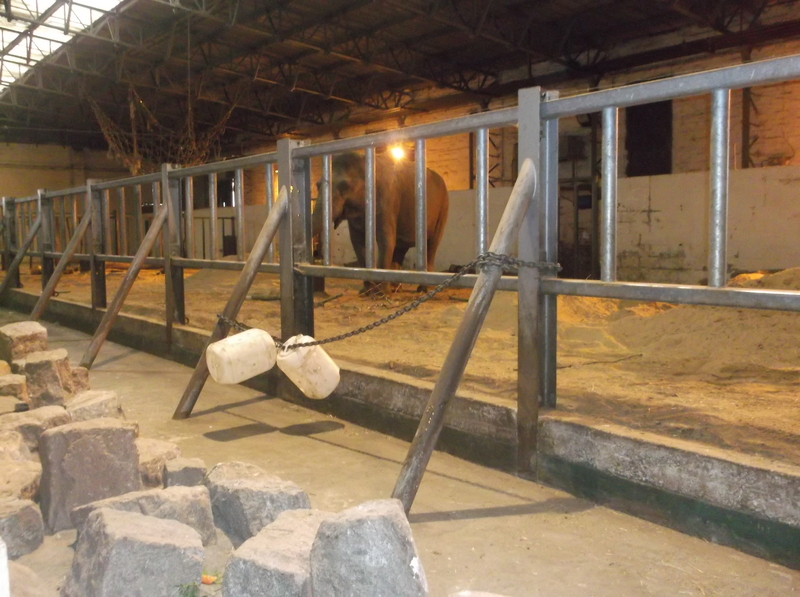 We need to help feed them and clean them and make sure they are well looked after. 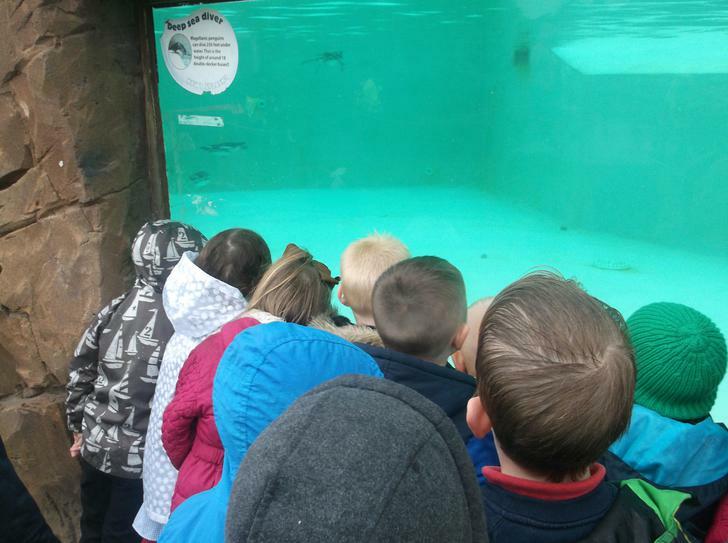 We are going to have fish monitors every week who can wear the special fish monitor badges. Happy New Year! and welcome back. 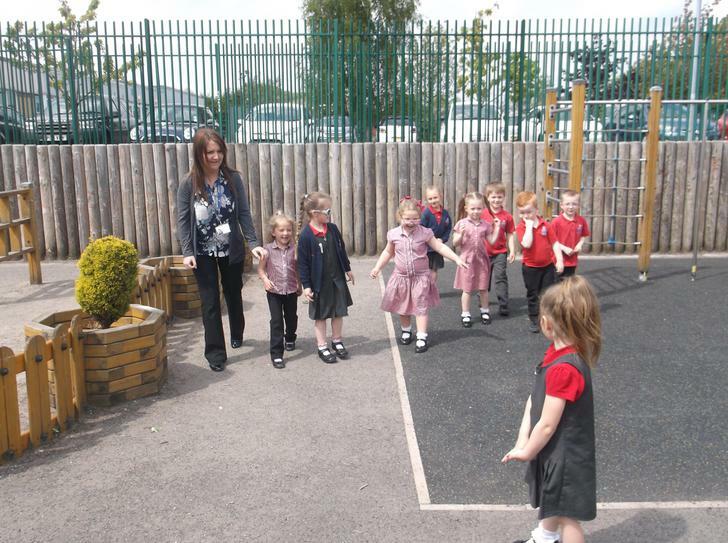 What an exciting first week we have had back in Reception W! We started the week thinking about our new years resolutions and drawing pictures of what Santa had brought us for Christmas! 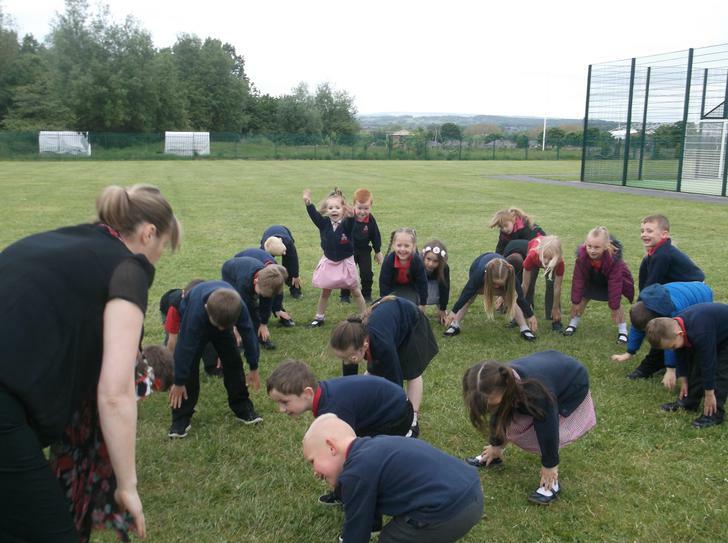 We got straight back into our learning and went on a shape hunt around school to see what shapes we could see in the environment! 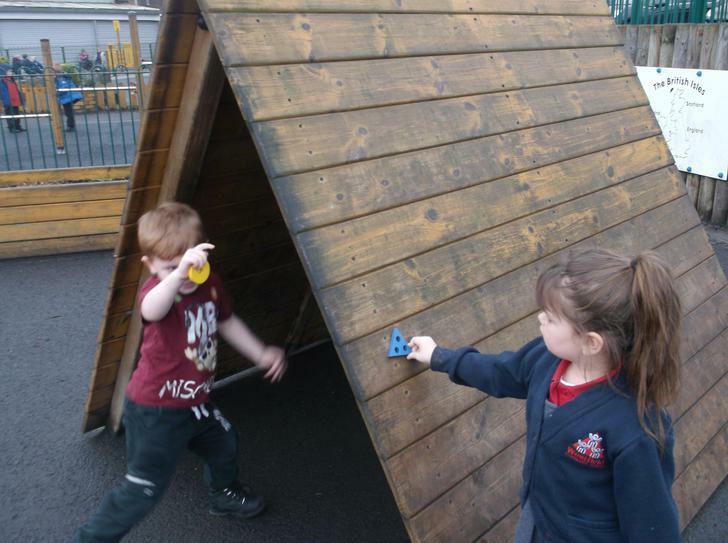 Here are Jayden and Ella finding shapes outside! 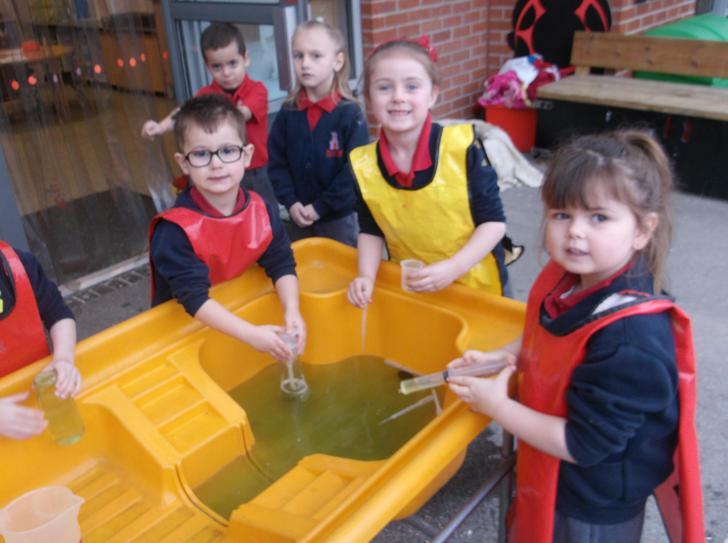 We also had lots of fun playing in the water tray with the green water using jugs and cylinders to measure and pour water! 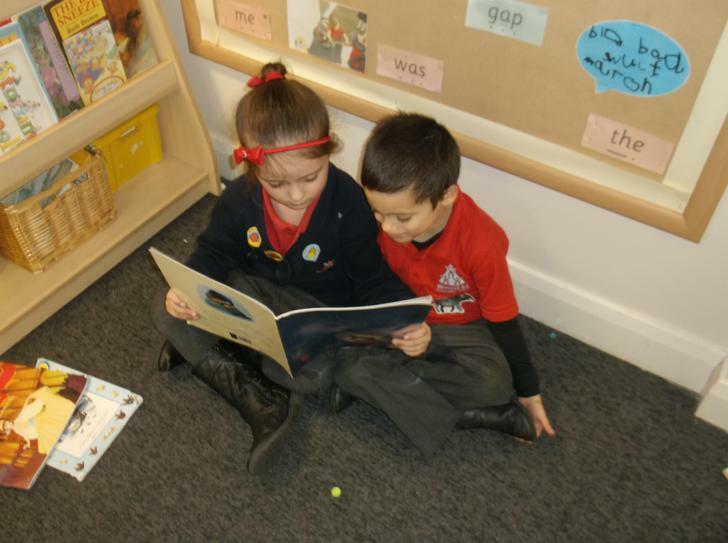 We have spent lots of time in our new reading area reading lots of new books. Here we are reading some of our favourites! 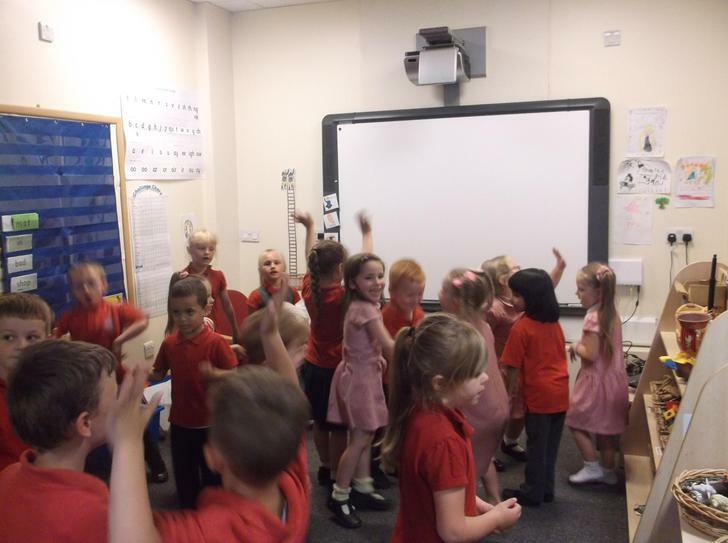 Because we worked so hard, Miss Gray thought we deserved golden time on Friday afternoon. 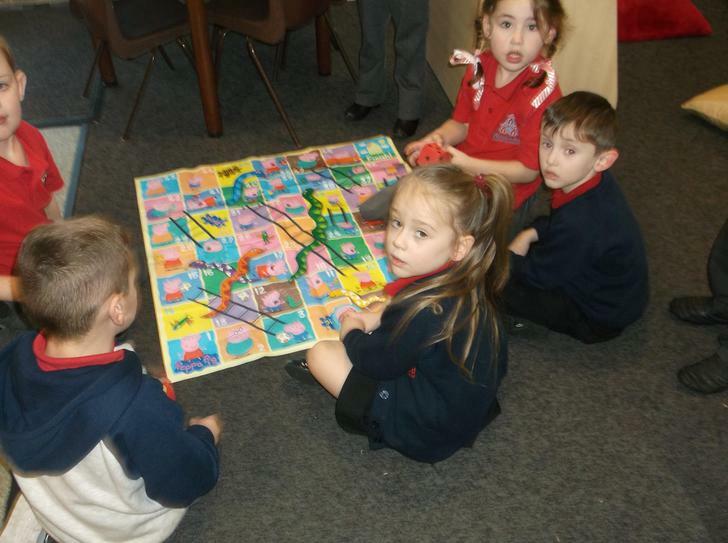 Here we are playing games and having lots of fun with our friends! That's all for now. Please come back next week and see what other exciting things we get up to! 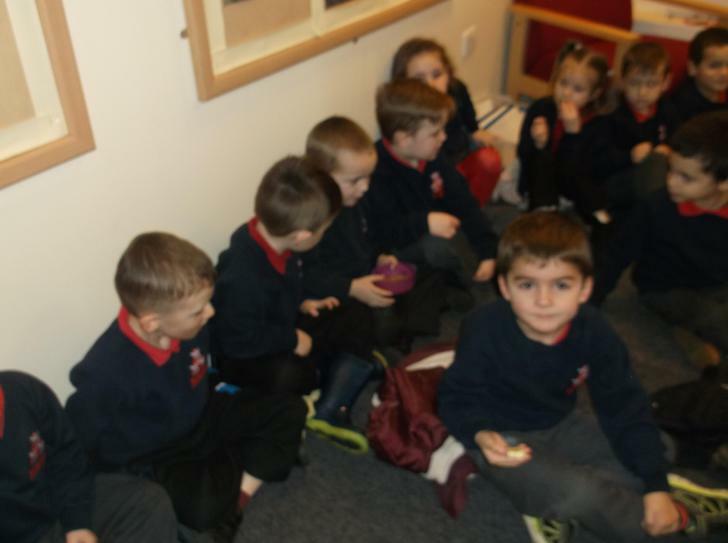 Our last full week in Reception before we break up for Christmas and oh my what a busy week it has been. We have worked so very hard with our Nativity, we have learned our words, listened to the songs and put together a really good performance. We are sure that you are as proud of us as the grown ups in the room are. 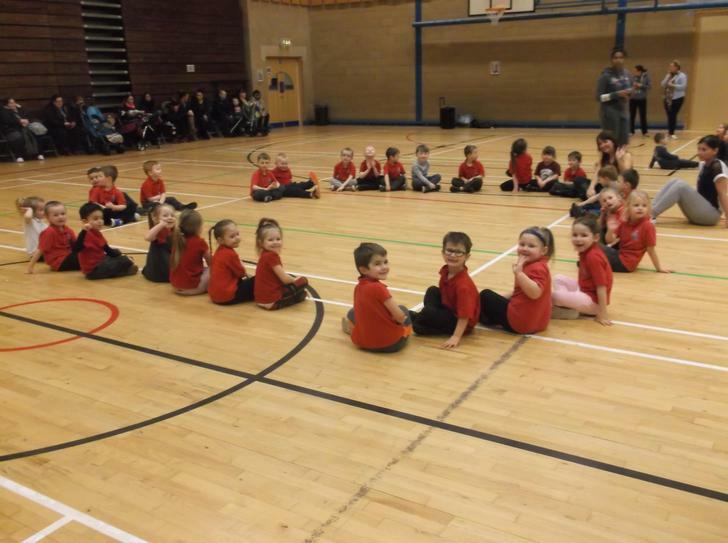 Here we are all together ready to perform. We also transformed ourselves into Santa's little elves! These are now on display in our classroom, the staff in the room have also been transformed, but shhhhh don't tell them, they look sooooo much better! 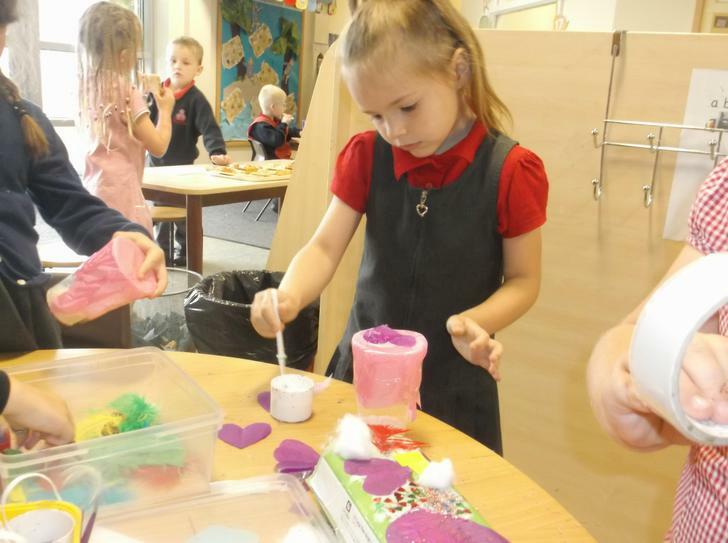 We have also been busy making and decorating decorations to bring home to add to our family Christmas tree. 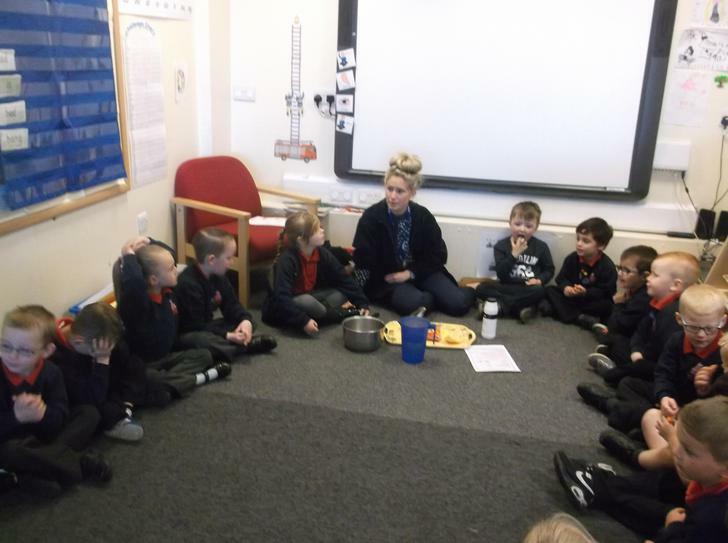 We talked about the meaning of Christmas and what we were grateful for. We really do have some thoughtful children in our class. 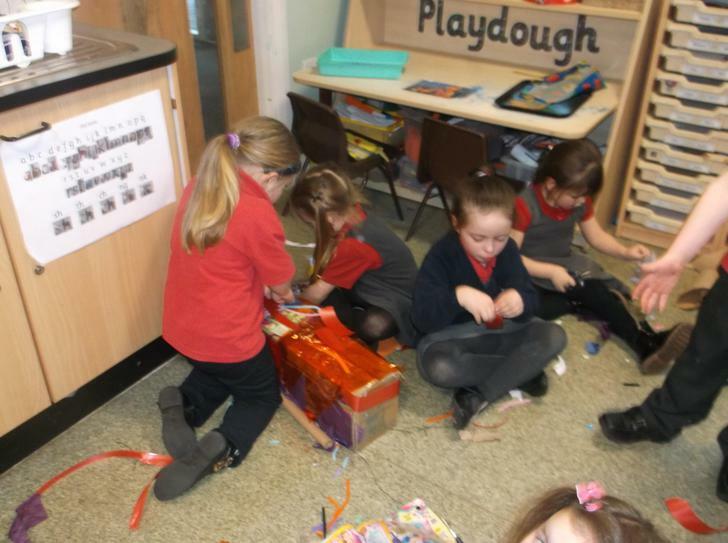 Here are some photographs of us in the process of making our decorations. We ave also written lists to send to Santa telling him what we would like for Christmas. We used our RWI knowledge to write and sound out the words. We have made such good progress in writing and it clearly shows in the work that we produce. Look at Phoebe's writing. 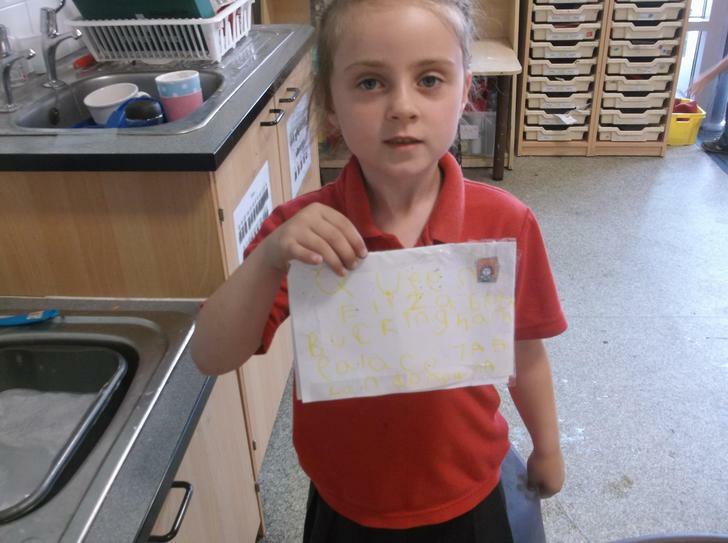 She has written this independently and thought very carefully about capital letters and finger spaces. We are very proud of her! Then you'll never believe what happened next. 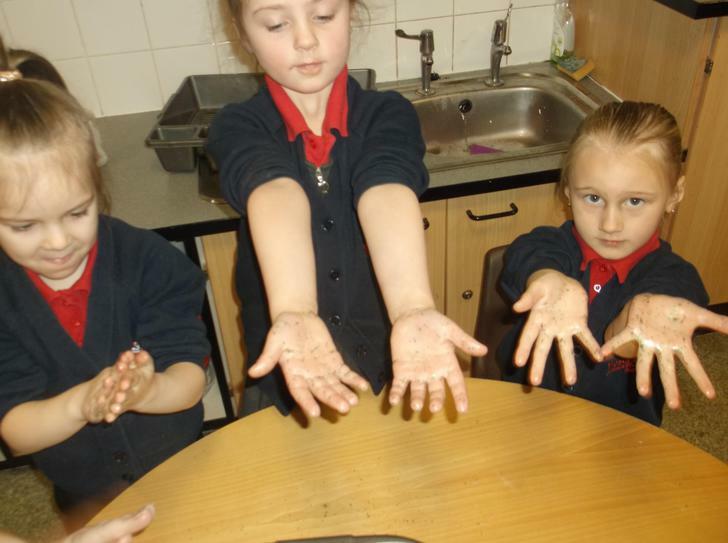 We appeared in school on Tuesday and were faced with green hand prints, we have no idea where they came from, who left them or anything. 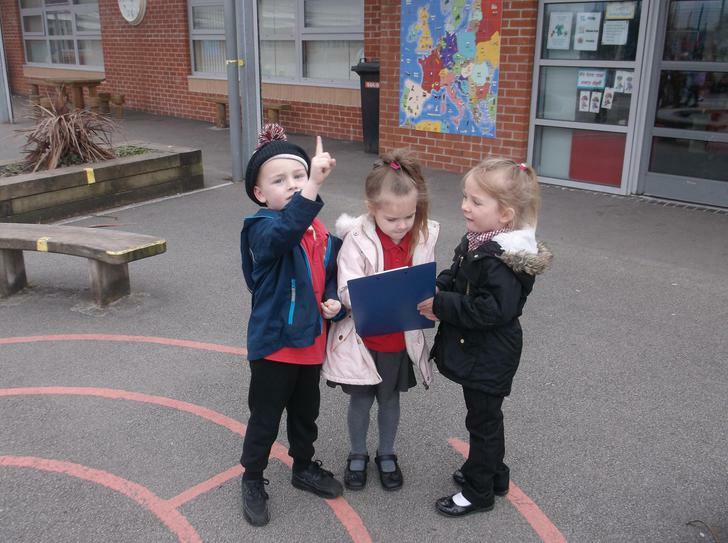 Here we are exploring the school trying to find further clues. 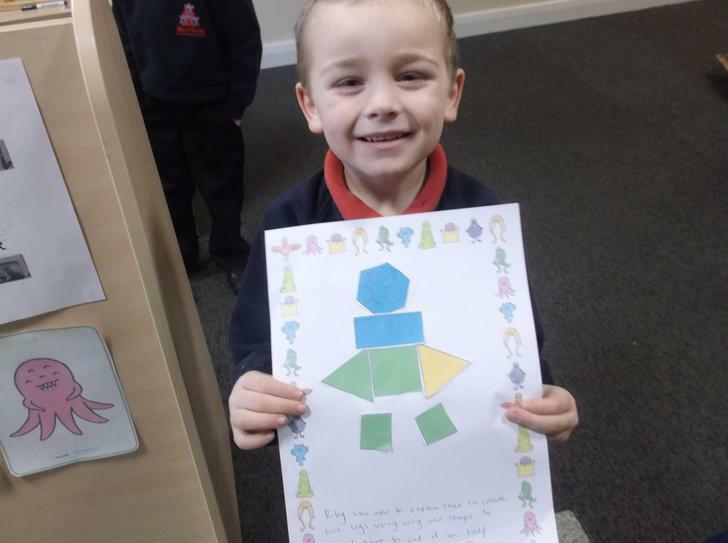 On Wednesday we arrived in school and discovered a letter from the alien saying that he had taken Edward the class teddy out to see the spaceship! 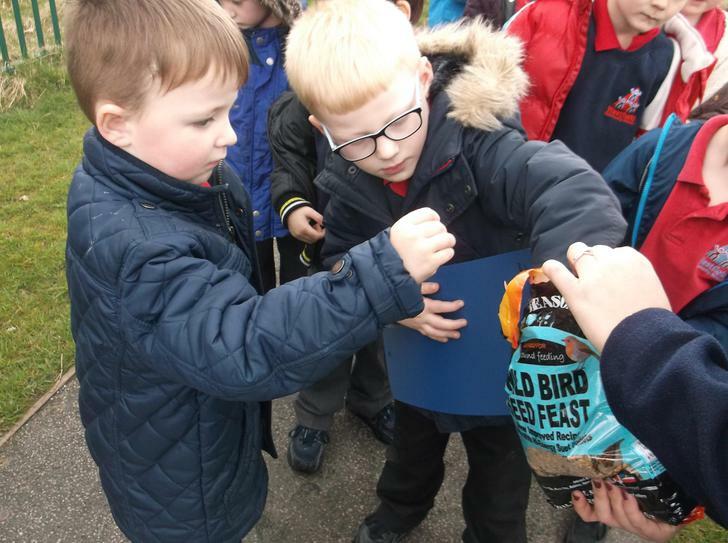 We then had a hunt to find Edward in school, we read the clues left and followed them and eventually found him on the Middle Phase with a gift for the class. An Alien Loves Underpants story! We really enjoyed listening to this. 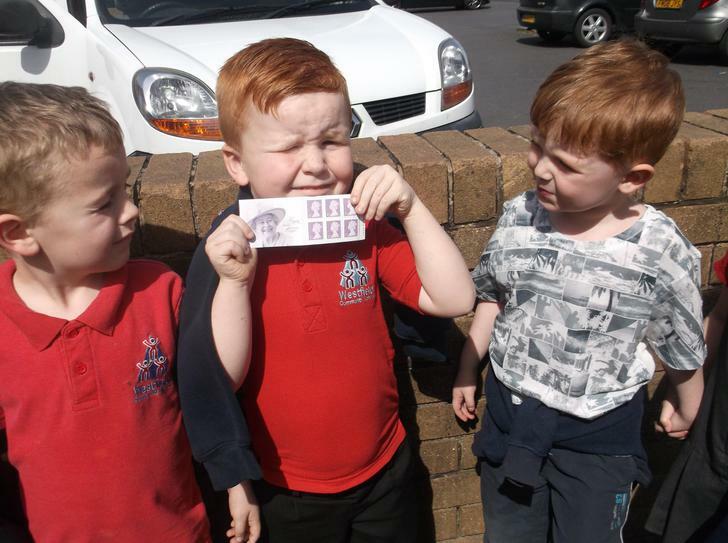 We then thought it would be nice to send the alien back to his planet with a gift from us. 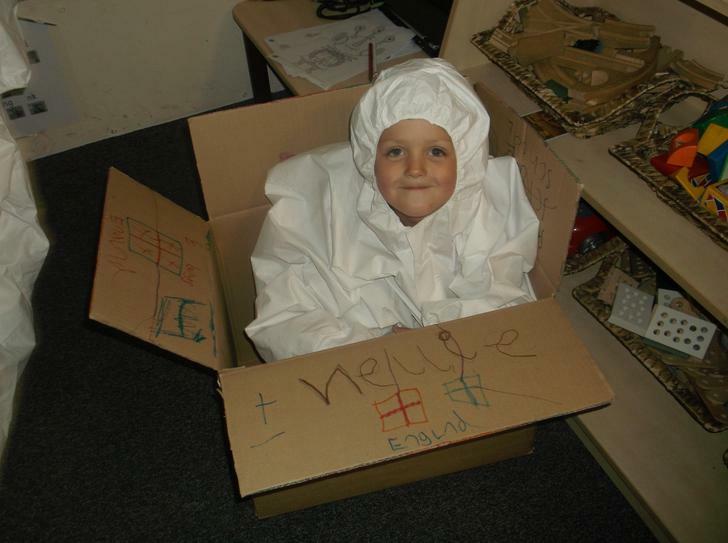 We thought for a while and then came up with the idea of making a mini alien who could travel back on the spaceship. 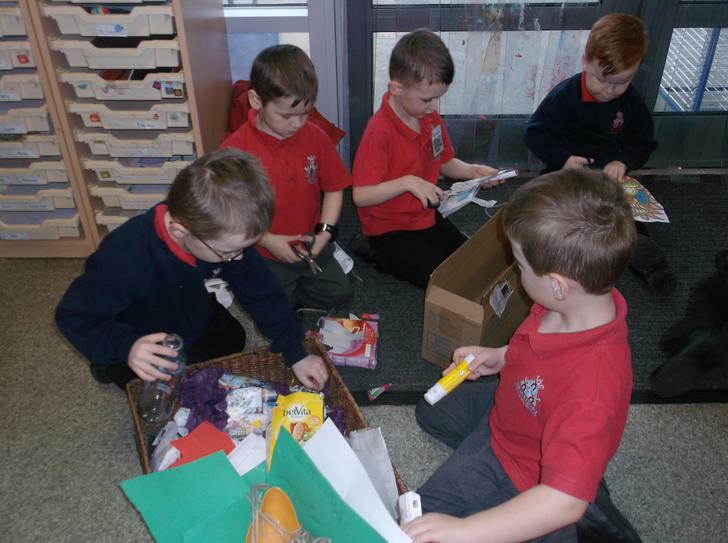 We gathered lots of different sized boxes, wrappers, materials and anything else we could find and created this fantastic piece of work. We also created our own alien place mats for our alien party on Friday afternoon and made some repeating pattern underpants just like we had seen in the Aliens love Underpants book. What a very busy and productive week! 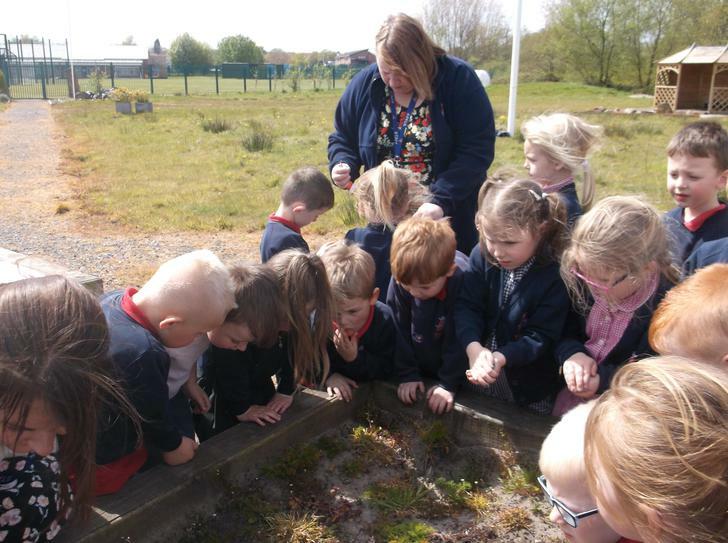 What a great week it has been in Reception W. This week we have been learning all about What the Ladybird Heard story. This was such a good book.It's all about a little Ladybird who heard something and soiled a plan to steal a prize cow. Even more impressive is the fact that the Ladybird didn't say a word! 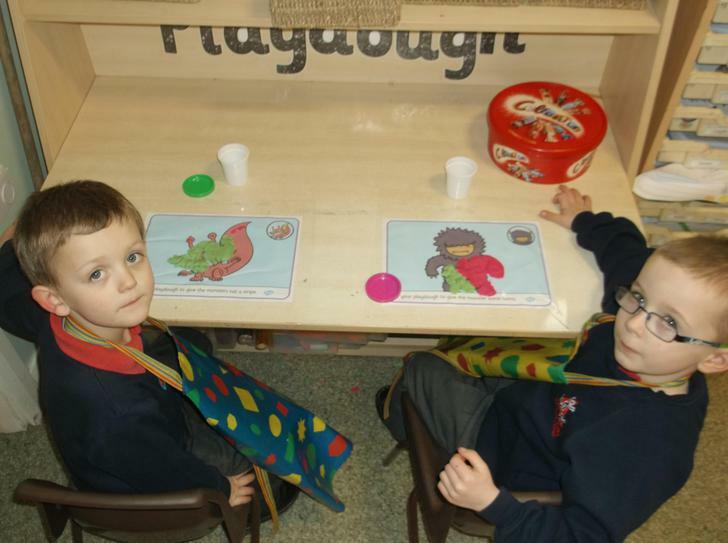 We started the week off with 2 different coloured sets of playdough, red and black. 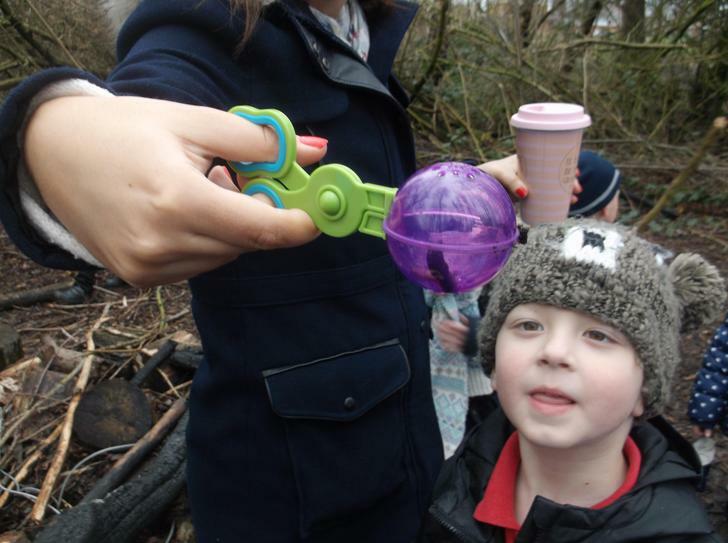 We used buttons, pipe cleaners, straws and different modelling tools to create, can you guess? We also created a character description for the three main characters in the story - Hefty Hugh, Lanky Len and the Ladybird. We talked about the best words we could use to describe them and sorted them into 2 lists. We have such a good imagination in our class. We also created wanted posters and posted them around our classroom. We talked about the story and imagined that we had actually changed the ending and that the prize cow was indeed stolen. This is the result of our hard work and efforts. The children were rightly proud of their posters and they look very realistic! We also introduced our new writing area. The children have really taken to it and have produced some amazing pieces of independent writing. 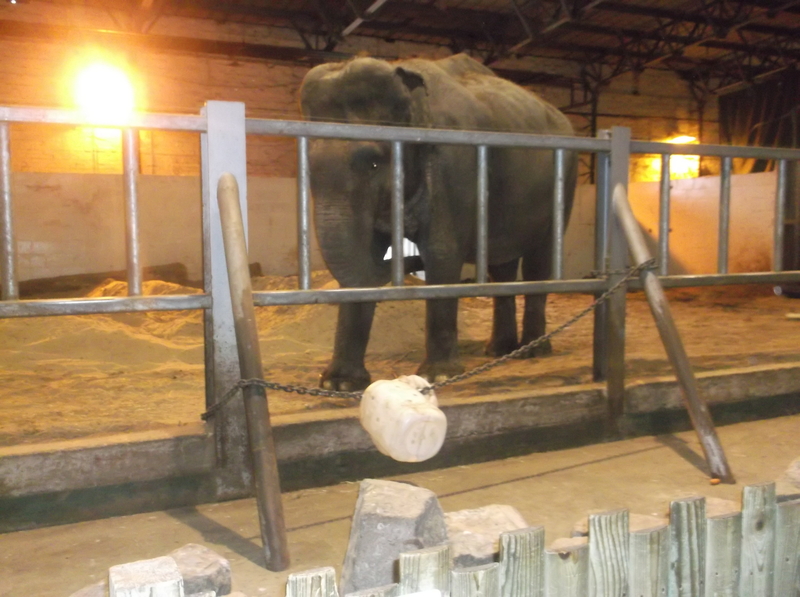 Here's Charlie being very busy! Welcome back to our blog. We have had such an amazing and exciting week. We started the week off thinking about Diwali. 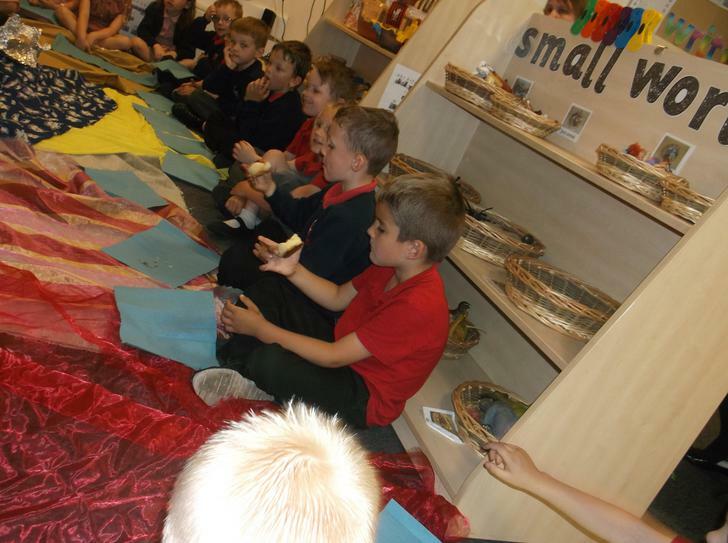 We talked about what Diwali is, who celebrates Diwali and how important it is in the lives of Hindu people. 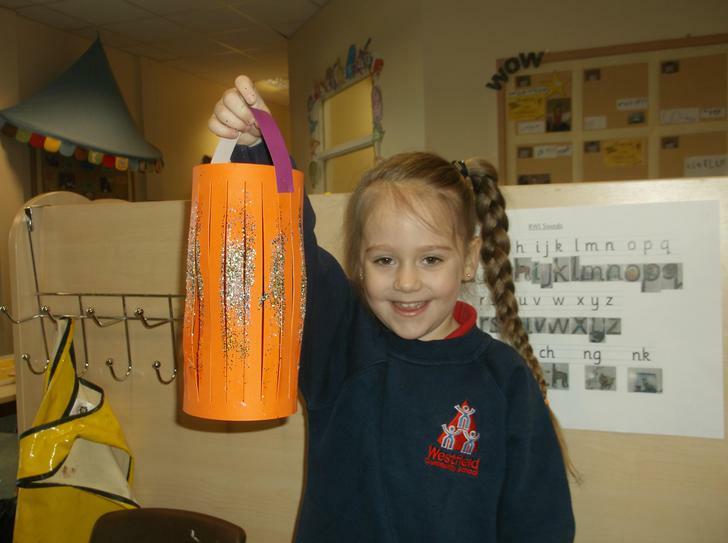 We started the week off talking about how Diwali is known as the Festival Of Light. We talked about where light comes from and the significance of it during Diwali. 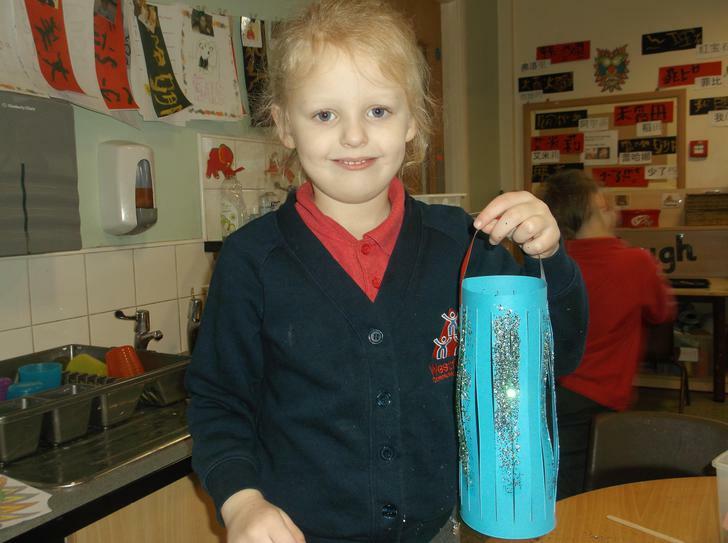 We created our own lanterns and these are now on display in the classroom. 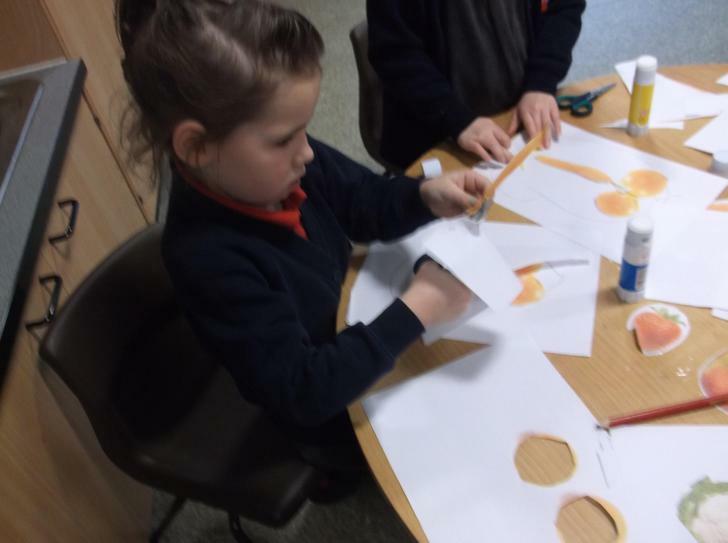 We developed our scissor skills and attached different media and solved problems as to how we would stick things together. It was a great speaking and listening exercise! We also took 2 minutes to remember the brave soldiers who dies in the war. 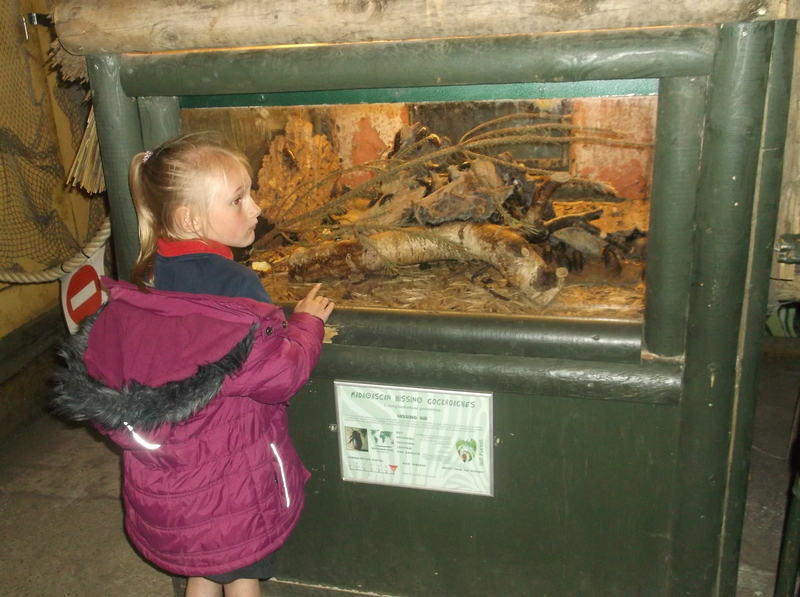 The children were really interested in this. 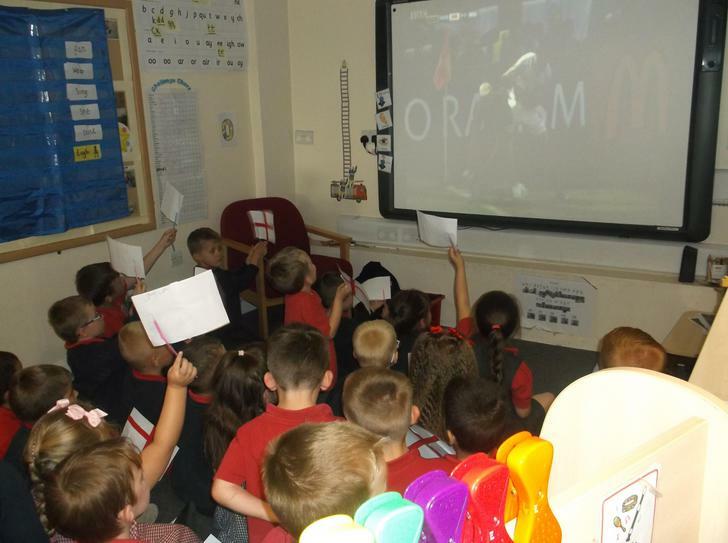 We watched the BBC news live on Wednesday and we joined in with the silence. 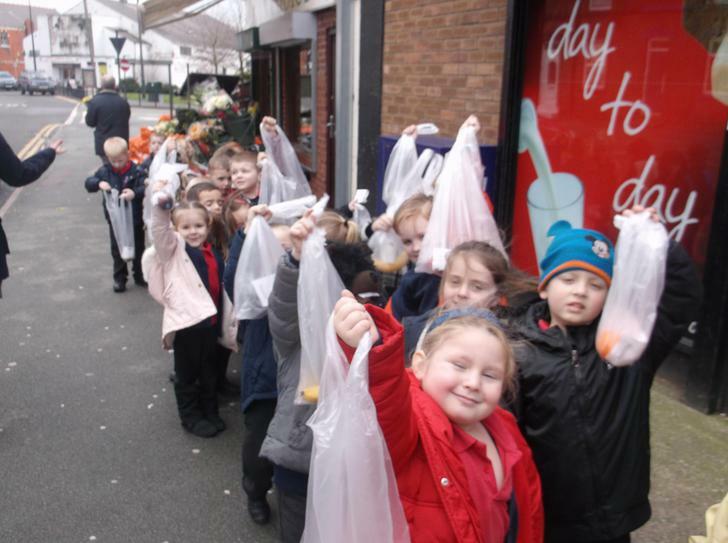 Lots of grown ups from around the school joined us in class and commented on how sensible we were. We know so much about Rememberance Day and we created own poppies using our finger prints so that each one would be different. In PE we completed some circuits. 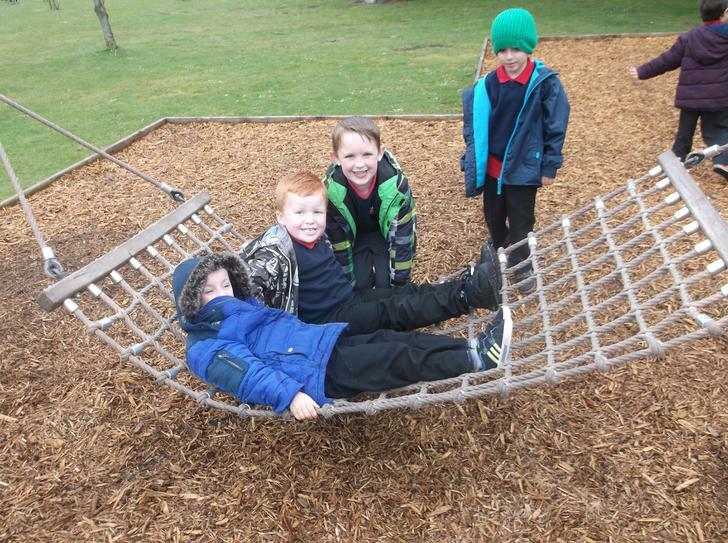 We looked at how we could move under, over, through and around objects and the skills we need to be able to do so. We have grown so much in confidence and control in such a short space of time and we are very proud of our achievements and rightly so. A big to everyone! We also created our own Mehndi patterns. We studied images of the various beautiful designs that Hindu women have on their hands and wrists. We spent time looking at the intricate shapes and patterns and talking about how these are created using henna. We used a brown felt tip pen to add the detail. We spent such a long time concentrating and producing really good designs. Don't they look great? Welcome back to our blog. We hope you had a great half term and are now ready to learn! 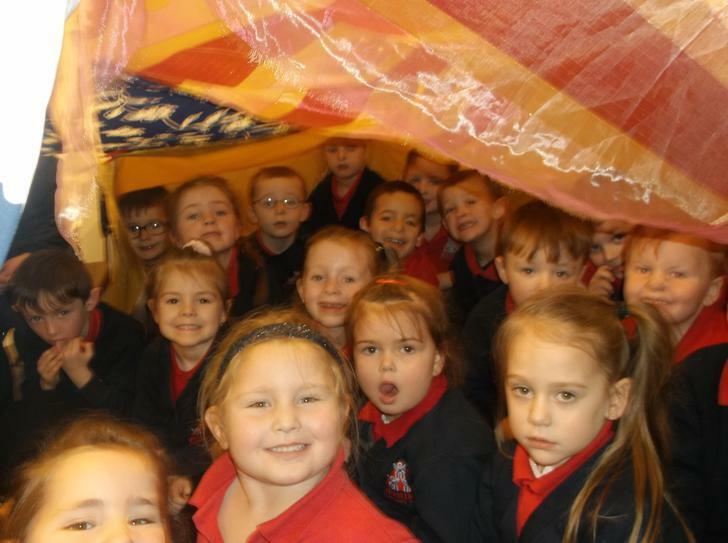 We have some very exciting weeks coming up but this week we have been busy learning all about Bonfire Night. 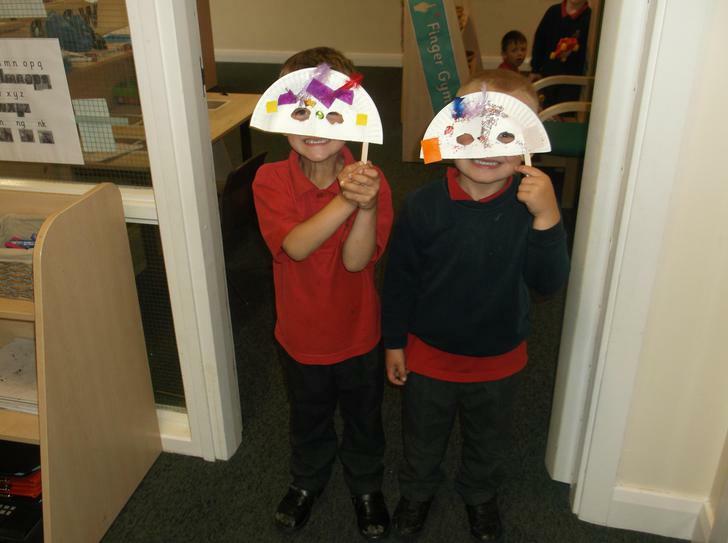 We talked about why we celebrate Bonfire Night and who Guy Fawkes was and what he did. 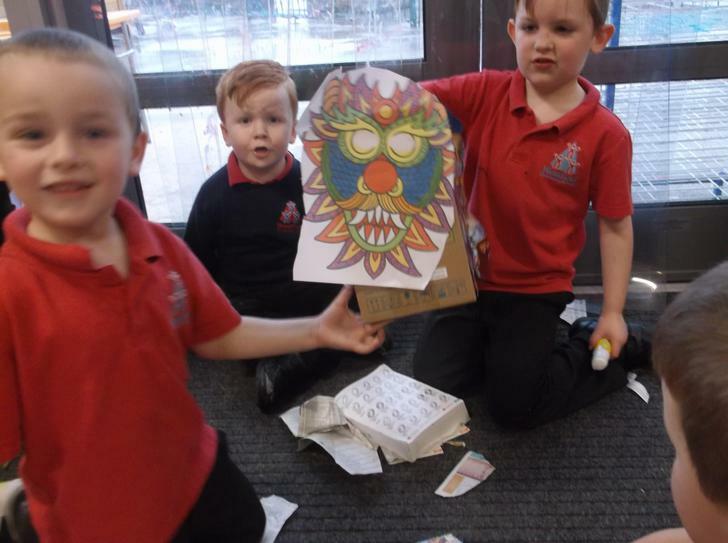 We started the week off using a mix of media to create Bonfire Night pictures. 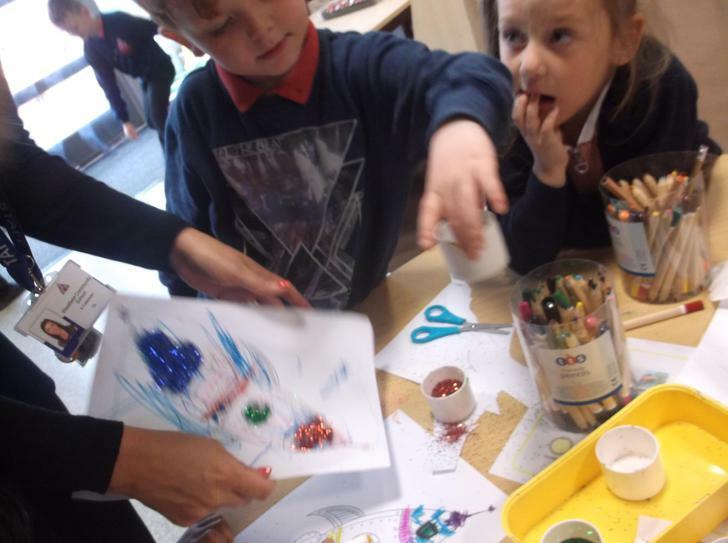 We used black sand and lots of different coloured glitter to make our firework images. We talked about shapes and learned some new words linked to Bonfire. We had a great time! We also updated one of the displays in our classroom. We talked about the different media we could use together for example paint, glue and crayons to make a lot of different effects. We also thought about the different ways in which we apply these different media and came up with the idea of using paintbrushes to spray the paint so it would look like fireworks were exploding. Wow it really did look good! 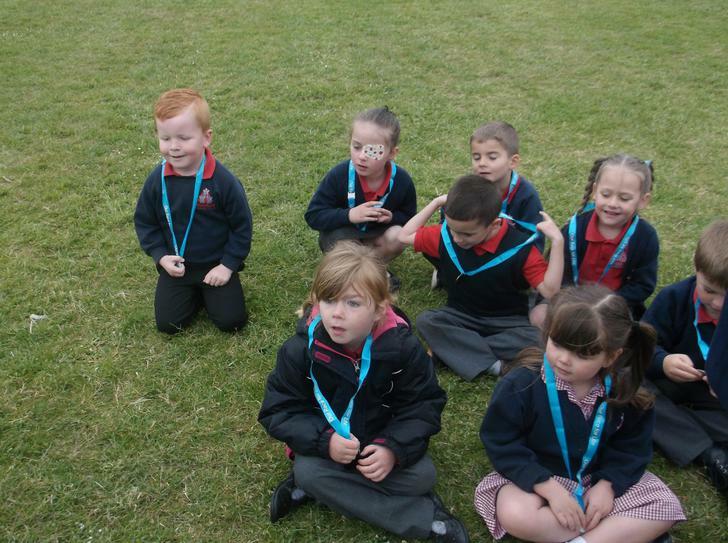 We then thought about the different words we could use to describe the sights, sounds and smells of Bonfire Night. Here are a small selection of some of words we have written. We even created our very own Guy Fawkes. We used old clothing and talked about how we were going to make him, what did we need and how would we keep the newspaper inside. A lot of problem solving. Here we are planning and designing Guy Fawkes and putting our plans into action. 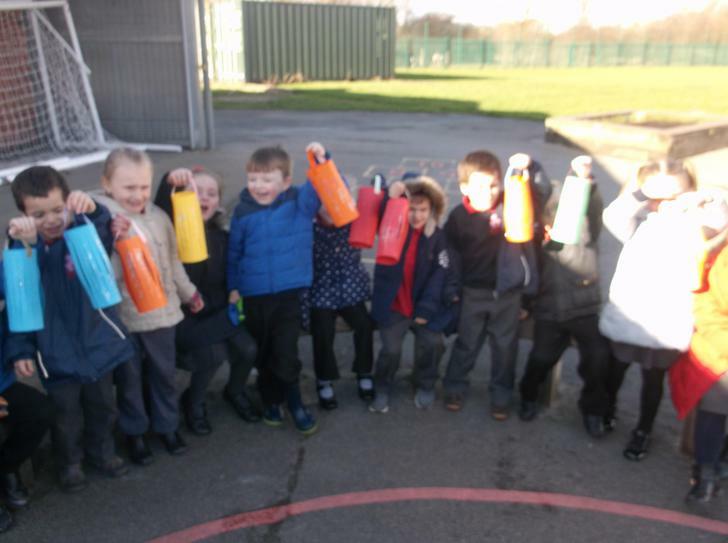 Thinking about Bonfire Night and how the sky is filled with different colours we conducted an experiment. 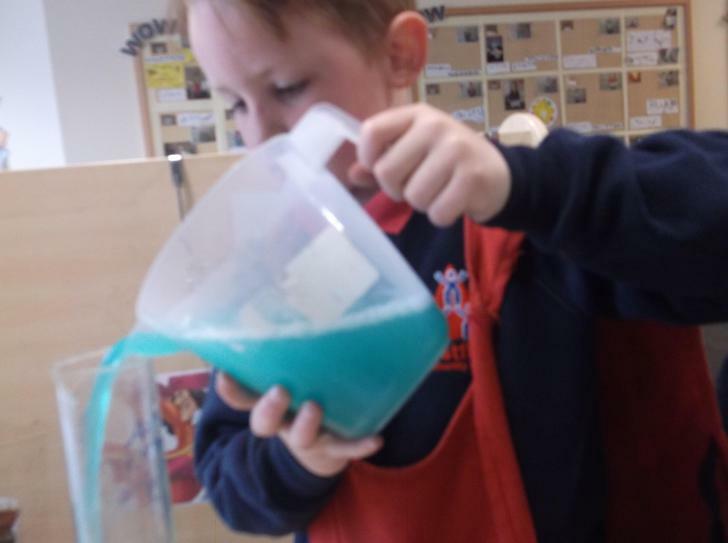 We used a little bit of milk and some food colouring and added a little washing up liquid and watched how the colours mixed into one and created new ones. This was so interesting and was another opportunity to see how colours when mixed together can create new ones. 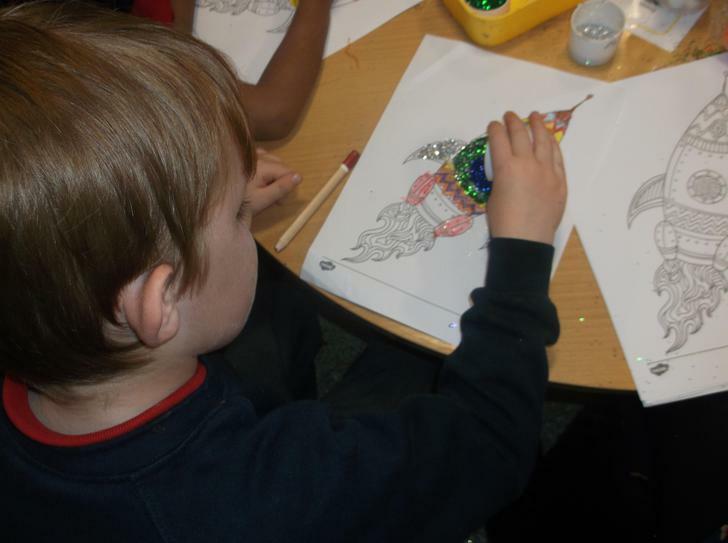 Please visit our blog again next week to find out more about Diwali, what it is and how it is celebrated. Have a great weekend. 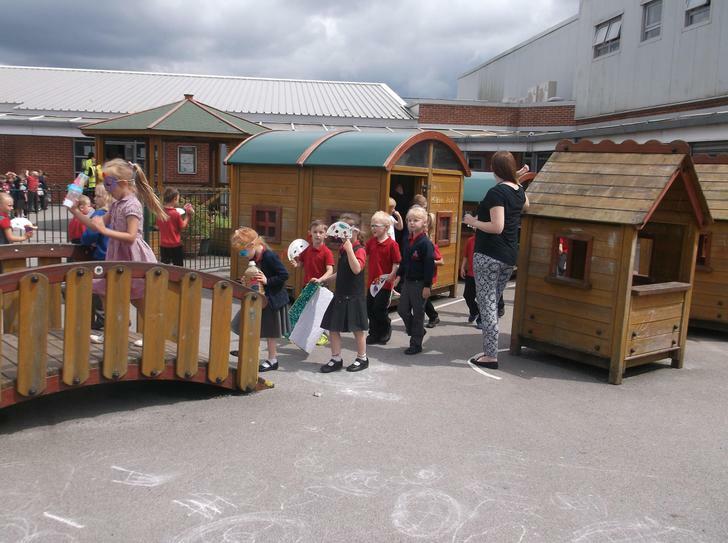 Staff and children in Reception W.
What an amazing, exciting and eventful week we have had. This week we have been so very busy learning all about Autumn. 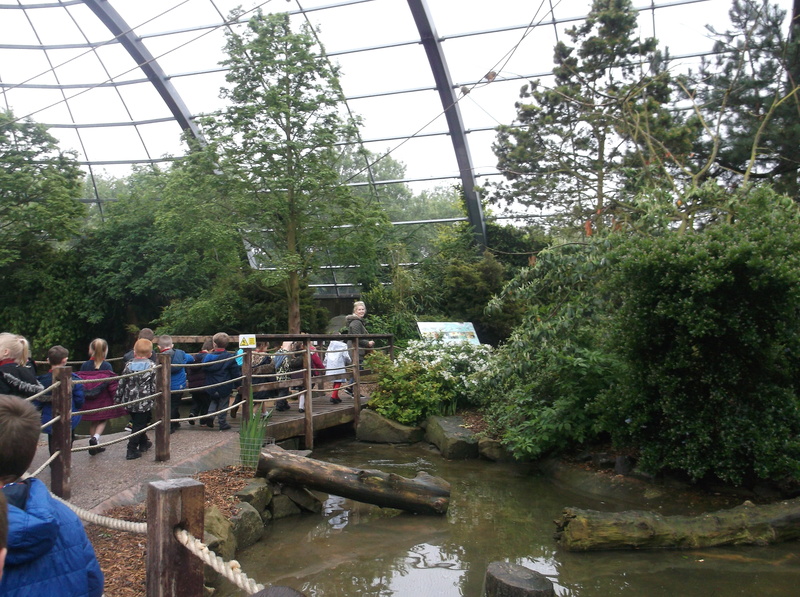 We have talked about the changes in seasons and how we change as well. 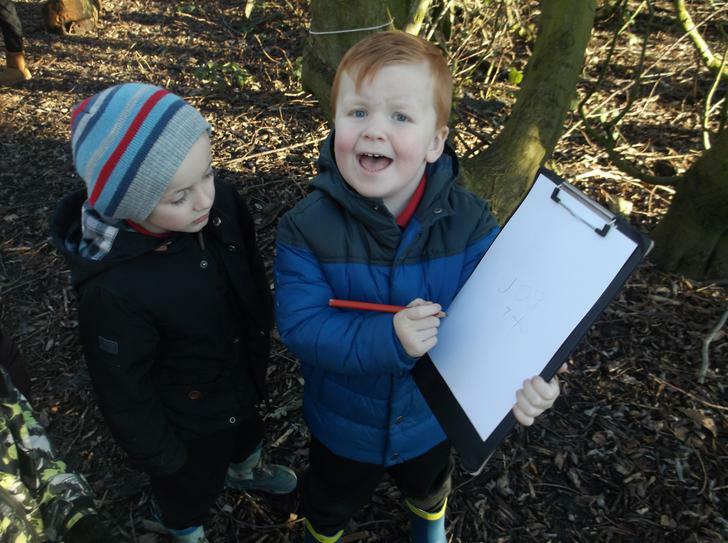 We also used leaves and other items to make a tally chart. We sorted the objects into different sections and added labels and talked about which items had most, least, more than and less than. 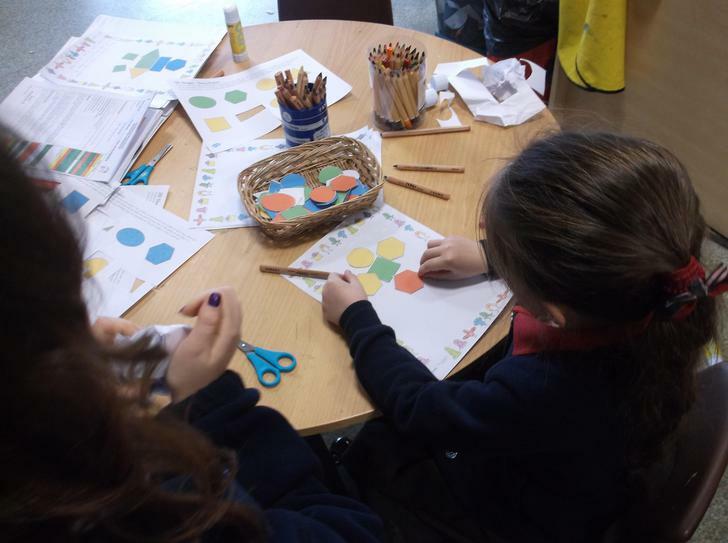 This really helped develop our mathematical skills and was a great talking activity! Oh my goodness, there were cakes everywhere and they looked and tasted amazing. Thank you to all those people who took part we managed to raise a great deal of money. Here are just a small sample of the delicious offerings. 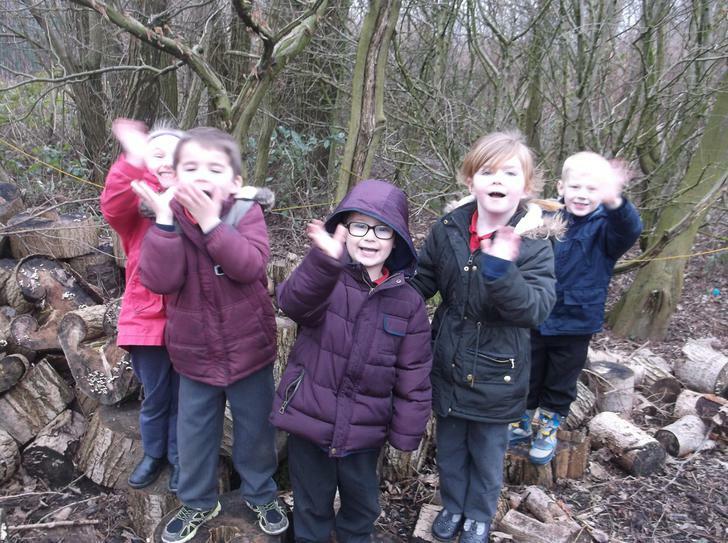 Then to finish the week off on a high we went on our trip to Delamere Forest. What a great day! 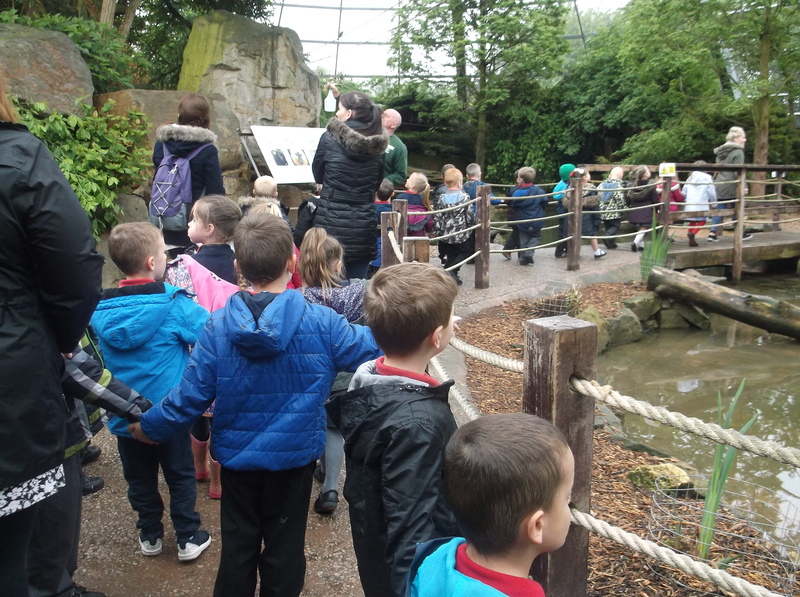 The weather was kind to us and the children were so very well behaved. 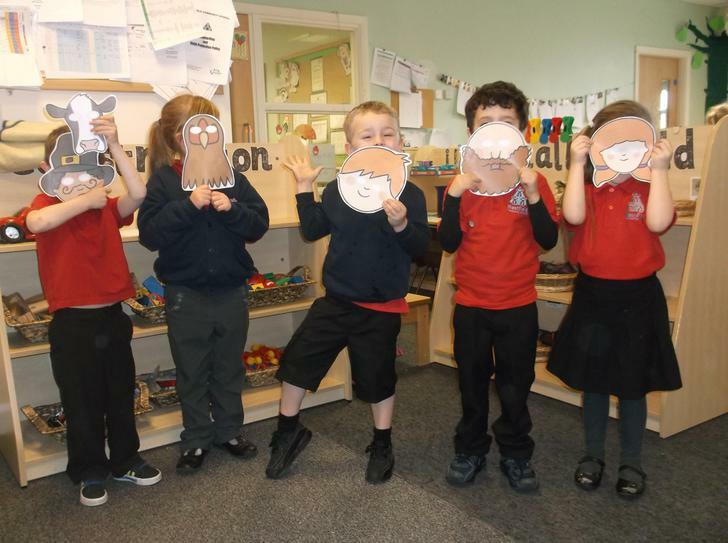 We even managed to find the Gruffalo after a very, very long walk through the woods to his hiding place. 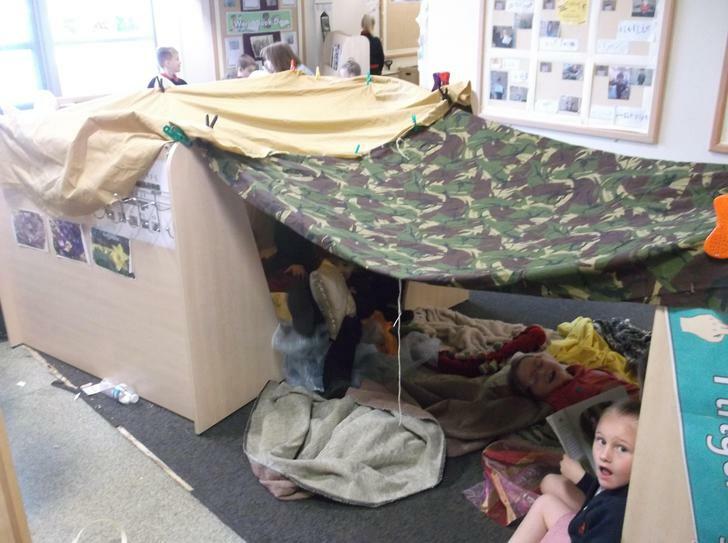 We demonstrated our den building skills and proved how we could hide from the Gruffalo. 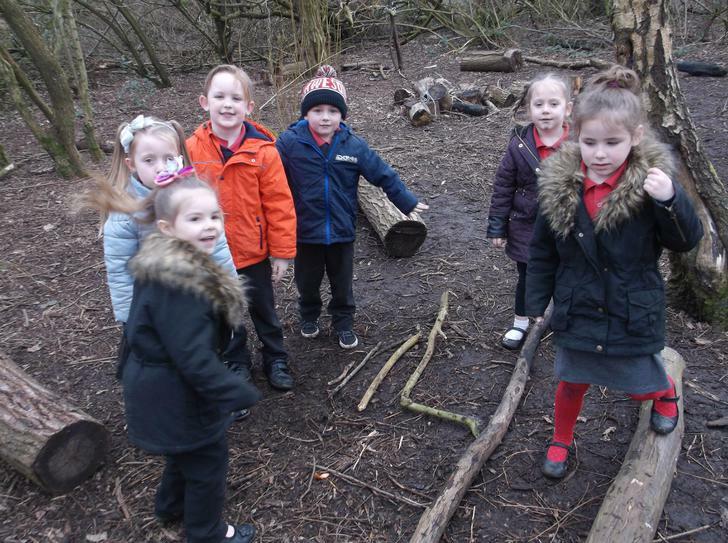 We made some super dens of different sizes. 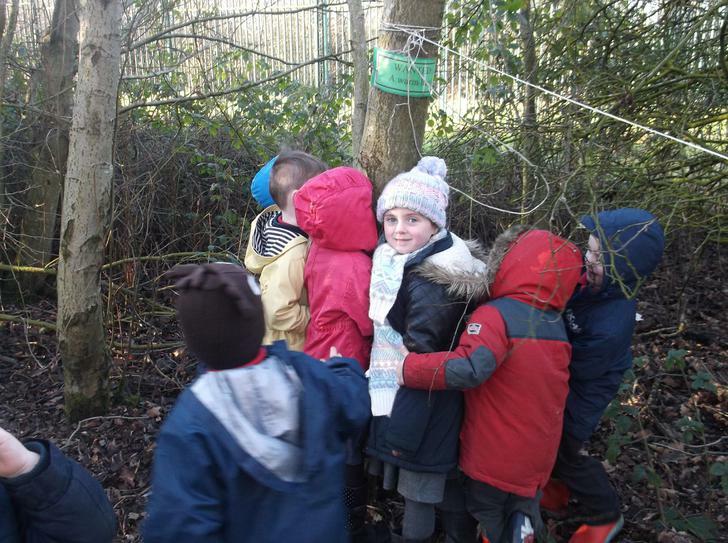 shhhhhhh so the Gruffalo doesn't hear us! We hope that you have a great half term and we will see you all again on Monday 2nd November. 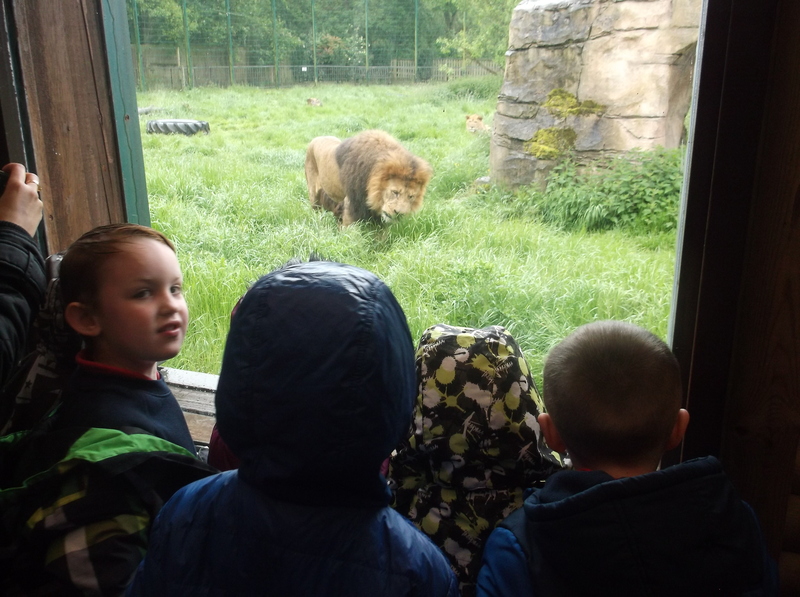 Welcome back to our blog and we want to say a BIG thank you to all of those parents who we saw this week, it was lovely to meet you all and we hope that you found the information we shared with you really useful. 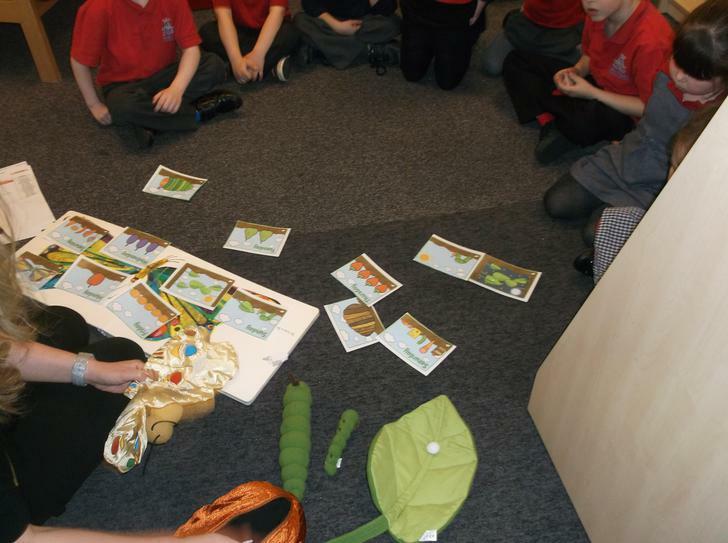 This week we have been busy learning all about autumn, using the text Percy the Park Keeper. 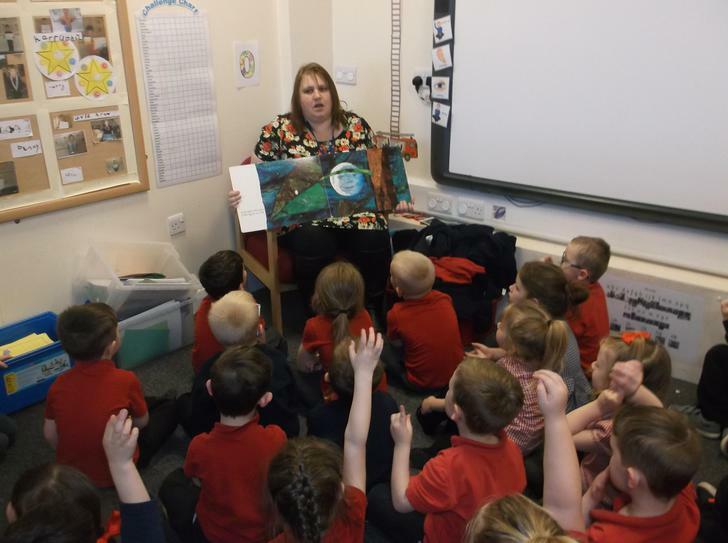 We loved listening to this story, we talked in great detail about the animals in the story, what autumn looks like and how this season differs from other seasons. Very informative! 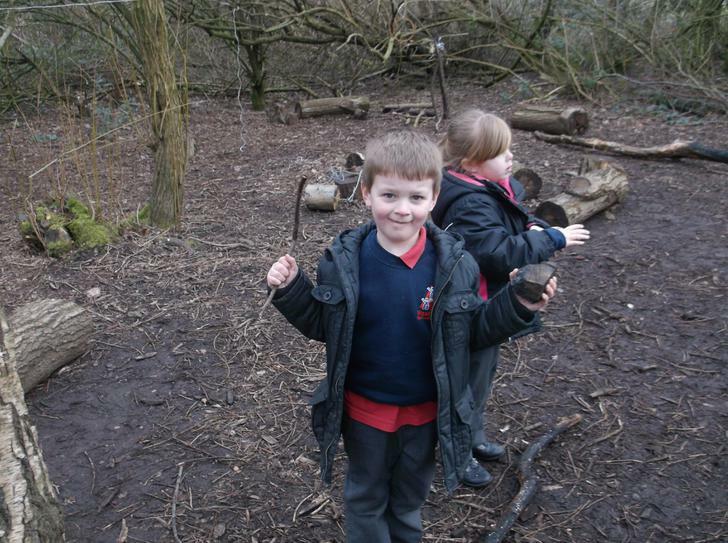 We also used the natural objects that we found on our nature walk to make pictures of different objects, in particular, minibeasts. We learned about the number of legs some creatures have, how their bodies move and what they like to eat. Take a look at our masterpieces. 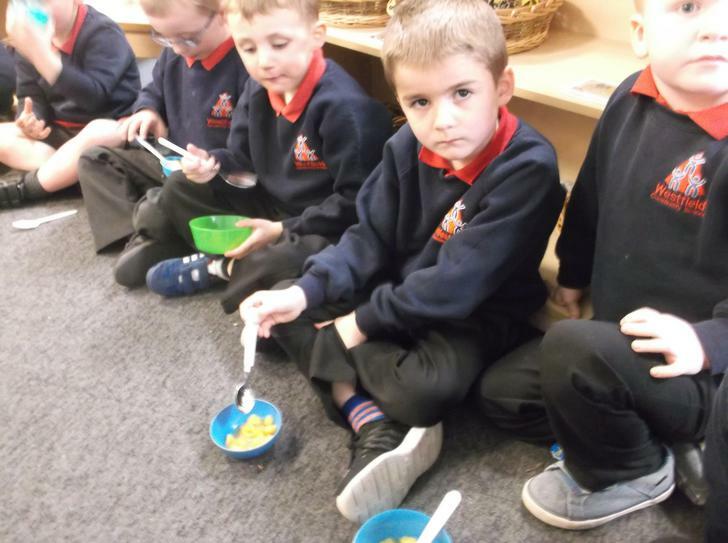 We have also been developing our senses. We used a variety of different spices and added a little water and used them to pain stripes from top to bottom and from left to right. This was so interesting. 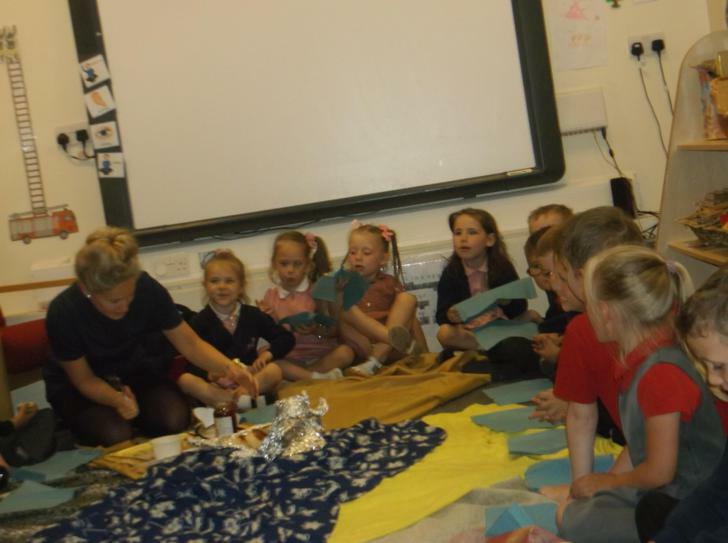 We managed to capture some of the smells of autumn and we talked about how important our senses are. We had such a great time. 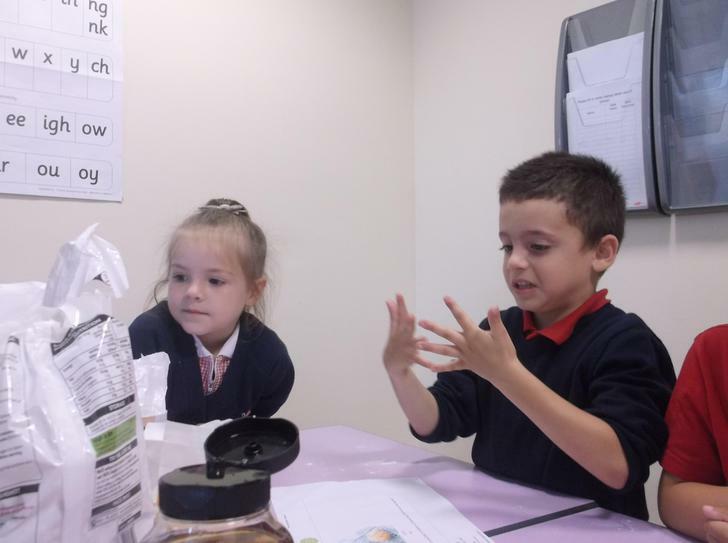 We also developed our knowledge of textures, we talked about the veins we have in our body and how leaves also have veins. This was something new and exciting for us all. We used autumn colours to make rubbings and talk about how they suddenly appear through the paper. A little like magic. We are intending to use as backing paper on a board and this will be up after the holidays. 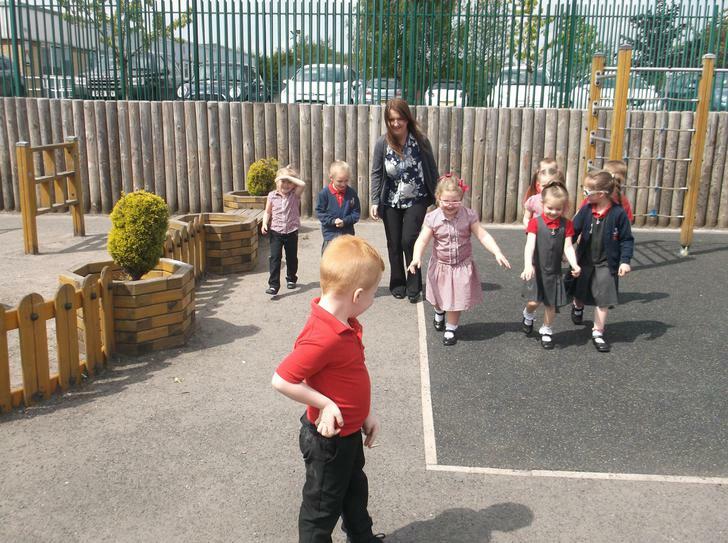 We also took the opportunity to get out and about around school. We went on a nature walk and talked about the changing seasons. 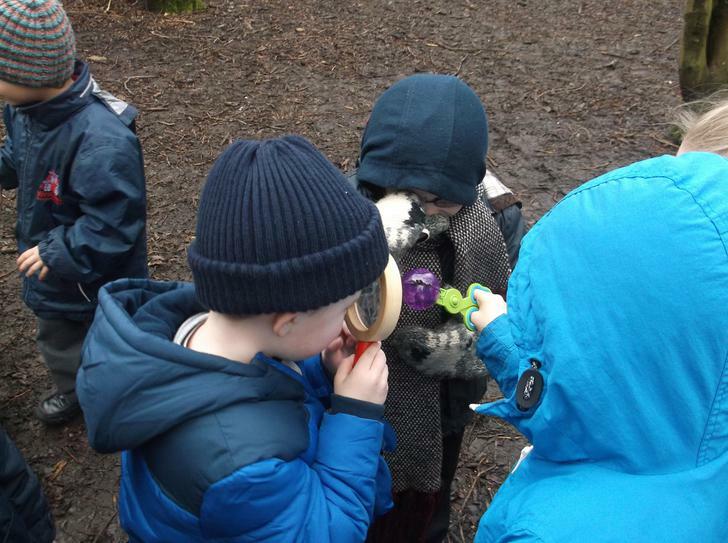 We went out of school and found some autumn bits and pieces, we used them to talk about height - who had the tallest twig, length - who had the longest leaf and lots of other mathematical language. 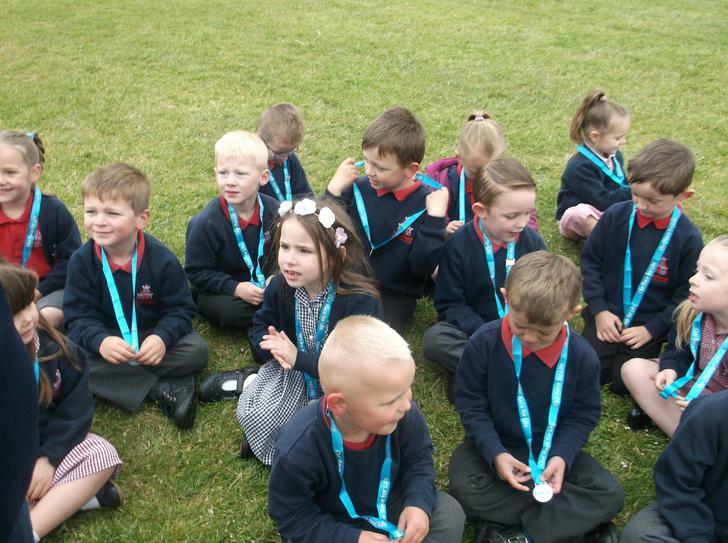 We were so well behaved and a real credit to the school. Welcome back to our blog. 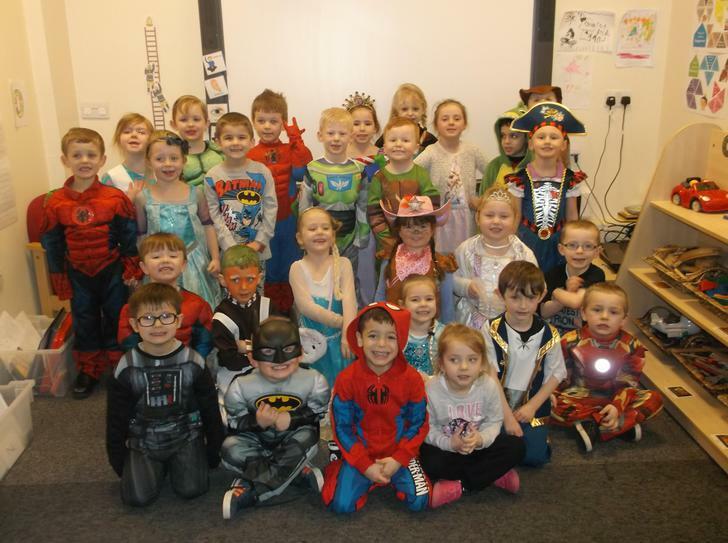 This week has been a busy week and we have been learning all about Superheroes. We have been busy developing our reading skills and used Superheroes as a focus for developing our segmenting and blending skills. We are continuing to do Read Write Inc everyday and this is really beginning to pay off so thank you to all those parents who support this by practising letter formation at home. 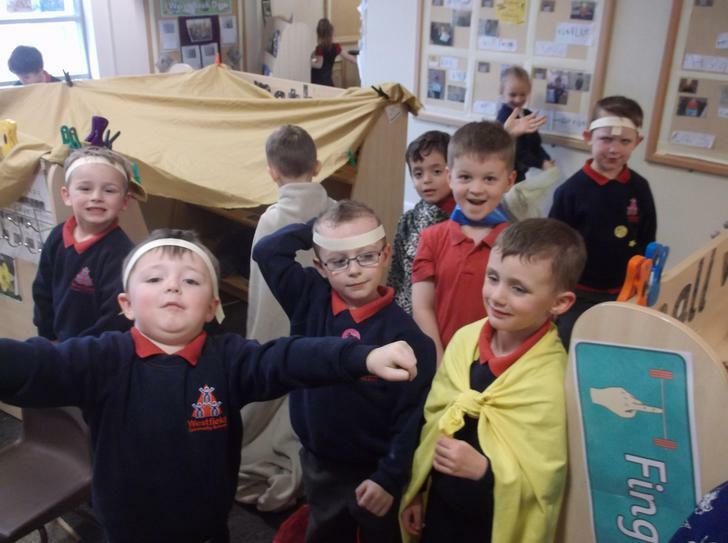 We also developed our fine motor control and used pipe cleaners, tin foil and sellotape to bend and manipulate the pipe cleaners into the shape of a superhero, this was a little tricky but we didn't give up and with a little patience and time we perfected this skills and we created our own action hero figures. We also readily accepted a challenge, we had to thread a superhero in less than a minute. This was so much fun, we talked about going up, down, up and down and this helped to remind us the direction we needed to follow. 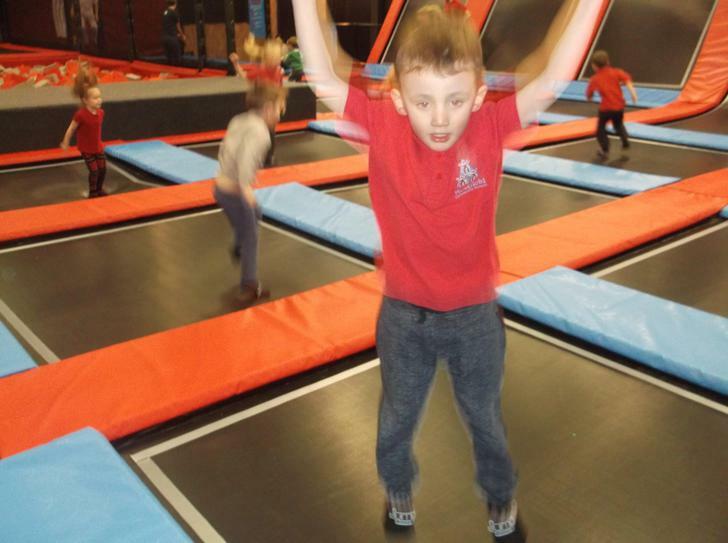 We then made it even more tricky by using smaller superheroes and trying to beat our best time. 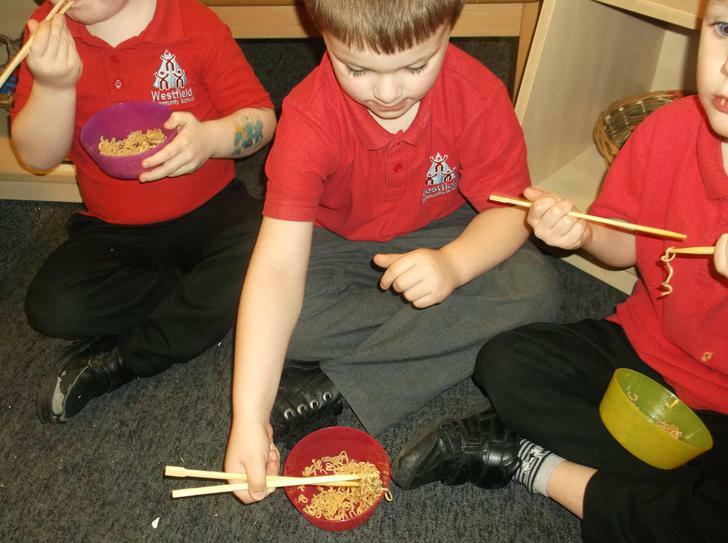 This activity was really good for helping us with our pincer grip and developing our pencil control. We also had a great time when we went to visit the book fair. 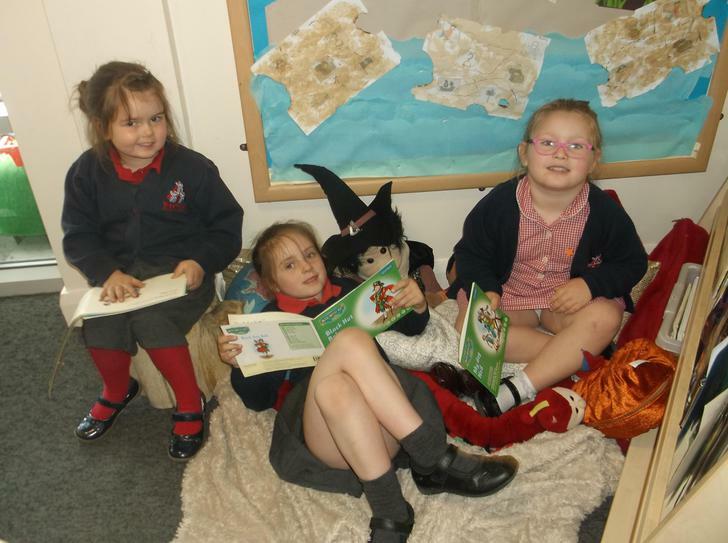 We loved choosing our own stories and having the Year 6 children read to us. 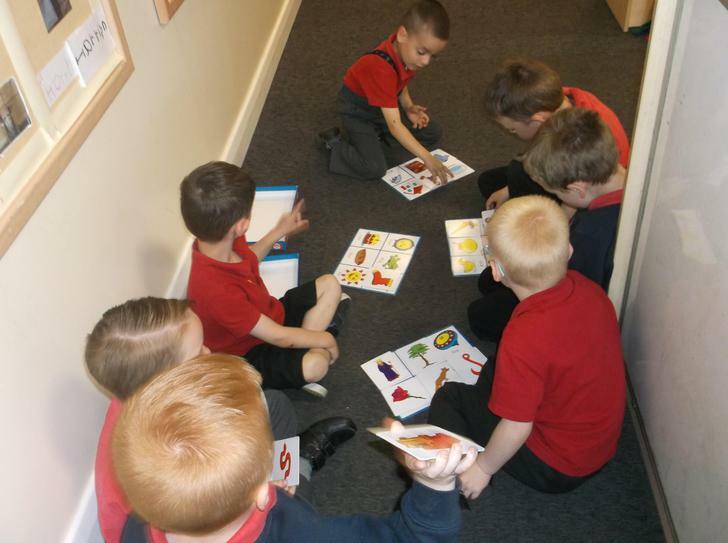 We talked about the different types of books that we could choose from for example for example story books, information books and sticker books and we talked about which we liked the best. 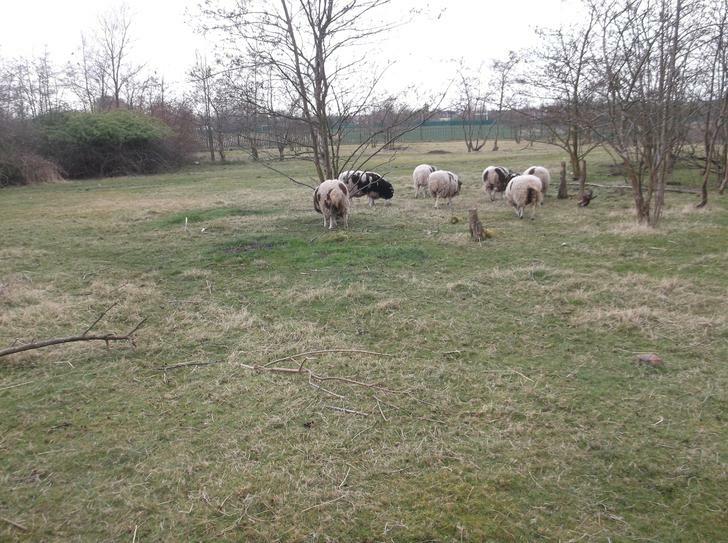 Here are some pictures of us enjoying our time. We have had a very productive week this week and we have been busy busy learning. 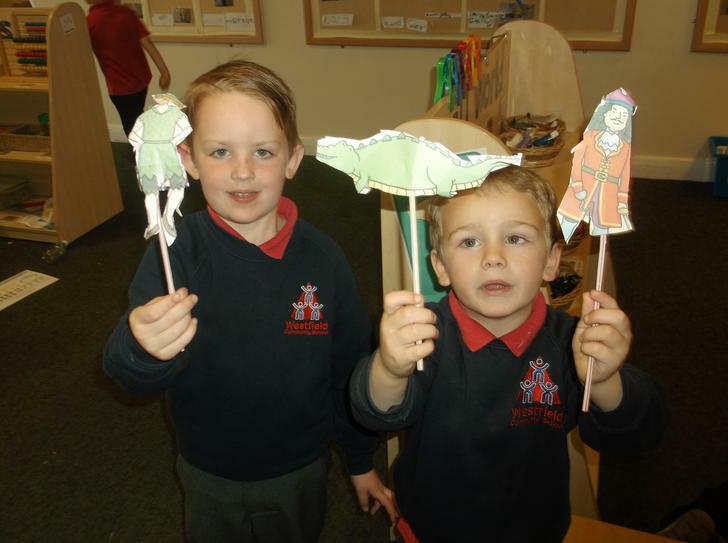 This week we have been using dinosaurs as our focus for learning. We started the week off by listening to a story all about dinosaurs and thinking about how they moved, where they lived and what they looked like. 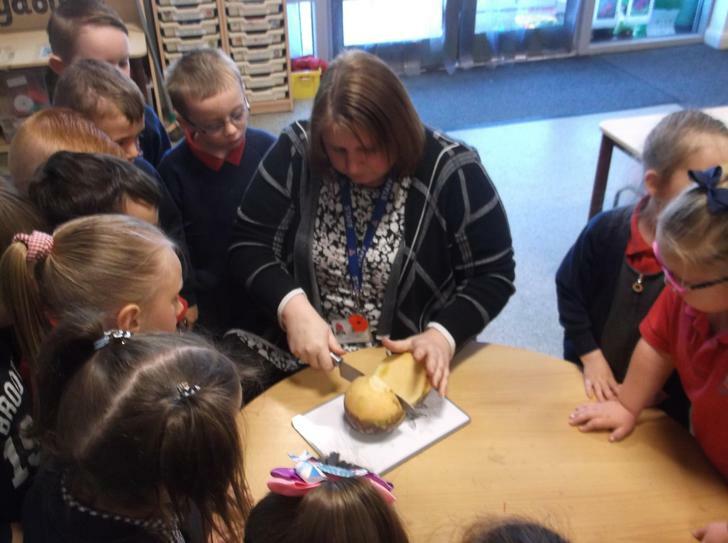 We also learned about fossils and we now know that these are bones embedded on rocks and stones from millions and millions of years ago. 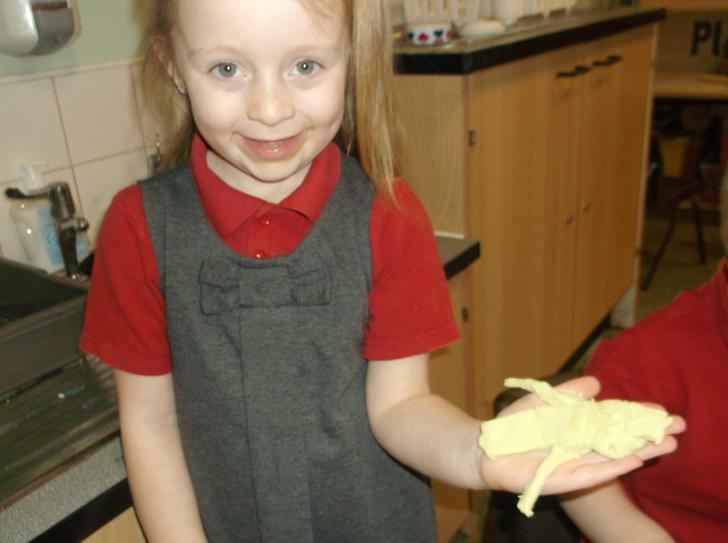 We decided that we would make our own fossils using salt dough and the dinosaurs we had in class. Take a look at our efforts. Kaisie - I would scream really loud and then find somewhere to hide. 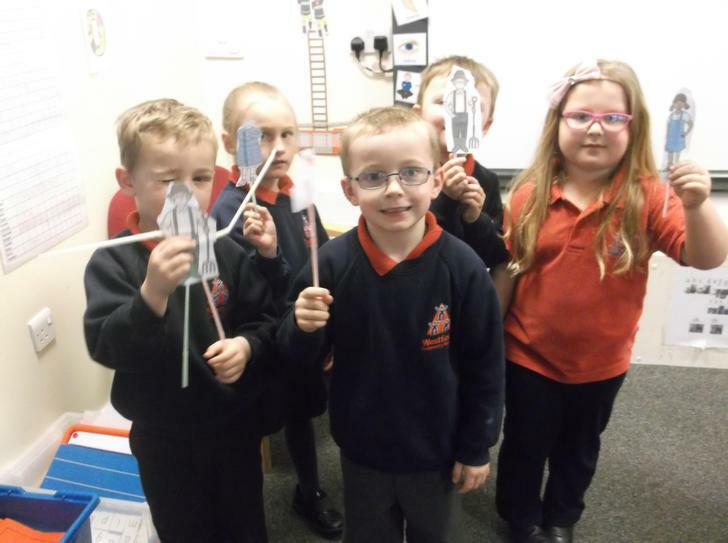 When we write this is our chance to put into practice everything we learn in Read Write Inc.
We also used straws and cut them up to make them look like bones and then used them to create a dinosaur skeleton picture. We talked about bones, long and short and used the chance to share our new learning with our friends. We had lots of good ideas but decided to go with the hot water. and guess what? It worked! 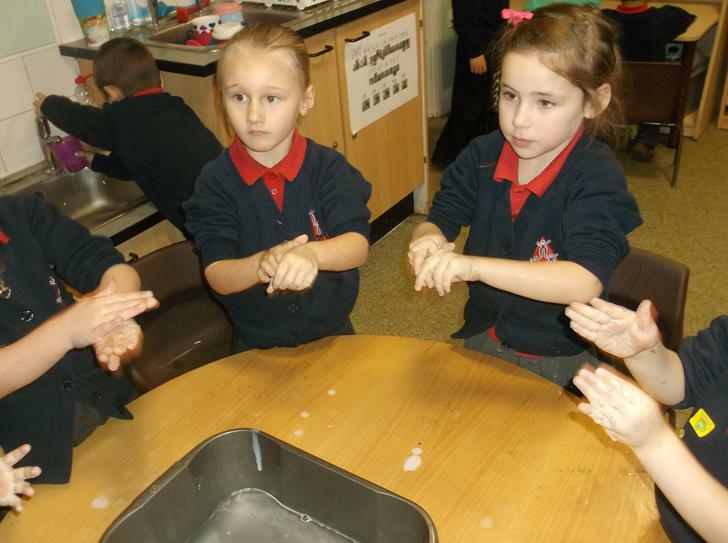 We talked about how ice melts, how water freezes and how it feels to hold the ice in our hands, brrrrrrrr it was so very cold! We also used dinosaurs to mix paints. How can you do that i hear you ask? 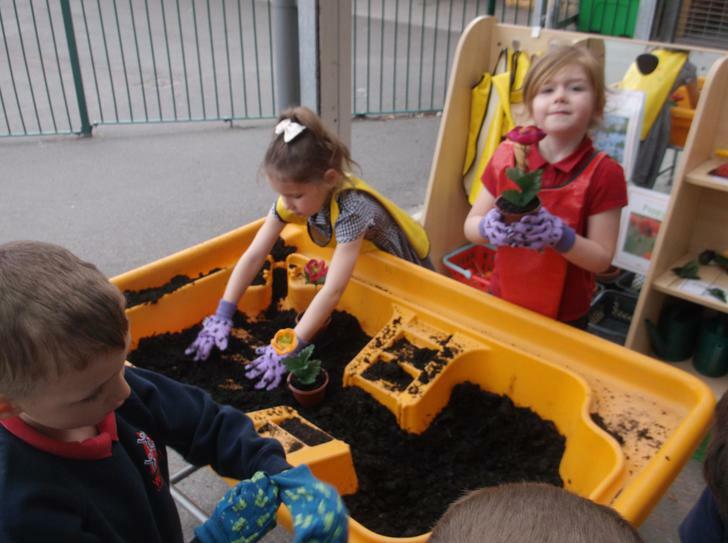 Well we put lots of different coloured paint into large tray and using the dinosaurs we pretended they were stomping around, they mixed the colous up with their feet and created multi coloured footsteps everywhere, giving us a clue as to where they had gone. This was so much fun and the results look really effective. Come into class and have a little look at them. 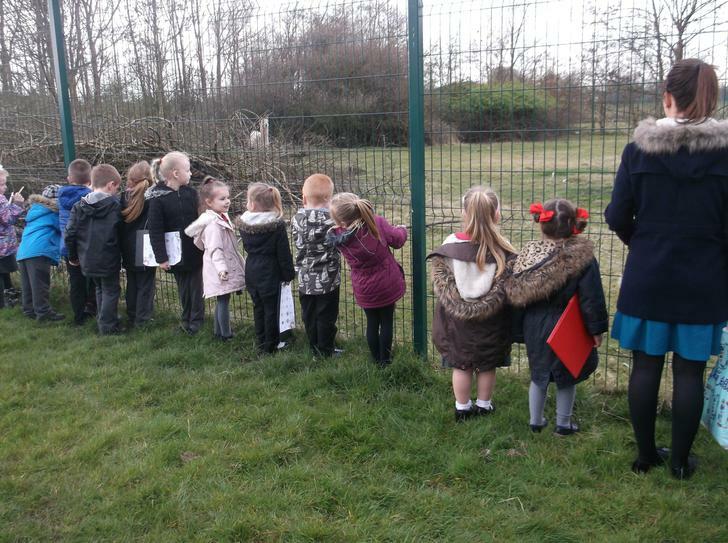 We have had yet another fun filled week learning all about owls and where they live and what they eat. 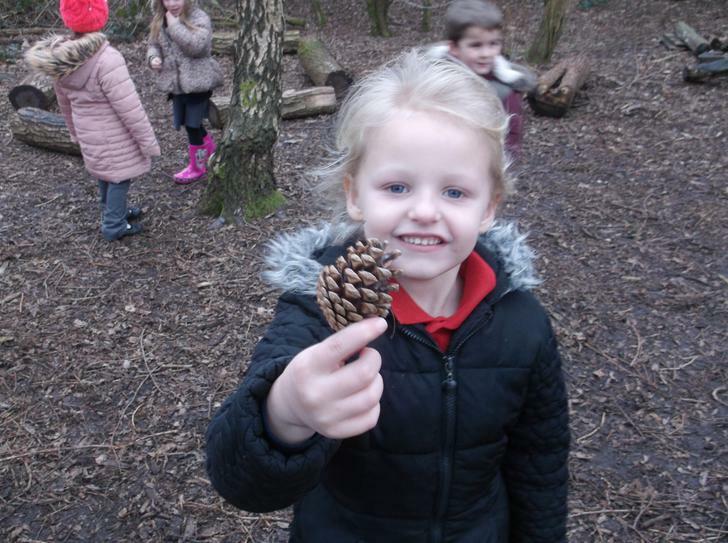 We started the week off using pine cones and transforming them into miniature owl babies. These are now on display near the classroom outside door and you will see that each one looks different. 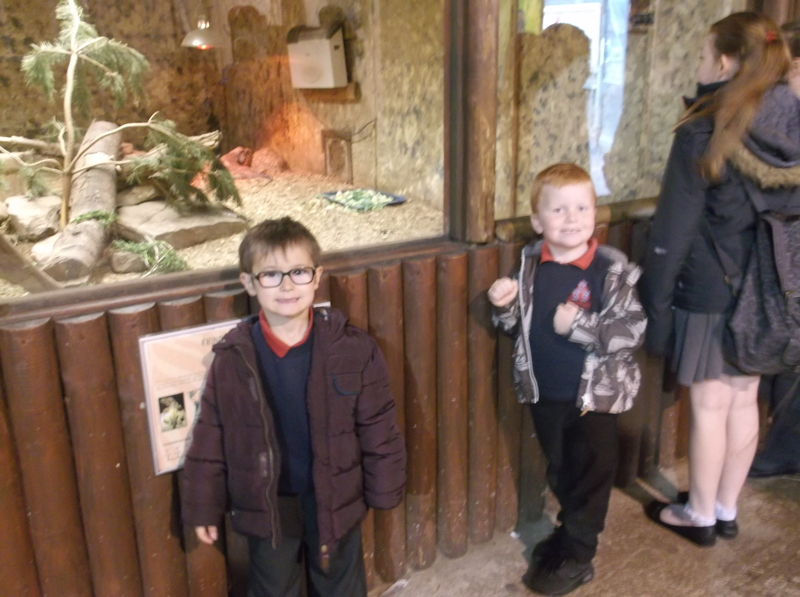 We also explored different media and studied how owls look. We talked about shape, texture, colour and created these very detailed owl images. 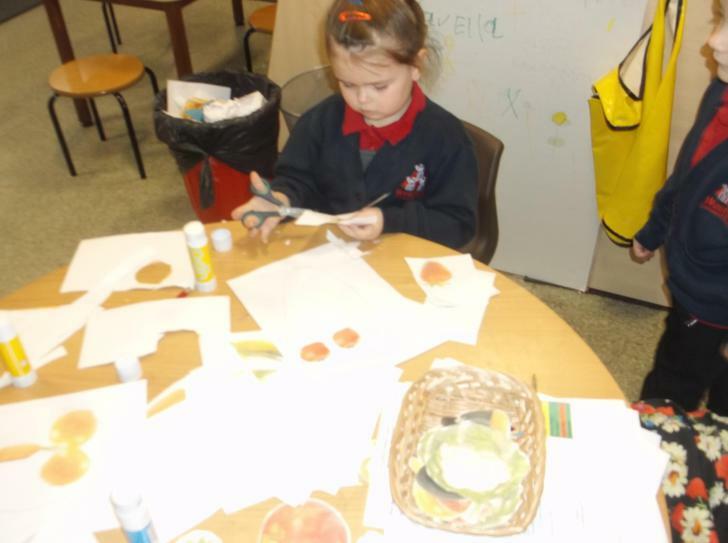 Then, later on in the week, we added detail using a range of natural materials such as shavings, wooden sticks ad pastel crayons. These are going to look great on the window in our classroom. 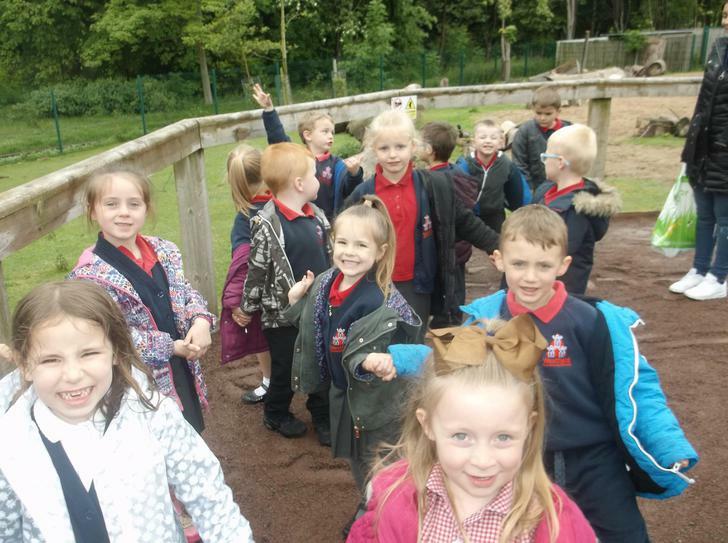 We also explored the ALPS for the first time in Reception. 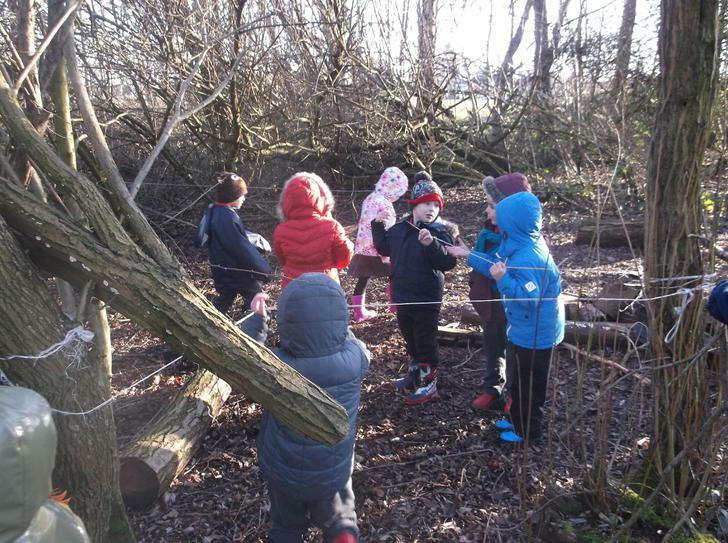 Some of us used information and story books and found out lots of interesting facts about owls for example where they live and what they eat and then some of us went into the woodland area and used natural materials to make a nest fit for an owl baby. 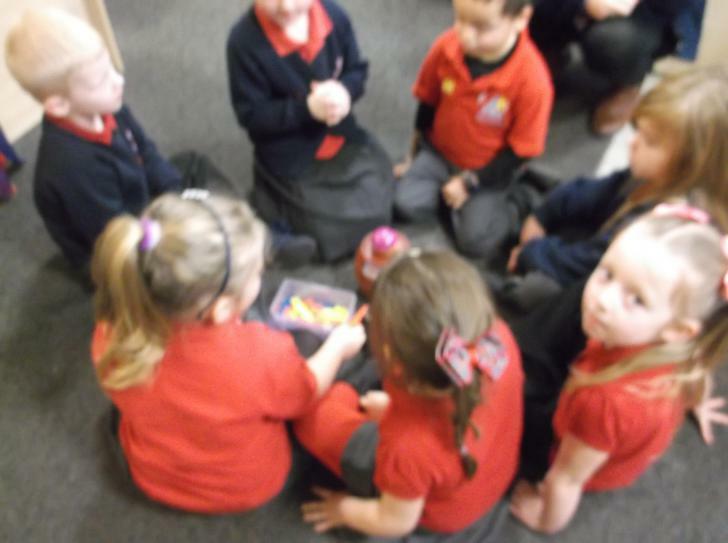 We then sapped over and shared our ideas with our friends. 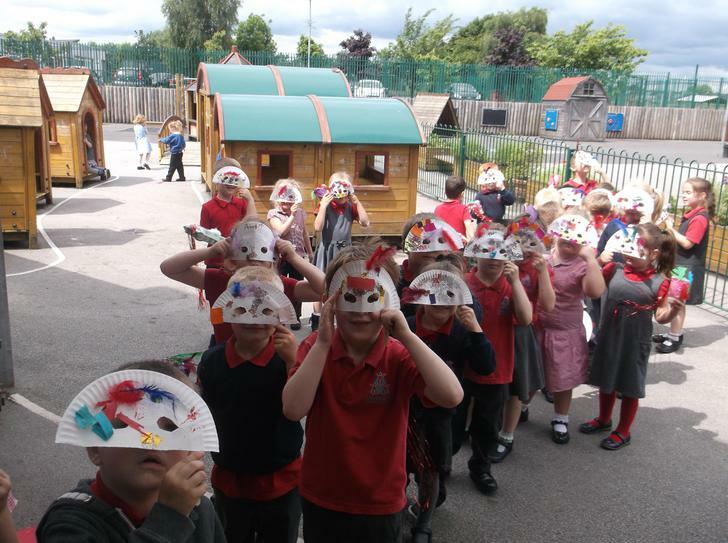 We had a great time and the pictures show what a creative lot we are. 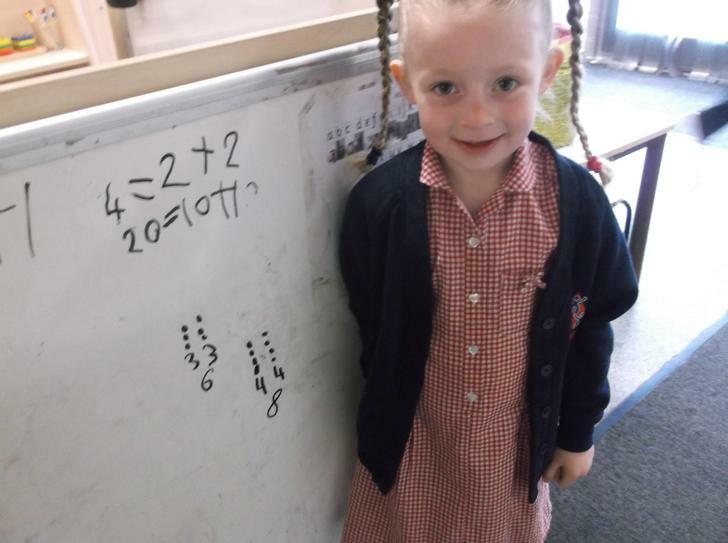 We have also been developing our number recognition by ordering owl numbers and talking about and learning what number comes before and after a given number. 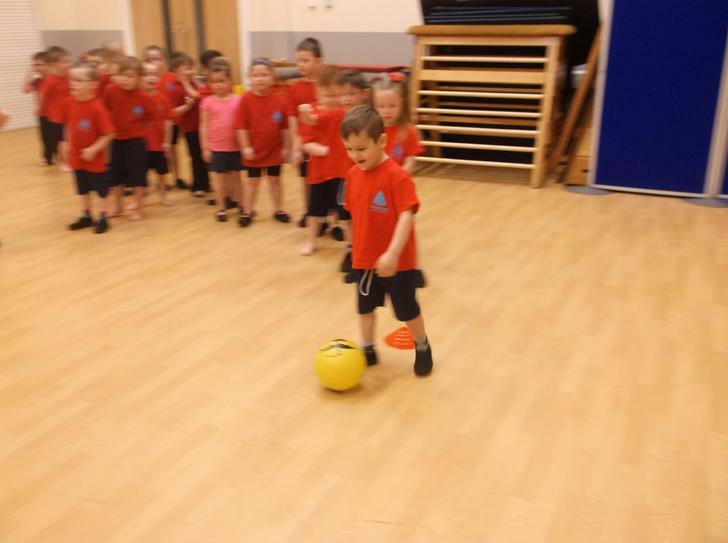 We also had a great time in PE. 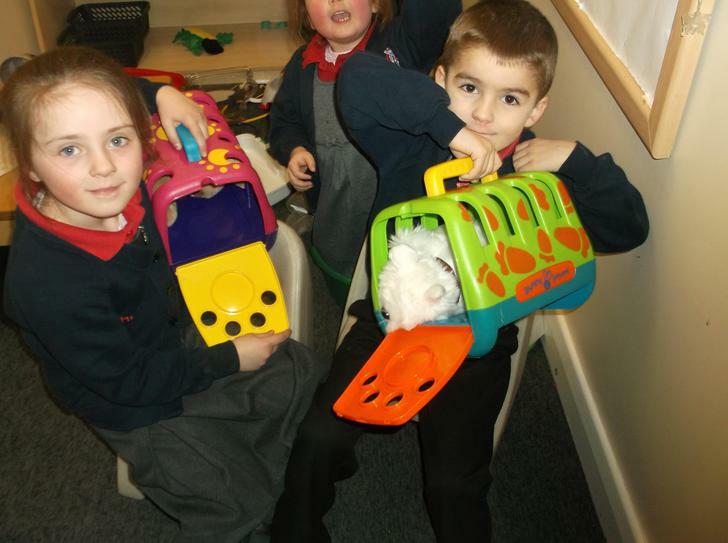 We moved in lots of different ways and explored working on different levels. We moved like different animals. Please remember if you haven't already done so to send your child into school with a PE kit for Monday. Next week is going to be all about dinosaurs. 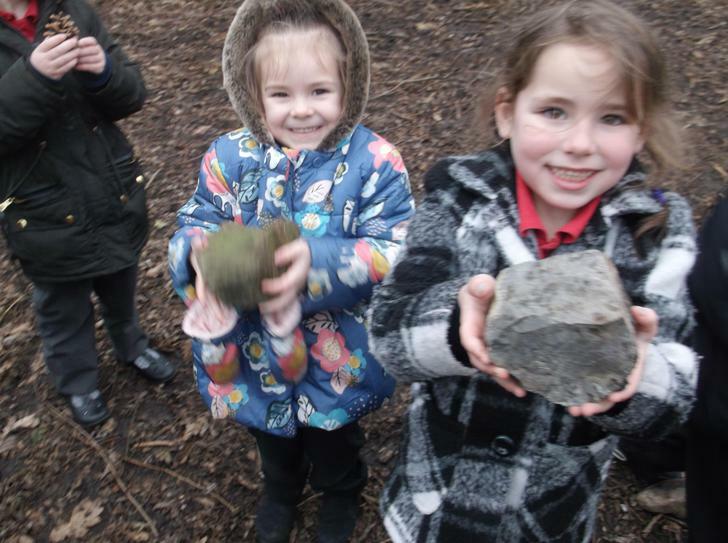 We are going to explore frozen dinosaur eggs, paint using dinosaur feet and learn more about pegasarus - keep watching this space! We hope that you have a great weekend. from staff and children in Reception. What a great week we have had. 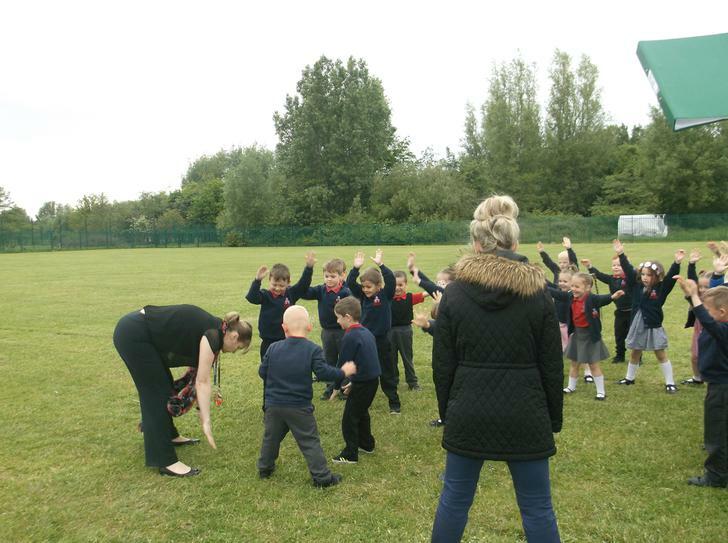 This week we have been busy learning all about our body though the story Funny Bones. We started the week off listening to the story, talking about the different parts of our body and learning about how important the skeleton is and what it does. Amazing! We learned so many new words such as skull, spine, ribs etc. 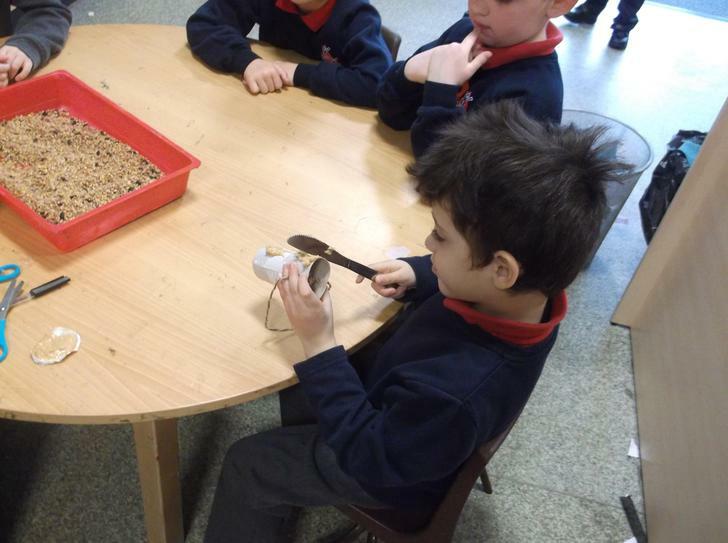 We looked at the different bones that make up our skeleton and used cotton buds to create our own interpretation. We had so much fun and learned such a lot. These are now on display in our reading corner so please take a minute to come and have a look at them! 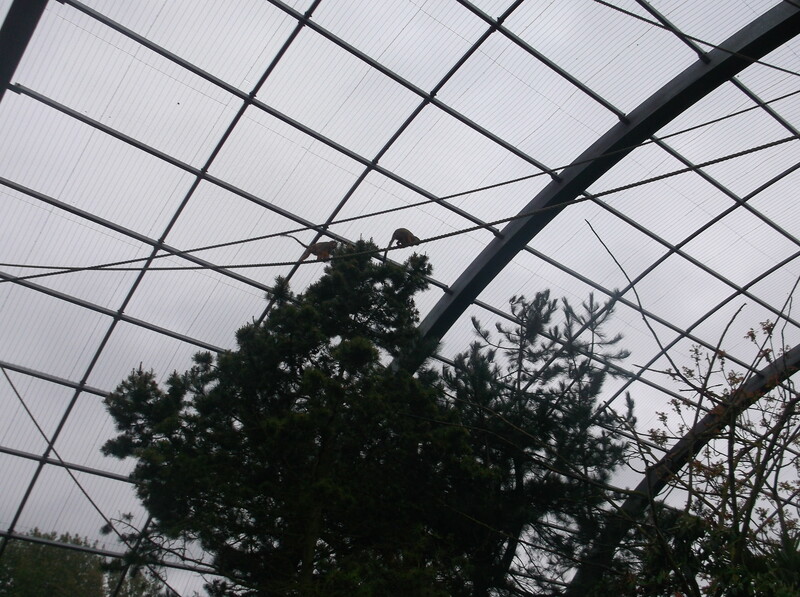 We also created skeletons on a large scale. We used different media to create our models and talked about the shape, length, and size. Here we are with our twig skeletons. 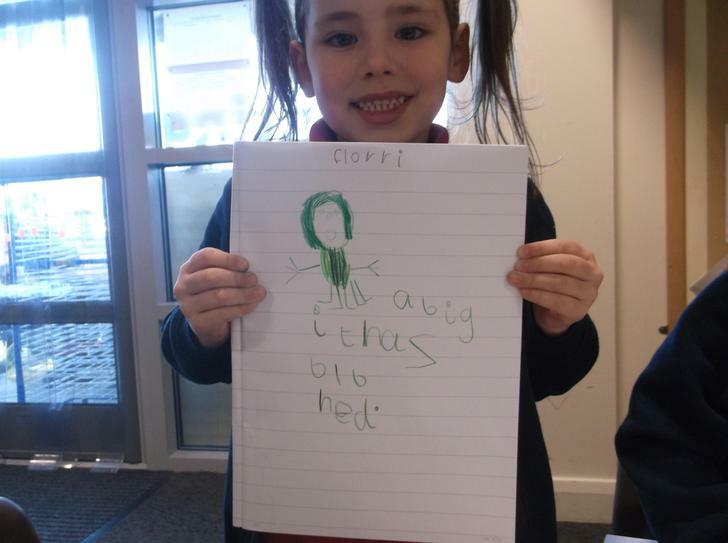 We also have been developing our writing skills. 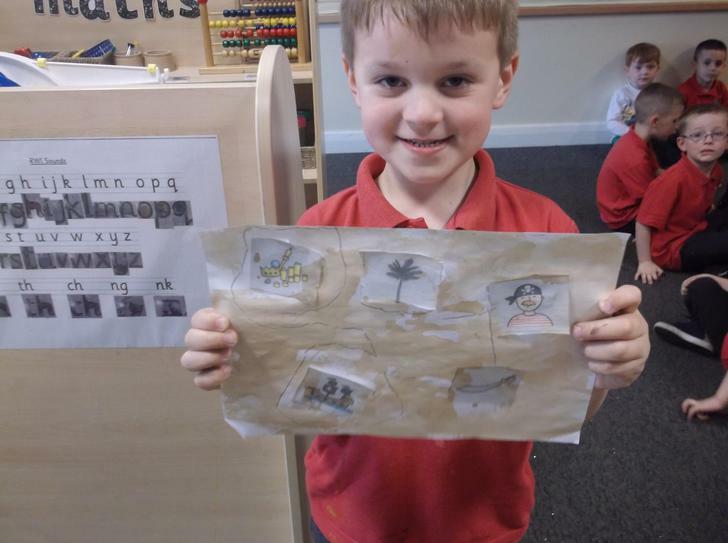 We talked about the different parts of the story and had a go at writing a recount, we talked about what happened in the beginning, middle and end and then added an illustration. We have been learning about authors and illustrators in our reading sessions and about how we can look at the blurb to find out information. All in all a great fun filled week of learning. Next week we are going to use the text Owl Babies as the focus of our learning. We have already transformed the classroom to reflect this and we are sure the children will be telling you all about what we have been learning about. Also, we intend to go out onto the ALPS area on Wednesday afternoon, so please make sure that your child has a coat and wellingtons or strong shoes on this day. We will send a reminder home closer to the time. We hope that you have a great weekend and we will see you all again on Monday morning! 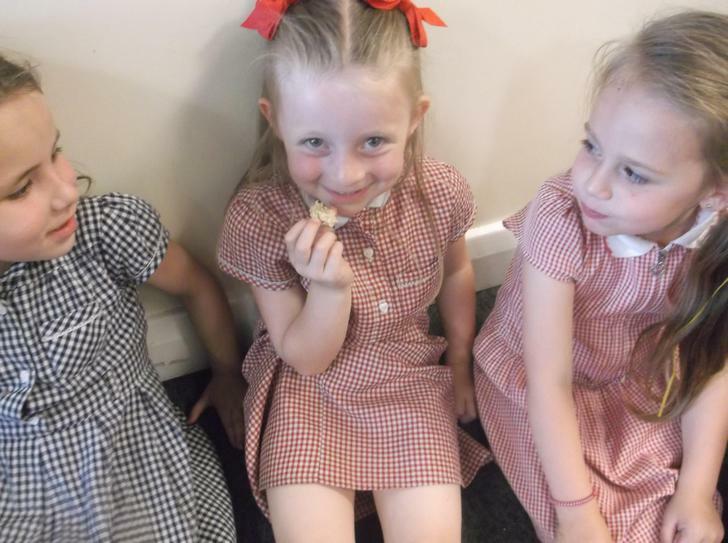 What a wonderful first full week we have had in Reception. 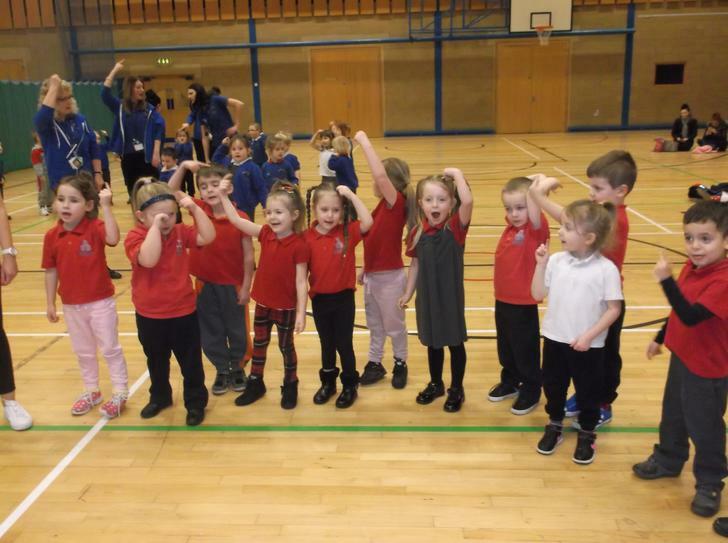 This week we have been getting to grips with the routines and how things work and the staff are very impressed with the way the children have taken everything in their stride. 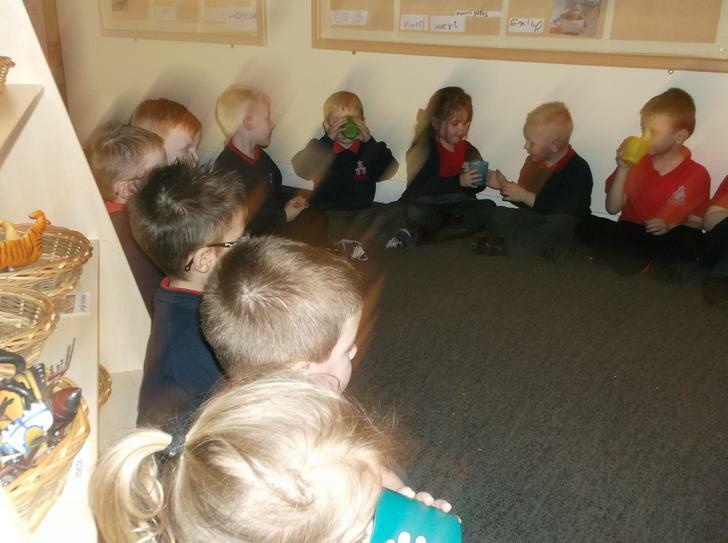 We have been thinking about the feelings that we had when we first came into Reception, we talked about feeling happy, sad and excited and why we felt this way. This is just a small selection of some of the children's thoughts and feelings. 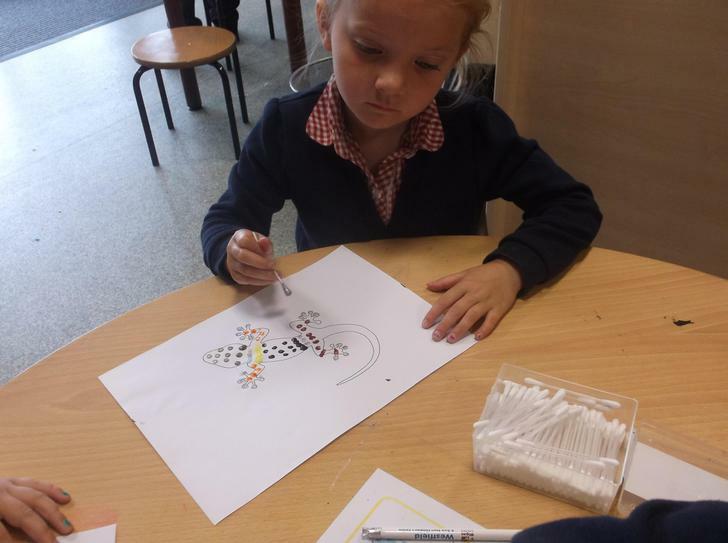 We have also had a great time showing off our number skills, we have played ladybird bingo and lots of other number based games and we have had such a good time. Thank you to all those parents who have brought in reading book bags so far, we ask that the bags are returned to school each Monday and that your child's reading record is signed so that we can see you have shared this book. To begin with, talk to your child about the pictures, ask questions, predict what might happen. Using the text, ask questions such as can you find any letters that are in your name? This will encourage your child to talk and use their imagination and make up their own stories, a really important pre-reading skill. Remember to come back and visit our blog again next week as we are having a fun filled, fact learning week linked to Funny Bones. 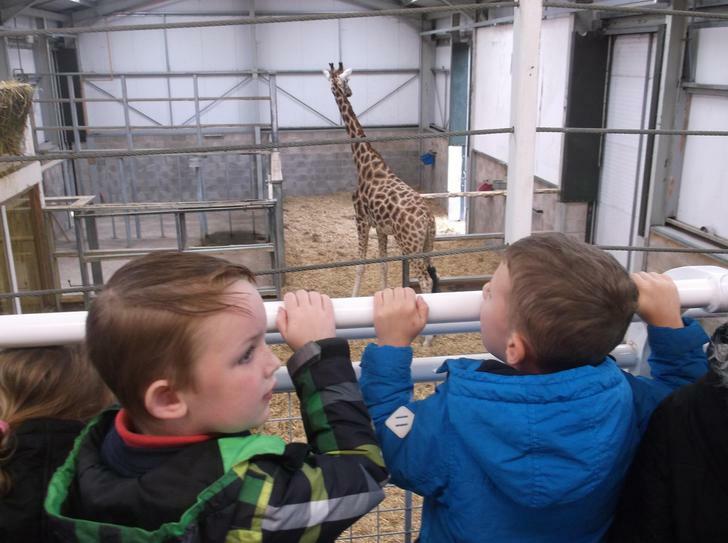 We have lots of great learning experiences planned and this is where you'll find out all about them. Welcome to Reception. Even though it has only be a short week, in fact just 2 days, we have settled in well and are beginning more familiar with the routines. This week we have been busy creating pictures about ourselves, using a mirror to study our features and paint to create them. Take a little look at the display we have created in class. You are more than welcome to come inside and take a look at your child's work on the wall. In fact, we would love you to! 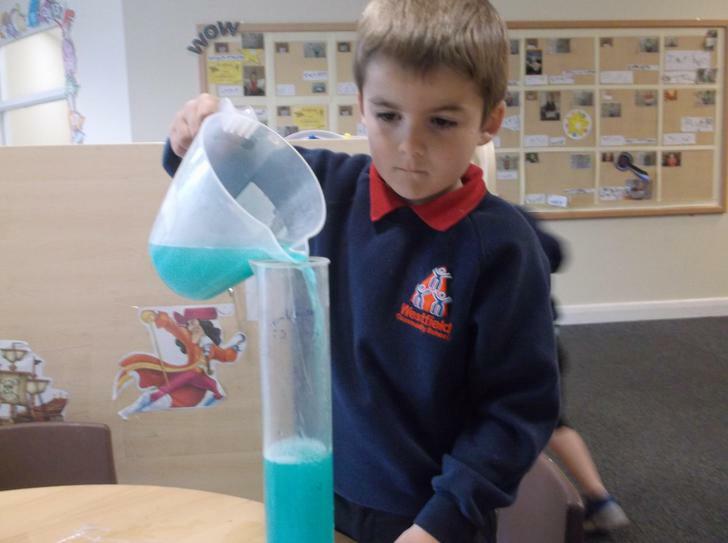 We have also started to explore colour and colour mixing and used cars and a ramp and set up an experiment to see what happened when 2 colours mix together. The results were very interesting. 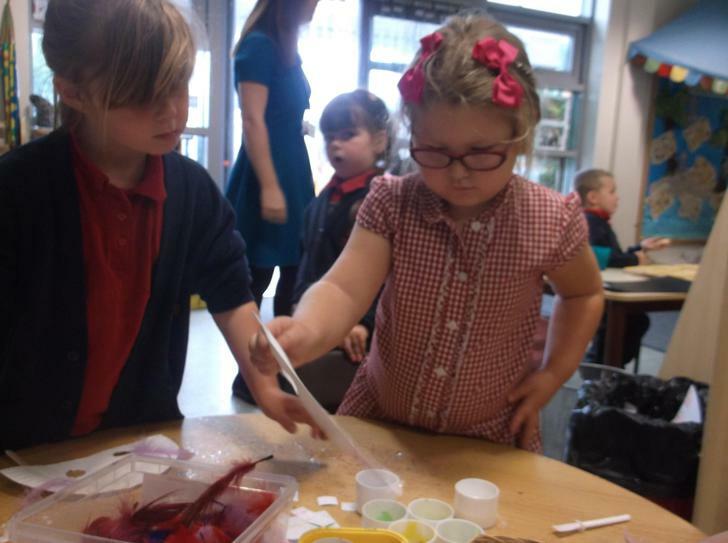 Here we are creating colours, it was so much fun and very messy! 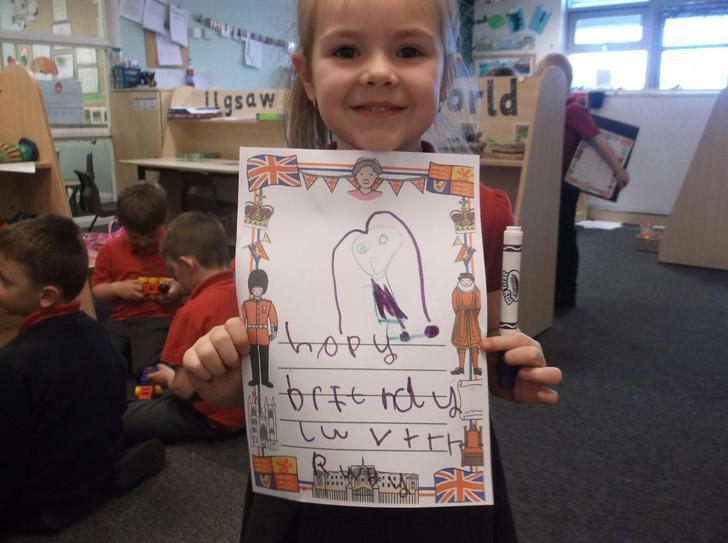 We have also started to think and learn about letters and sounds. 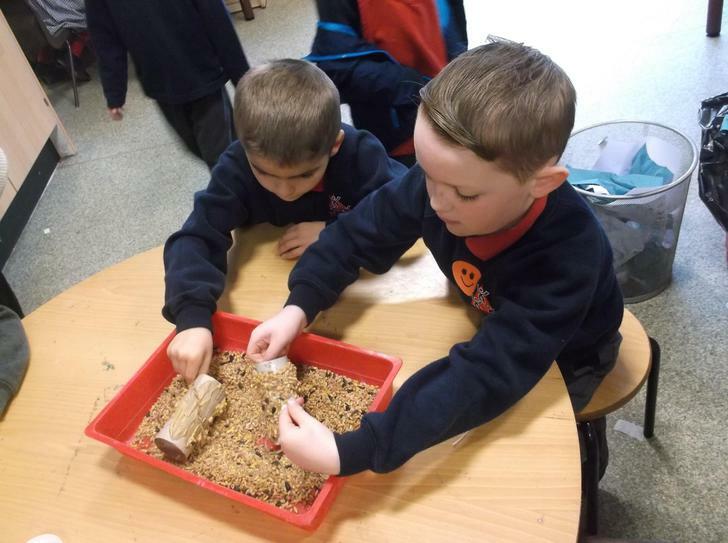 We thought about our names and the individual letters in it and then used sand to write our name. Here are some examples. Please come back and read our blog next Friday. 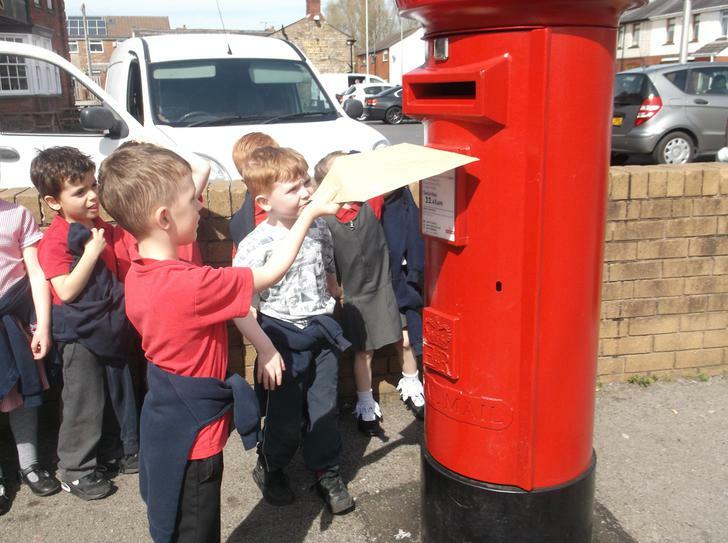 Every week we will be adding photographs and talking about the things we have been learning about in class so that you can talk to your child at home and share in their learning. Reading books need to be returned to school every Monday and please remember to sign your child's reading record so that we can share the progress they make. 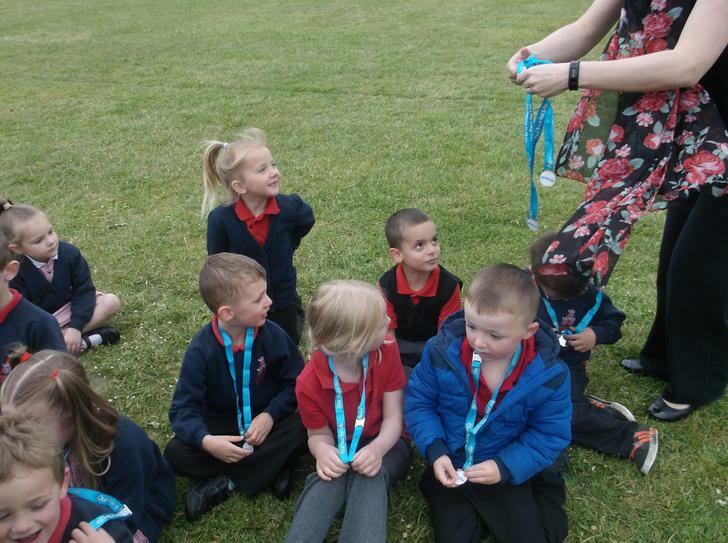 We are asking every child to have a PE kit in school as soon as possible and please make sure that every item clearly has your child's name in it. If you require any additional information please come and speak to a member of staff. We hope that you have a fantastic weekend and we can't wait to see you all again on Monday. Reception Staff.